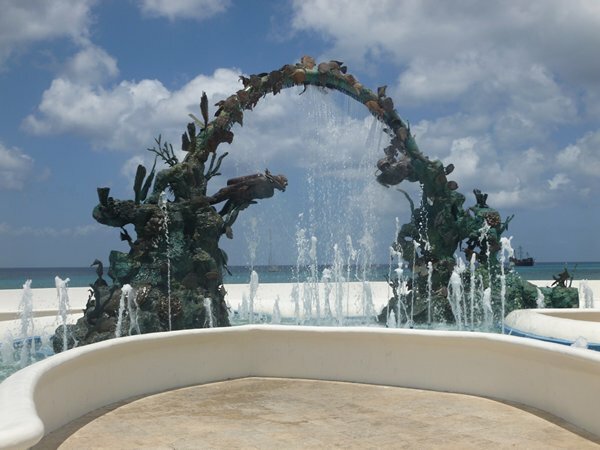 We arrived in Mexico on the beautiful island of Isla Mujeres, (the Island of Women) off the coast of Mexico and 5 miles east of the well-known holiday resort of Cancun, a concrete jungle looming on the horizon. The Island was tiny, 3 miles long and ½ a mile wide but a lovely little spot, if a teeny bit touristy, however it took us over 3 days to clear in to Mexico with all the bureaucracy here and we even had to apply to temporarily import the boat which took another day and a trip to Cancun, a legal requirement if you wanted to stay in Mexico for more than 5 days.All the boat documents, passports, crew list etc had to be supplied, original and 5 copies and for the importation certificate we had been warned by other cruisers that they had to be in colour, both sides and include a list of equipment on board together with serial numbers. What a nightmare and to cap it we had to pay for the import certificate in US dollars and with the exact money of $52.20. Fortunately we were able to scrape this together but had to clean the verdi-gris off the 20 one cent coins and then the customs lady had the cheek to refuse them, asking for dimes instead. Pity it was a good opportunity to get our own back. After we had officially cleared in we decided to treat ourselves to dinner ashore and had a magnificent dish of mariscos and had a lovely evening listening to a duo playing clarinet and classic guitar as we sat on the beach, watched the sun go down and picked our way through the large platter of mixed seafood. Both musicians were accomplished but the guitarist especially so and we were disappointed when they finished and went over to tell them so. Back to the boat then to get our heads down, only trouble being we couldn’t find the boat, it wasn’t where we had left it at anchor. After scouring the bay we eventually found it 30ft off the reef several hundred yards from where we had left it but it was still afloat, we leapt on and hauled up the dragging anchor and set off back across the bay to re-anchor. Next morning Mark a Canadian from a neighbouring boat came over and the whole story was revealed. 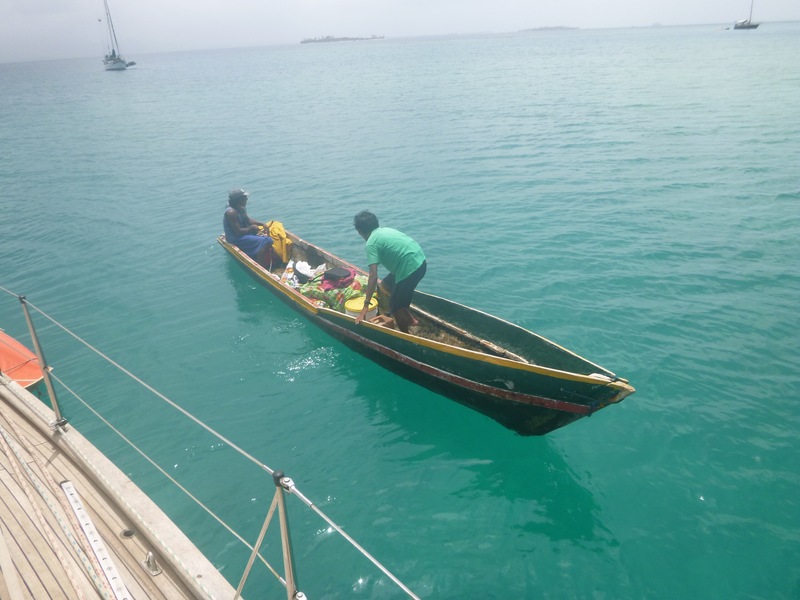 At 5.00pm the previous evening I had brought the Customs and health officials out to the boat for an inspection and all was well as I returned to shore with the officials in the dinghy. Shortly afterwards for no apparent reason the boat started to drag its anchor (we learned afterwards that the holding was poor in the bay and lots of boats dragged) and was headed for Mark’s boat, both he and Terry, another Canadian, boarded Romano and let out more chain which eventually held but not before Mark had to up anchor and move his boat out of the way. 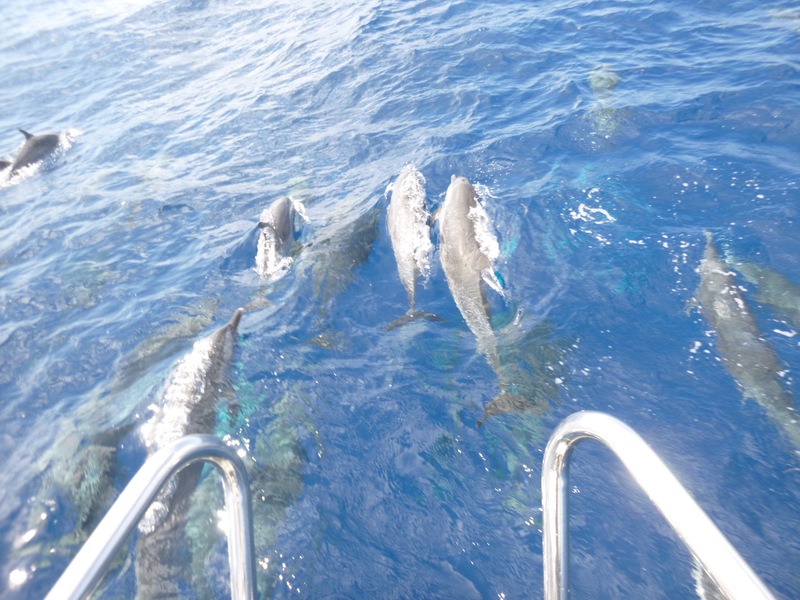 Our engine keys were locked inside so there was no way for them to manoeuvre the boat, Romano came to rest 30ft from the reef – a close thing and a valuable lesson. Needless to say we wanted to thank these guys and invited them over for drinks the following evening and met their lovely wives, Sandy and Linda and a great evening was spent enjoying their company. 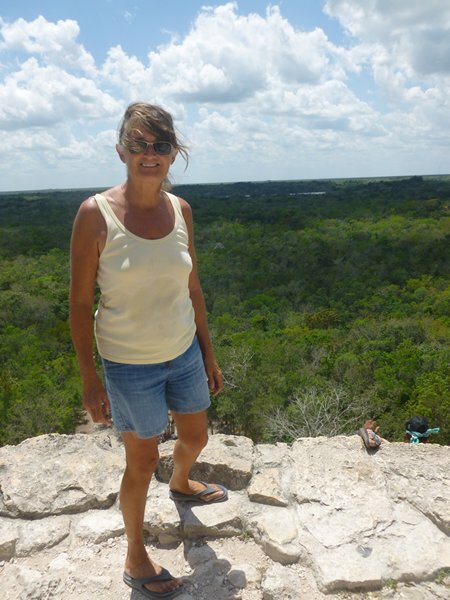 One little unexpected adventure came about on a day trip to Cancun when we were stopped by one of the ferry staff as we disembarked. 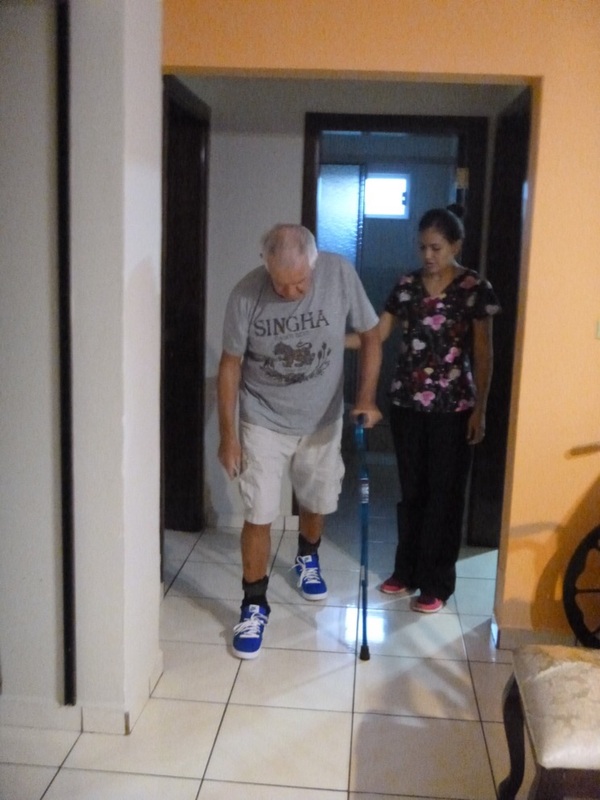 He managed to persuade Gill to attend a time share presentation in a nearby hotel and for doing this they would pay us 1500 pesos, about £75.00 and all we had to do was listen. 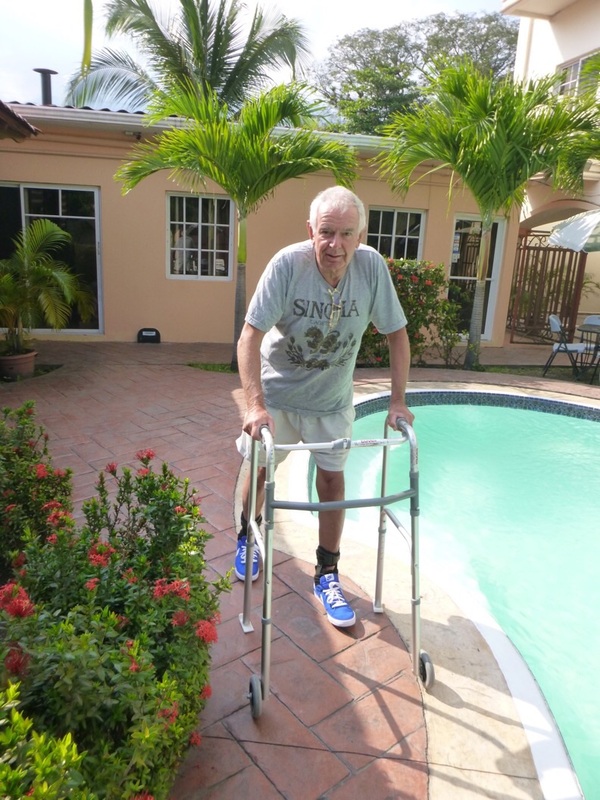 To qualify for the payment we had to be employed, staying in a hotel and be on a short stay holiday and if so he got his commission from the time share company. 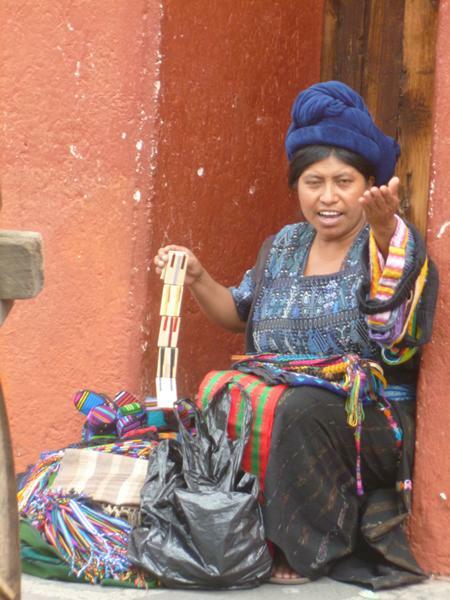 We agreed to go along and told our tale well enough but were then subjected to a 3 hour ordeal of hard selling. After fighting our way out through wave after wave of increasingly senior people we emerged with our hard earned £75.00 – not an experience to repeat. 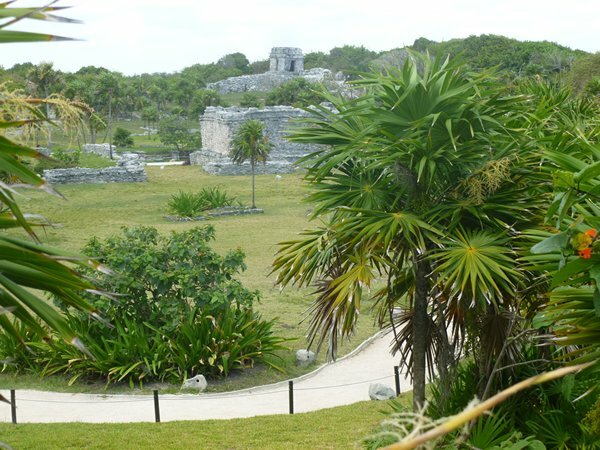 While in Mexico we were keen to travel inland from here and see some of the Mayan temples and cities for which Mexico is famed. 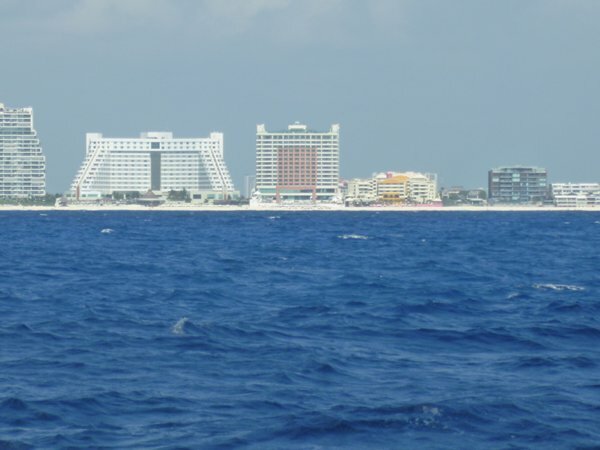 There are regular ferry services from the island to Cancun which take around 30 minutes and offer live music on passage, some good, some not so good. 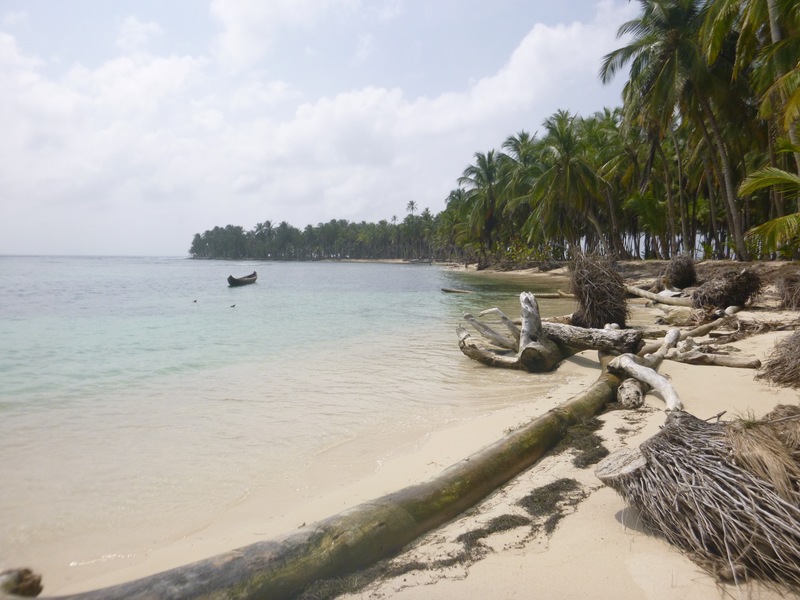 So when it came time to go off on our tour of the temples we put the boat in Paraiso Marina on the island where we had to tie up between four tree trunks driven into the ground which was a first for us and not the easiest to accomplish. So with peace of mind after our earlier experience, we hired a car for 4 days and set off into darkest Mexico in search of ancient ruins. We won’t go into detail but suffice to say they are all well worth a visit, stunning achievements in architecture, maths and astronomy in the period up to 800AD when inexplicably the civilisation went into decline. 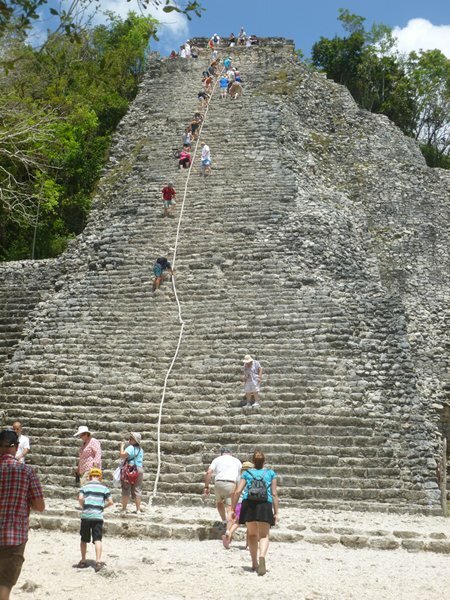 Unfortunately in Chitchen Itza everything was roped off to preserve what is now a world heritage site and we were unable to climb the steps to the top of the temple however in Coba we did have that chance and both of us climbed to the top to enjoy spectacular views over the jungle tree tops. 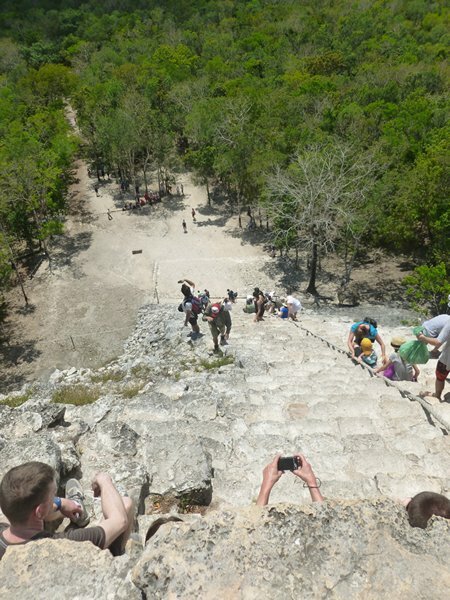 The descent down was more difficult on steps polished by thousands of feet and I don’t have a head for heights, Gill coped much better.We have included loads of photos to give you all some idea of the scale and quality of building in these cities. 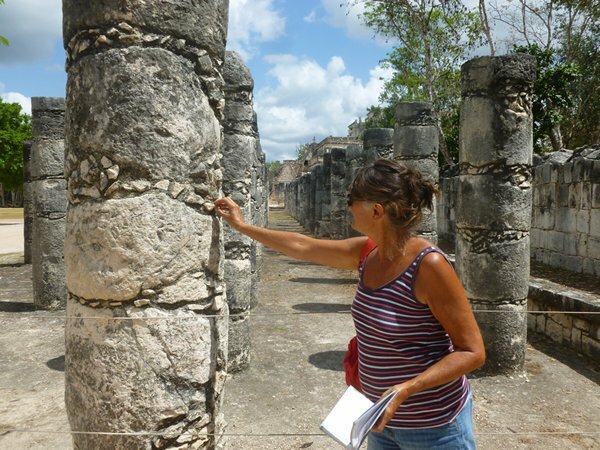 Gill exploring the Temple of Warriors – couldn’t find any! 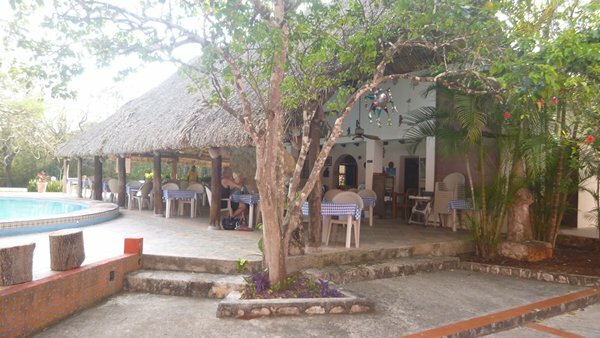 For our first two nights we stayed in a nice roadside hotel near Chitchen-Itza with pools and the cost including our accommodation, breakfast and 3 course dinner all was £50.00 per night for the two of us. 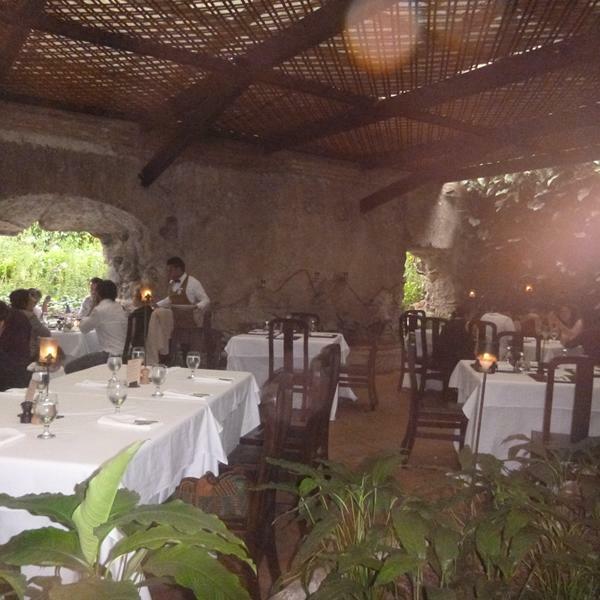 On the second night we stayed at an American style motel on the road between Coba and Tulum with no facilities but we did find a very good local restaurant nearby where we dined on seafood and delicious homemade fruit juices. On the last day of our mini tour we visited a friend of Gill’s – Manuela who she had first met while backpacking in Argentina a few years ago. Manuela, a larger than life character with many a story to tell, now runs a very nice hostel in Playa del Carmen, a holiday town just south of Cancun. Manuela put us up for the night and Gill drove a party of us from the hostel downtown to 5th Avenue for sightseeing, dinner and drinks. 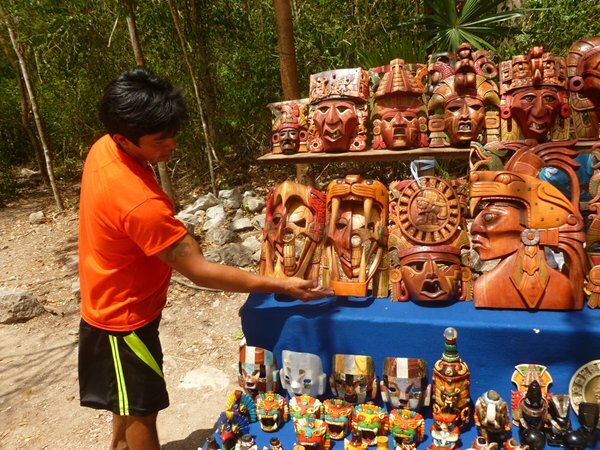 The people we met in Mexico were delightful and invariably helpful, it’s a lovely country, steeped in history and it was bewildering to see the range of goods for sale in the supermarket – back to having choice after Cuba’s limitations. 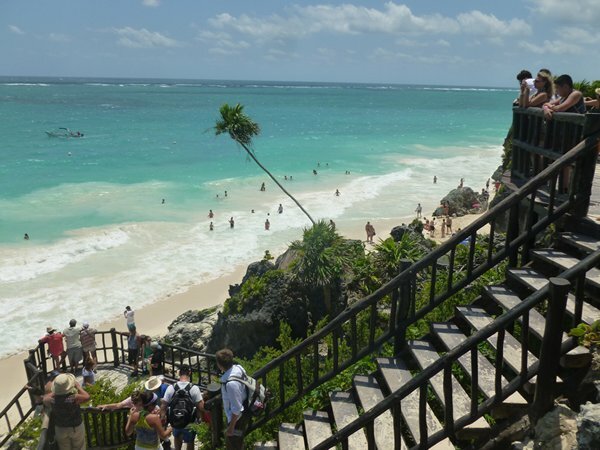 The following day we dropped of the car in Cancun, changed the boat import certificate with the Port Authority because they had issued us with the wrong one and took the ferry back to Isla Mujeres. After our week in the marina was up we headed out to anchor in the bay only to discover a northerly storm coming in so we moved the boat behind the ferry terminal to shelter from any north wind. In these storms the wind swings round very quickly from South to North as the wind picks up and the speed of change nearly caught us out we had intended to put out two anchors out but the storm hit us quicker than expected and we could only hope that our one anchor would hold in 55 knot winds. In driving rain and a full gale which came up in a couple of minutes from calm, we had no choice but to set the second anchor. We went below wet and bedraggled and hoped for the best. As it turned out we were well protected by the shore and the twin anchors held well. In the morning the winds abated, the sky cleared and all was well again. 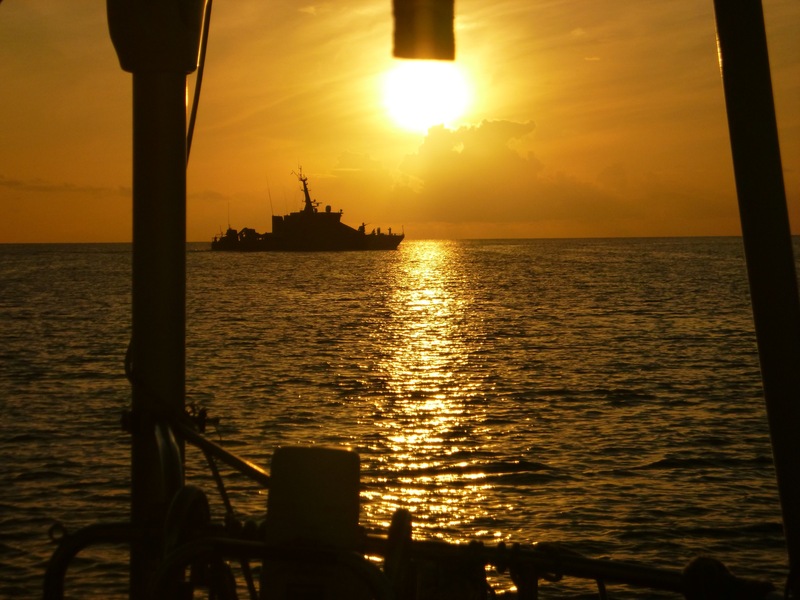 After a few days of mixing with our new friends we decided to move on and check the boat and crew out of Mexico in Isla Mujeres, this to save further frustration in the southern ports where it would have been difficult for us to get in because of our depth. 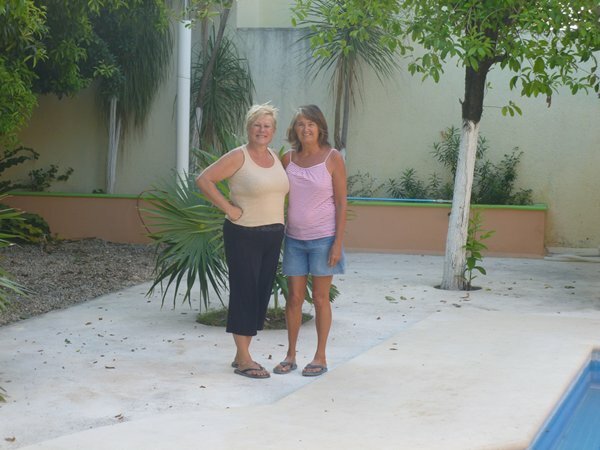 The process was much slicker and less expensive but clearing out meant we would be unable to go ashore again in Mexico and we still had 200 miles to cover to Belize. Our next port of call was Puerto Morelos where we picked up a mooring buoy next to Quetico an Island Packet owned by yet another Canadian couple, Rob and Kathy who we had met in Los Morros on our last day in Cuba and who were also headed for the Rio Dulce in Guatemala for the hurricane season. 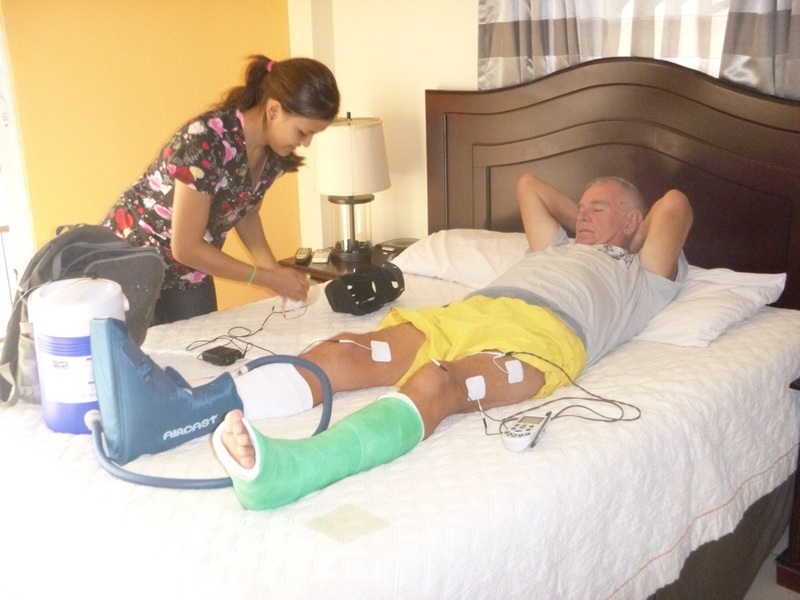 I had developed a severe toothache so we needed to find a dentist fairly soon and managed to book one in Cozumel at 10.00 am the following day on the internet. Off we went hoping all would work out and it wouldn’t resemble a medieval torture chamber. 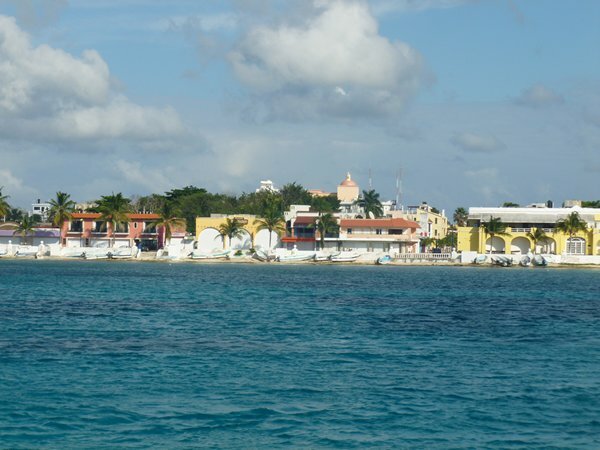 We arrived on the island and dropped anchored in a bay with three other local boats near the ferry terminal which linked the mainland at Playa del Carmen. After some hunting on foot we found the dental practise in part of a hospital. My worst fears were quashed, the service was superb, the facilities excellent and the cost, a fraction of the UK, it couldn’t have been better. However the full treatment was going to take at least 10 days and strictly speaking we were illegal immigrants so I opted for a course of antibiotics and copies of my x-rays for the next dentist along the trail. 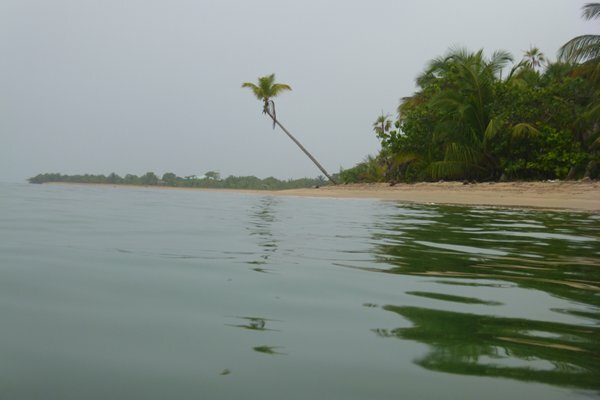 In the morning we sailed down to Bahia Espiritu Sancto a huge inland bay protected by a reef and anchored in the middle, miles from anywhere and a very strange experience. 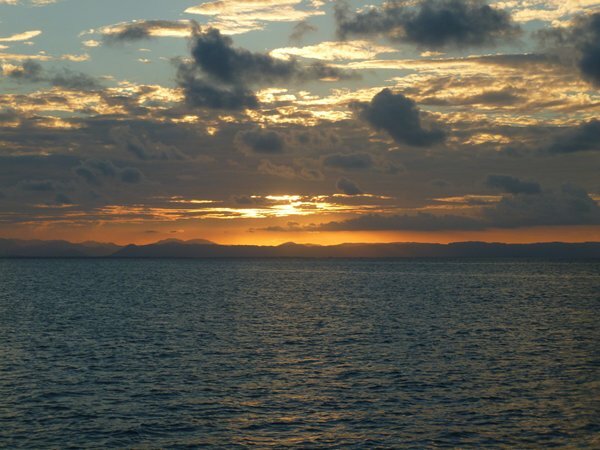 Then it was on to Chinchorro Bank a large reef structure about 30 miles offshore where we anchored in the north end through a gap for another unusual night in the middle of the sea but perfectly calm and protected by the reef. 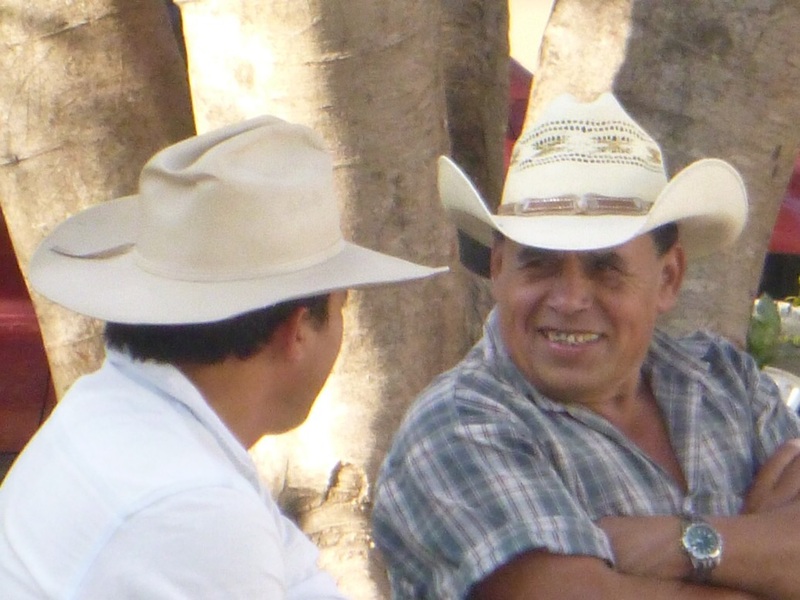 We were boarded the next morning by an armed Mexican Navy patrol who wanted to see our papers and took details of who we were and where we were headed but all in a very courteous way. We declared we were “on passage” and as long as you don’t go ashore after you have checked out, the authorities accept a boat passing through and crew resting at anchor! 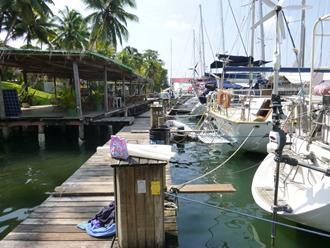 We left them to head south on a wonderful overnight sail in ideal wind conditions down to Belize City. 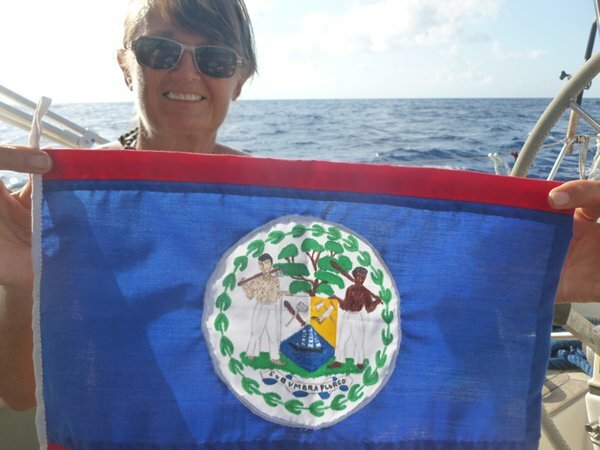 In fact the wind was so good we had to slow the boat down to arrive in Belize in daylight. 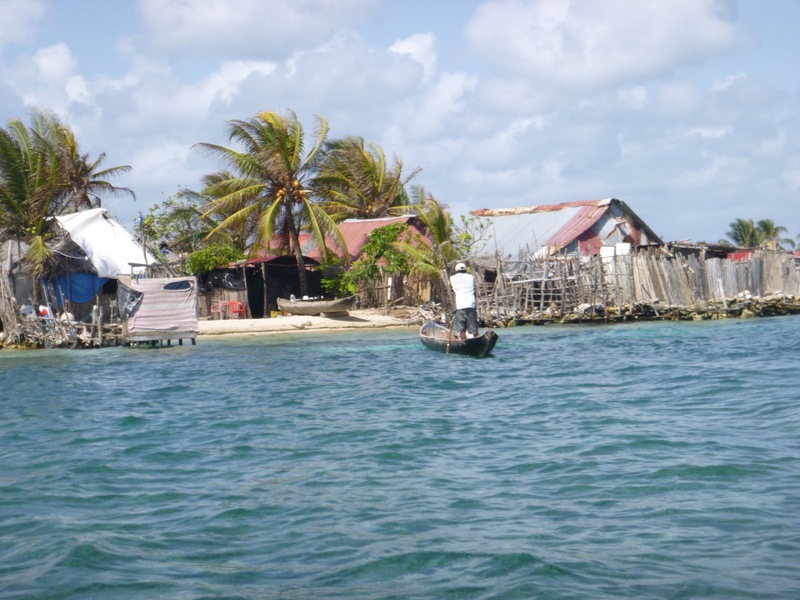 We failed however to get into Belize to “clear in” as our draft was too deep to enter their marinas and it was too rough to launch the dinghy to go ashore so we headed farther south to the next port – Dangriga. 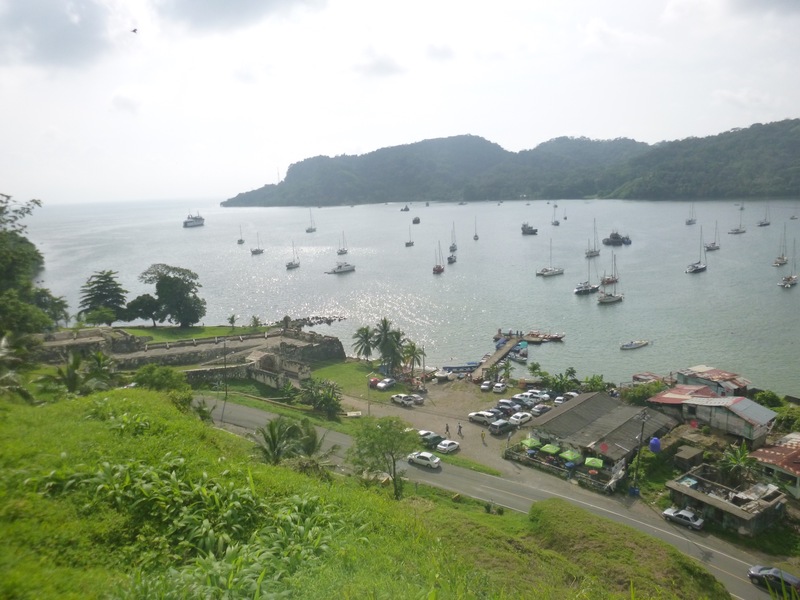 We found out on the way that it was Easter and everything was closed anyway– it’s like that on a boat, days and dates don’t mean anything and we had no idea so we anchored off Garbutt cayes for a couple of days and bought fish off the fisherman and swam and did jobs on the boat. 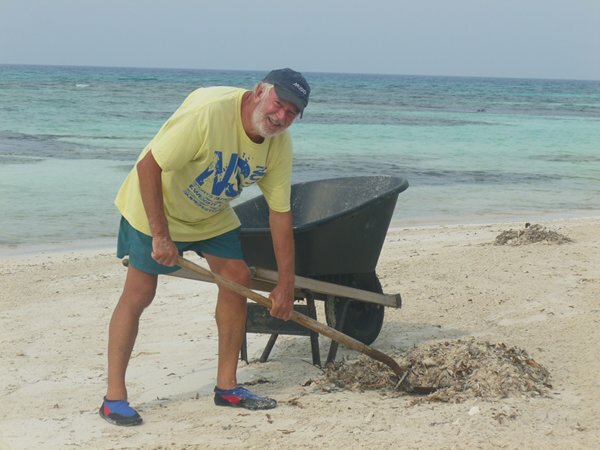 Gill went ashore to explore one of the islands and found it covered in thousands of conch shells with a small stilted house and a beach garden created by the fisherman who lived there by grinding the broken coral to a fine powder, believe it or not to create the sand – obviously has a lot of time on his hands! 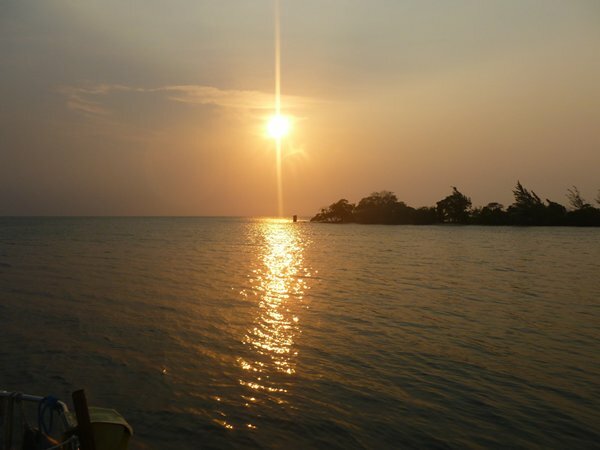 Sunset over Dangriga where we checked in. 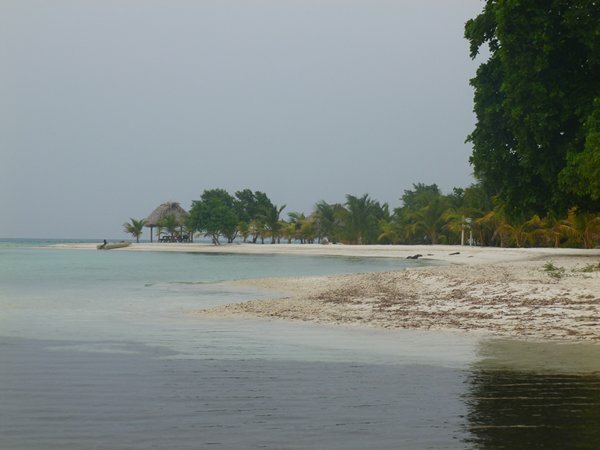 One of the features of Belize is its barrier reef which extends for over 100 miles; inside the reef is shallow shoal water with lots of coral heads which make for challenging navigation especially with a 7ft draft. 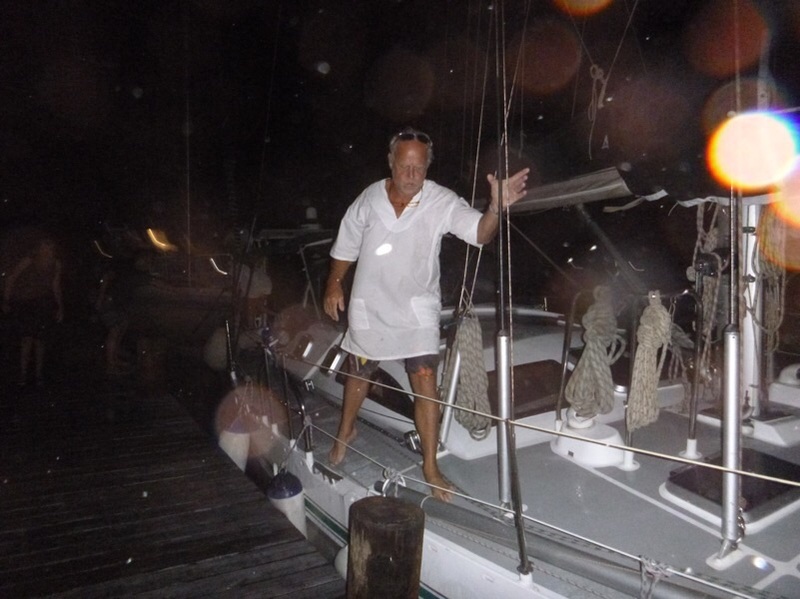 We ran aground many times in our travels through Belize but somehow always managed to get off unscathed. For this reason and strong winds to boot, we were unable to get into Belize City to clear in through customs and immigration and had to anchor off Dangriga, the next town going south, in an exposed roadstead where the anchor dragged one night – it all keeps life interesting and us on our toes! 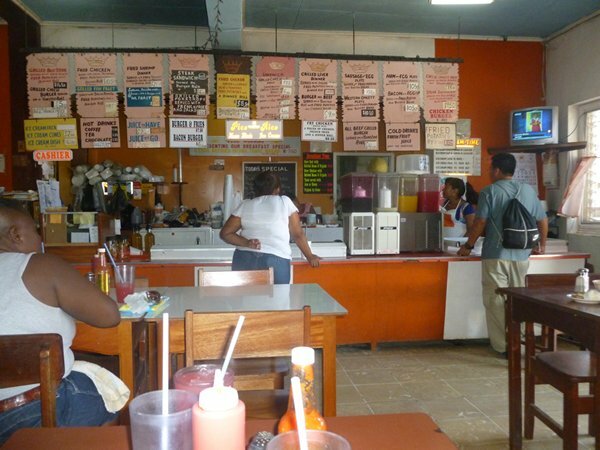 Dangriga is an unpretentious one street town and was a favourite with Gill probably because of a wonderful little café we found which not only served excellent food but also the most delicious homemade soursop ice-cream. A meal for two here including fresh fruit drinks and ice-cream cost us £7.00. There were also seven hardware stores in this little town and we were able to get much needed boat stuff at a fraction of the cost of a chandlery. 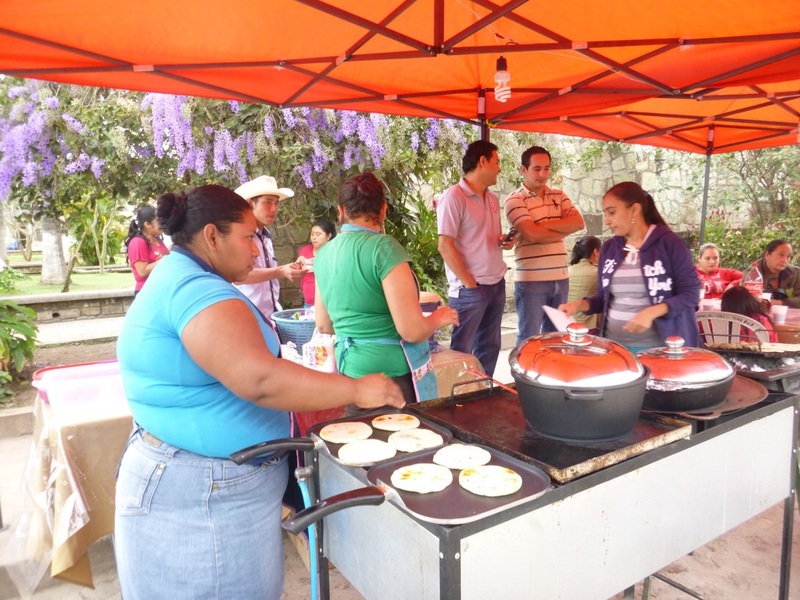 One of the key items was finding a future means of cooking, as filling our European gas bottles which we had last managed to do in Haiti was impossible in either Mexico or Belize and our on-board experiment with a charcoal barbeque was not to be repeated. 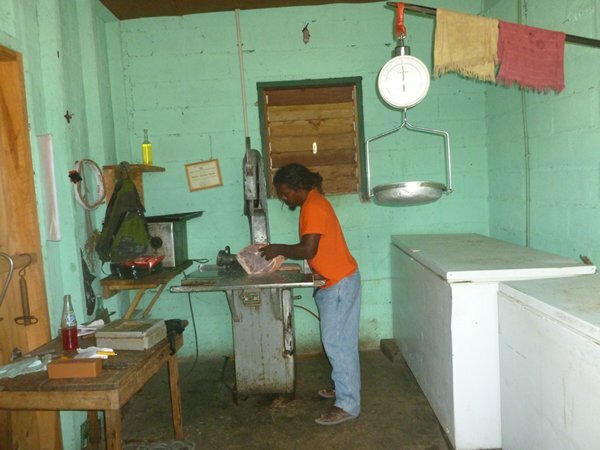 Belizeans use a US propane system with completely different fittings and gas bottles. 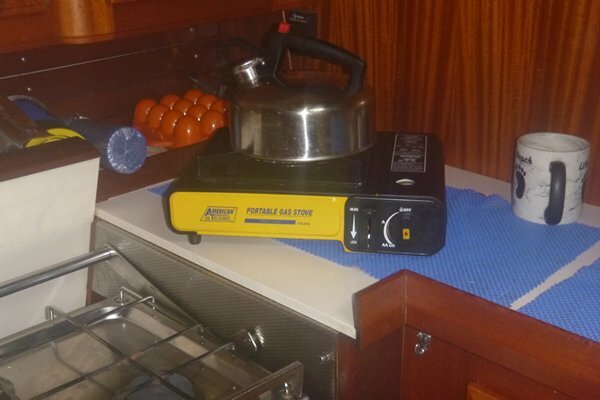 However, in one of these little stores we found a little one ring gas cooker and the matching gas cylinders in another – problem solved for £25.00. We have cooked our meals and made our tea on this little one ring stove for the last month. 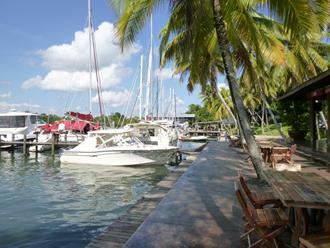 When we get to the Rio Dulce where there are extensive yachting facilities we will change our gas system to the US propane standard and should have no further problems. 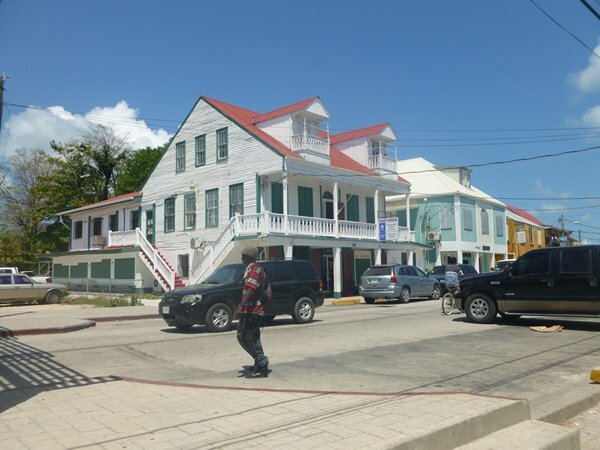 While we were in Dangriga Gill took the opportunity of a day visit to Belize City on the local bus service, while I watched the boat and did a few more jobs. 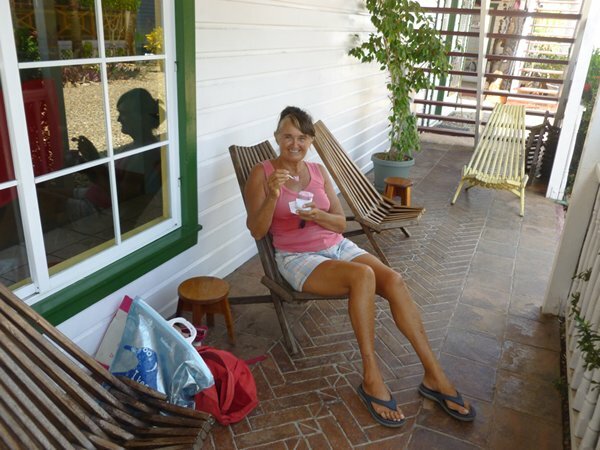 – Gill’s account “Six hours on a hot, rickety old bus, sharing (or trying to) a torn plastic seat with an often very large person is probably not everyone’s idea of a good day out, but it was fun and interesting. 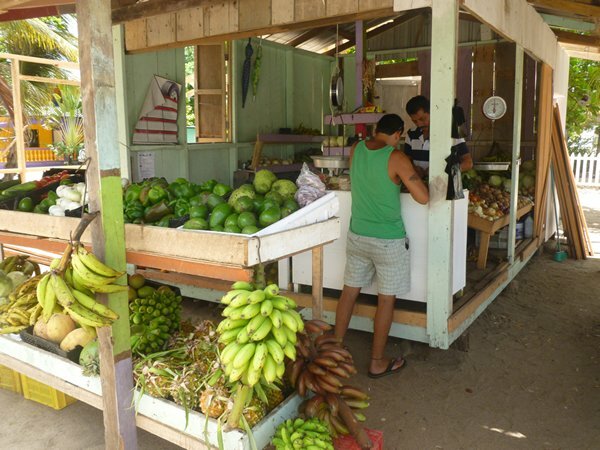 I knew that Belize City wasn’t the great metropolis but I’d read that the scenery between Dangriga and Belmopan (the uninspiring purpose-built capital) was stunning – and it was – towering mountains, statuesque trees, rivers and vast orange orchards and pineapple plantations. 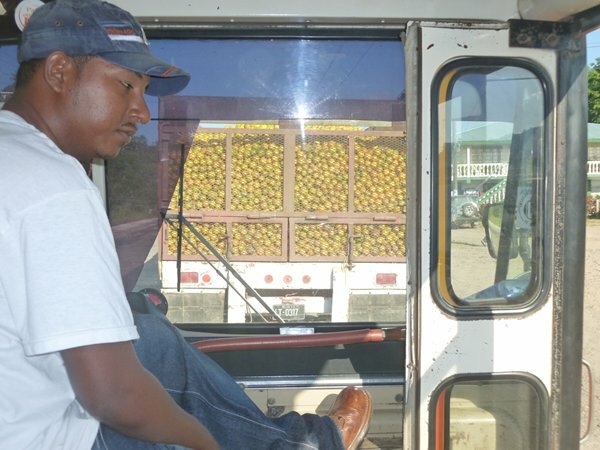 We were slowed many times by the road trains of oranges (just imagine an orange juice accident – very sticky!) 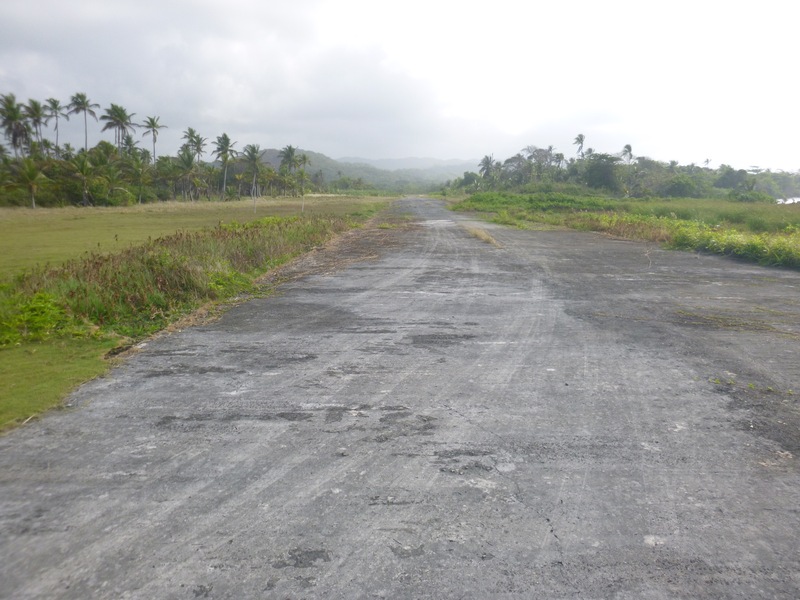 The journey from Belmopan down to the coast and Belize City became less interesting by the mile until the land was virtually reclaimed swamp. 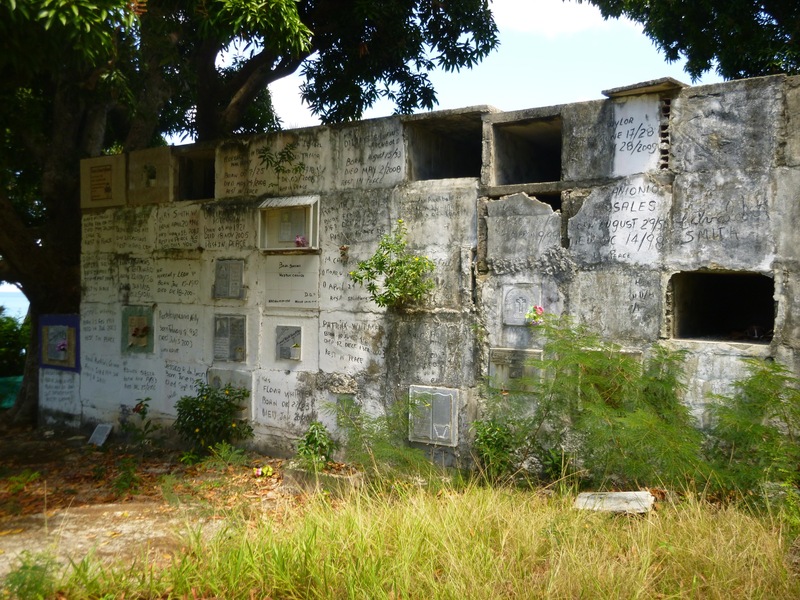 One sight I shall not forget though was the old cemetery which we drove through the middle of – and I mean through the middle – with the road at one point encircling a central reservation of gravestones – very bizarre! Belize City was all I expected – hot, dusty and fairly nondescript, full of the usual backstreet sellers of all sorts (many Chinese) and hundreds of aimlessly wandering tourists off of the cruise ships anchored offshore with little to interest them once they have been led through the usual assortment of local arts and crafts. I went in search of Fort George but disappointingly only found a new Radisson Hotel. Whilst in search of a bookshop, I was kindly assisted by a helpful young Rastafarian called Will who insisted on being my guide and taking me to the Library (well I did say I was looking for a book!) We parted as firm friends and he returned to his street corner with enough for the day’s lunch and I collapsed in an air conditioned café. 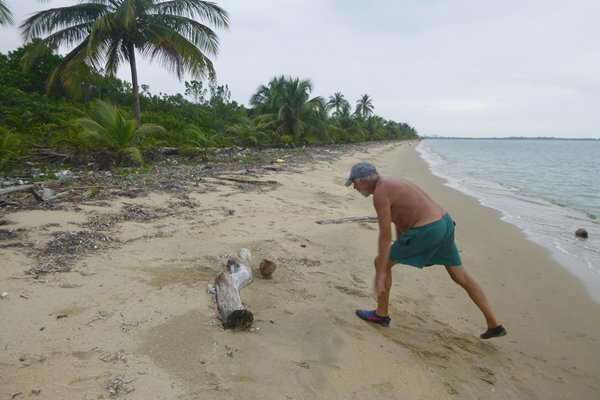 After a further three hours of shake, rattle and roll, I ended up on the beach back in Dangriga trying to attract Mike’s attention back on the boat – short of swimming, I thought I was going to be spending the night ashore, but a local fisherman came to my rescue and transported me amongst his nets and anchors back to Romano – adventures all the way! From Dangriga we set off for the reef and the Cays (pronounced keys) stopping off at a number of these tiny islands (some no more than 400 yards long and 100 yards wide), where we could get in close enough to anchor. 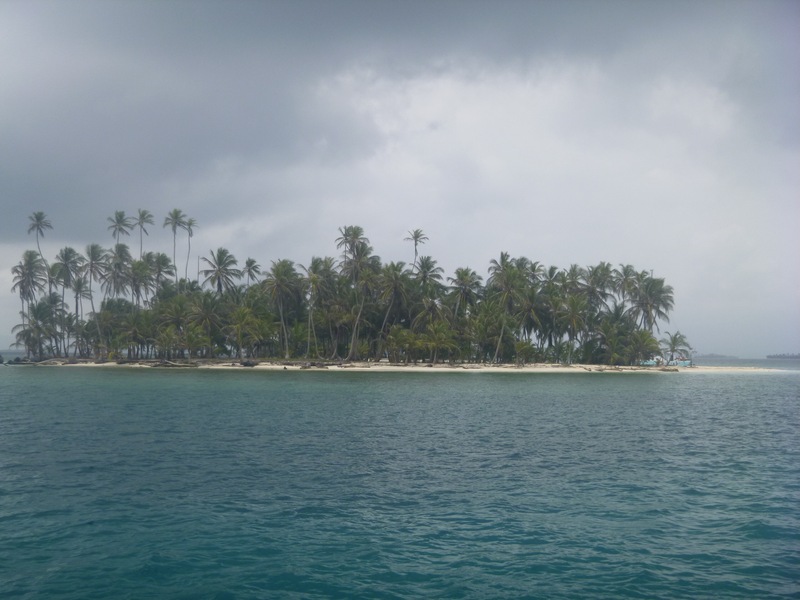 These islands were a pleasant change from the mangrove covered islands we had visited in Cuba and Mexico and were more like everyone’s idea of a desert island, complete with coconut palms and white sandy beaches. What the guide books don’t tell you is that you share them with mosquitoes and tiny midges that eat you alive if you are not covered in insect repellent. 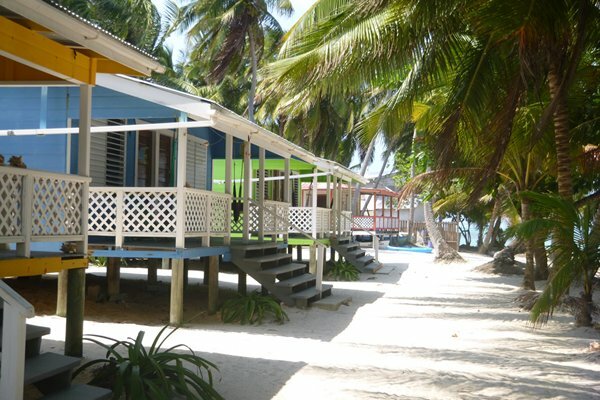 We visited places like Tobacco Cay and South Water Cay which had restaurants and cabins for accommodation. 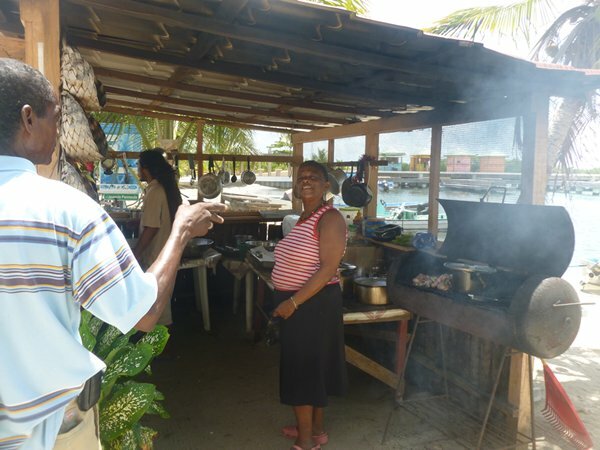 We booked into a restaurant in South Water Cay through a lady we met on the beach and duly turned up to eat at 6.30 as requested, ordered drinks and sat at a table. The waiter came over and told us we had to pre-order to eat, we explained we had arranged it with “Barbara”. 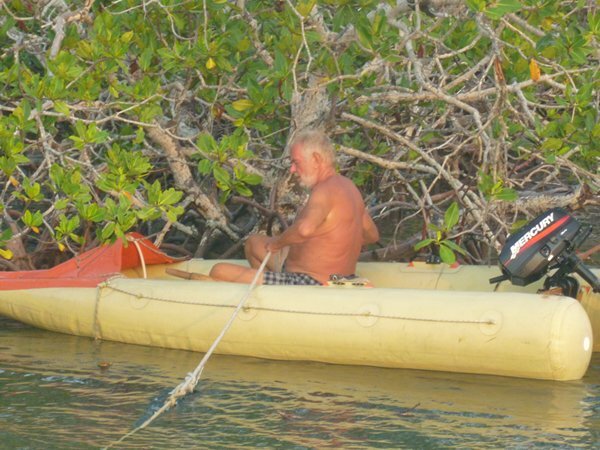 He politely informed us we were in the wrong place and her restaurant was at the other end of the island so we sheepishly finished our drinks and got back in the dinghy to drive the 300 yards to Barbara’s place. 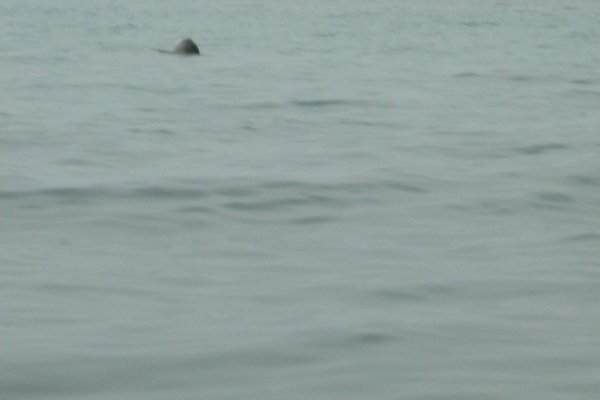 She was there to meet us off the jetty, concerned that our meal was cooked and having seen us go over to the “competition”, who we later found out were not on speaking terms and that they had divided the island with a 10ft wire fence to keep the two apart, very strange! We enjoyed our prawns in garlic but we were the only people in the restaurant, so got lots of attention from Barbara and the staff. 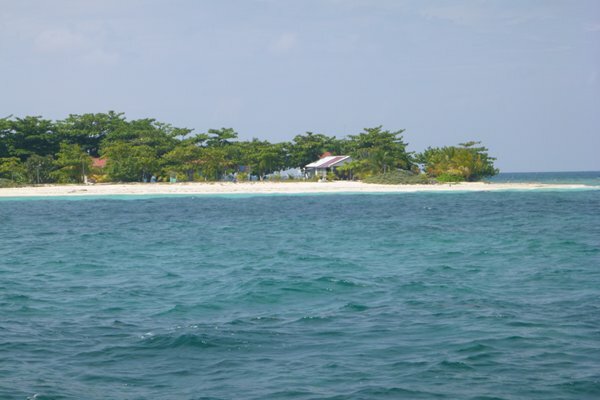 We also visited a lovely little private island called Moho and anchored off the beach. 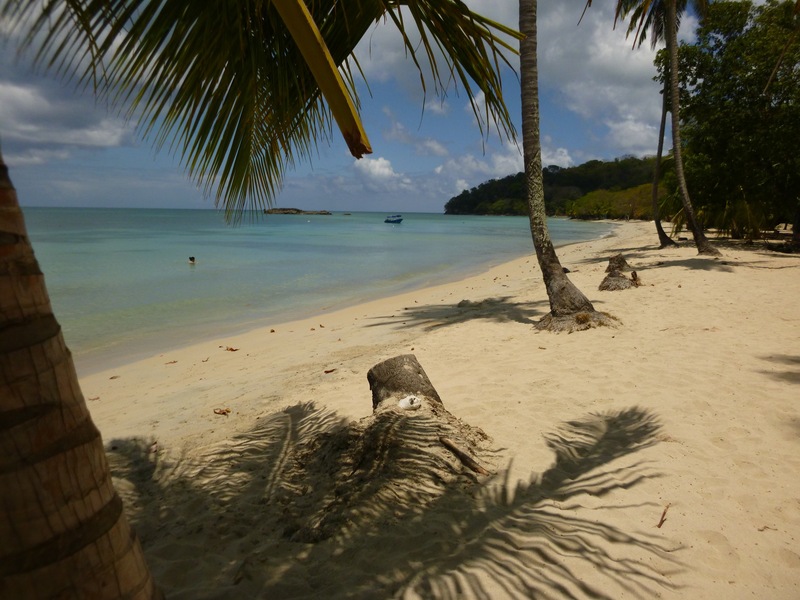 We could see a man raking the beach and went ashore in the dinghy to ask if we could look around. 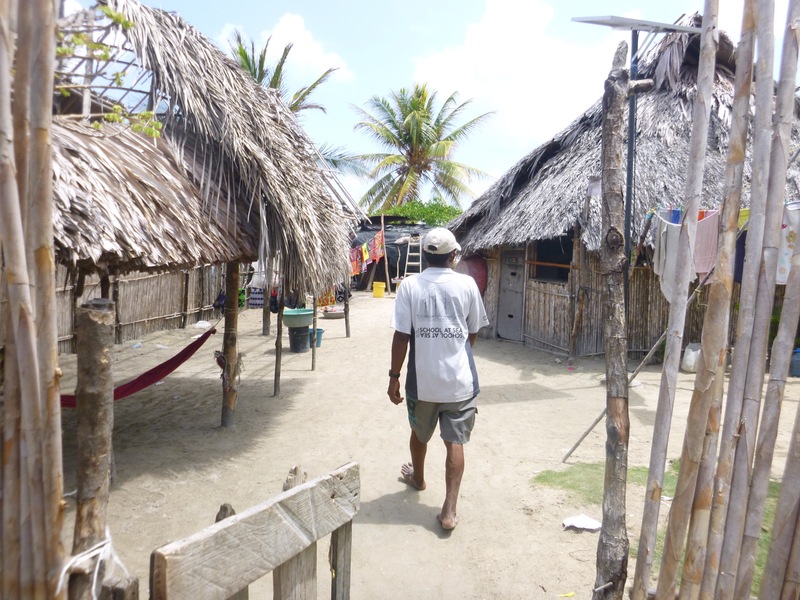 He turned out to be Pedro, a Guatemalan who only spoke Spanish and who lived alone full time on this remote desert island as a caretaker for the owner on the mainland. 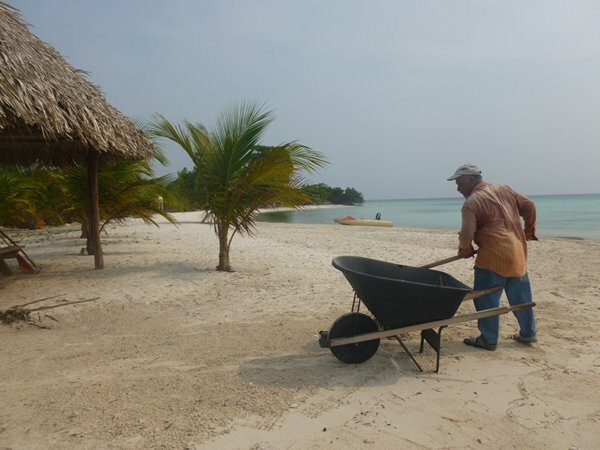 Every day he raked the beach and filled his wheelbarrow in the company of his bouncy Labrador pup, “Princess”. 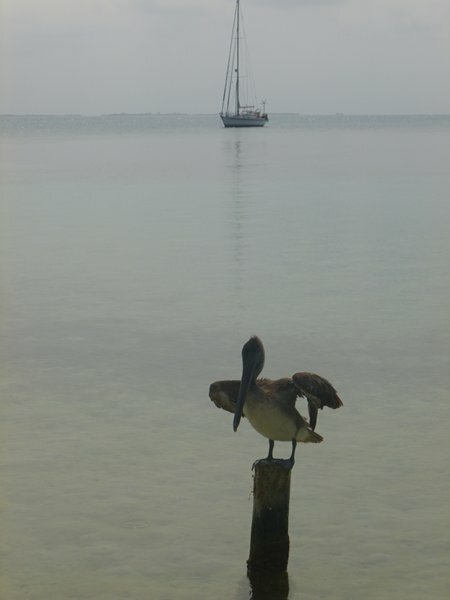 He loved the life and the solitude only occasionally being visited by cruisers or kayakers. 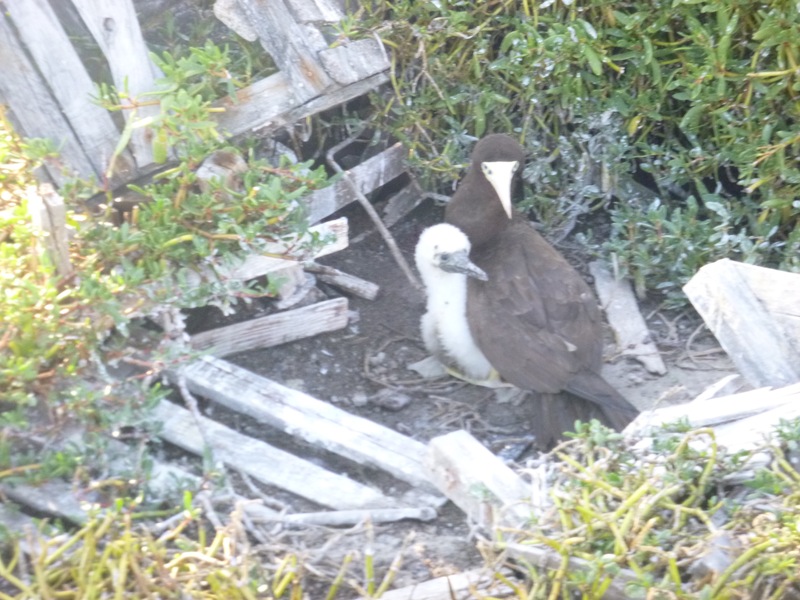 With his permission we toured the island, the other side of which was covered in rubbish, plastic everywhere. 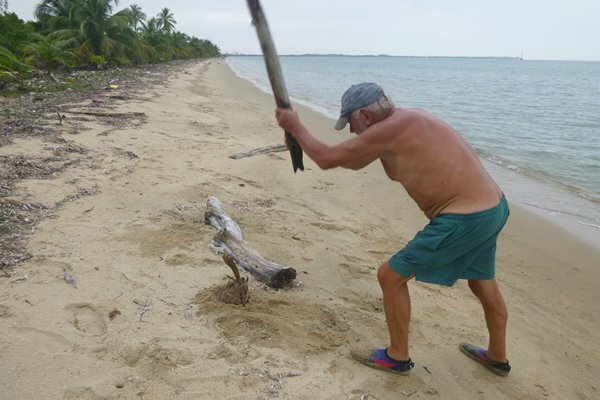 He only swept the beach on the inhabited side of the island. 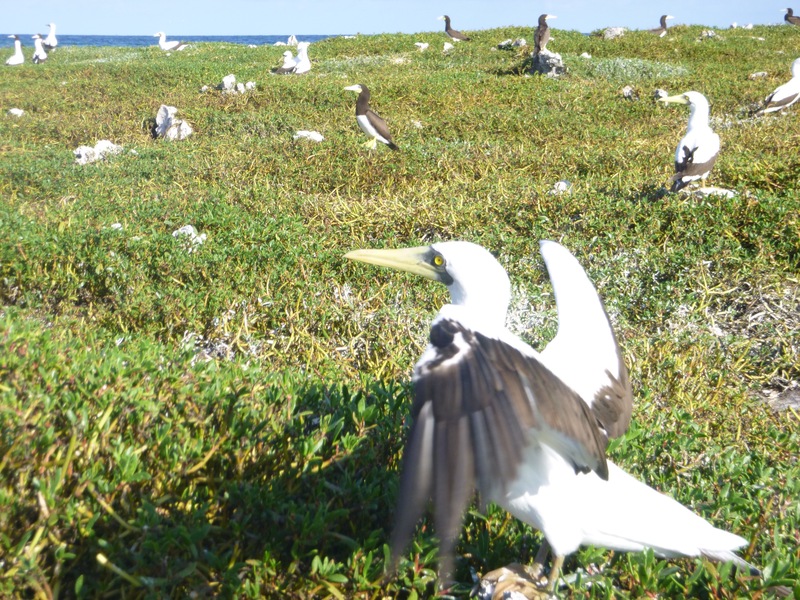 Coming south we visited Pelican Cays which form a ring of islands with a deep centre. We tried to anchor close to the edge of the inside circle but the ground fell away so quickly our anchor just kept dropping off into the depths. 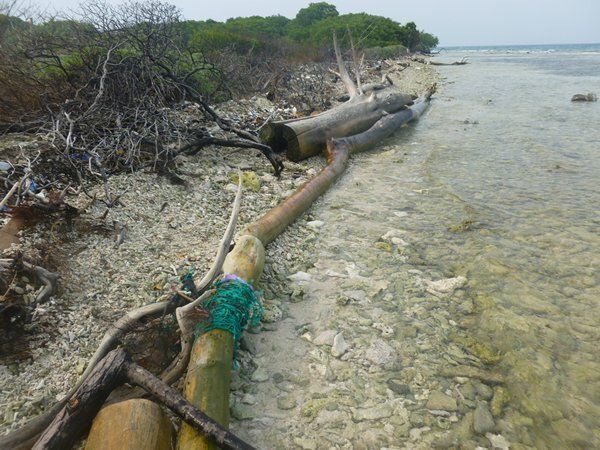 After several attempts we found a little mangrove island near the centre where it was so deep close in we could sail right up to the mangroves and tie up to them by swimming the last few yards. 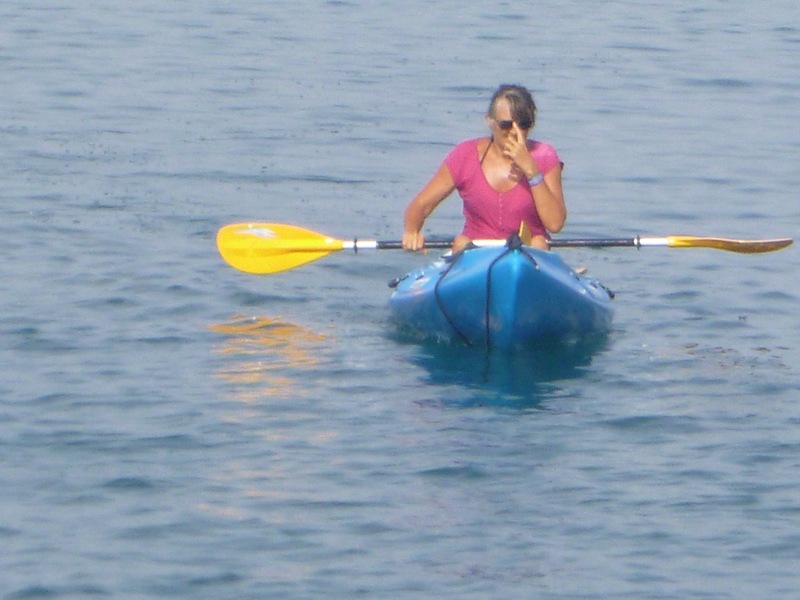 Having battled through the mangroves I decided the next line would be easier in the dinghy. 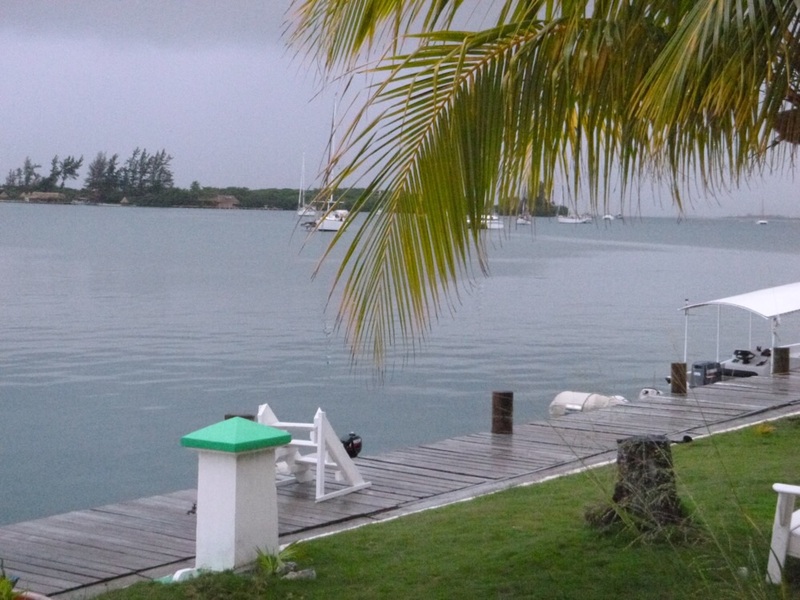 The boat was fine and we had a very peaceful night so close in while the wind blew over the top of the island. 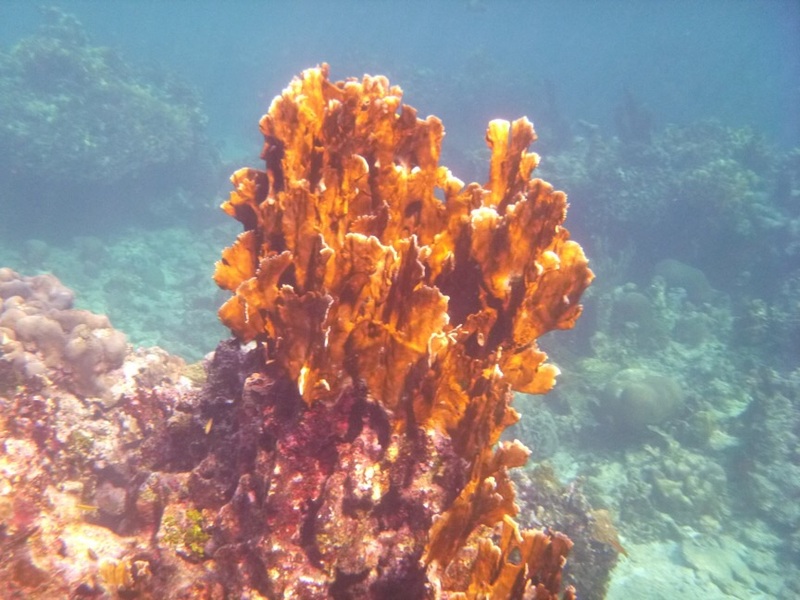 In most of the islands we snorkelled out on the reefs but were mostly disappointed by the lack of fish life and the best places were out on the reef itself. One such place was Carrie Bow Cay and here the water was so clear you could see 100ft around you with wonderful coral formations both soft and hard. 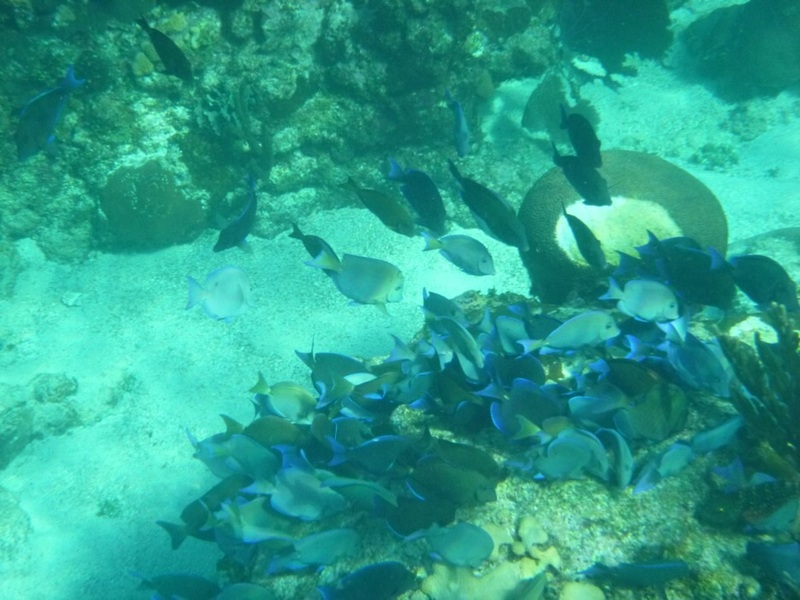 We could spend hours just swimming around watching the reef at work. 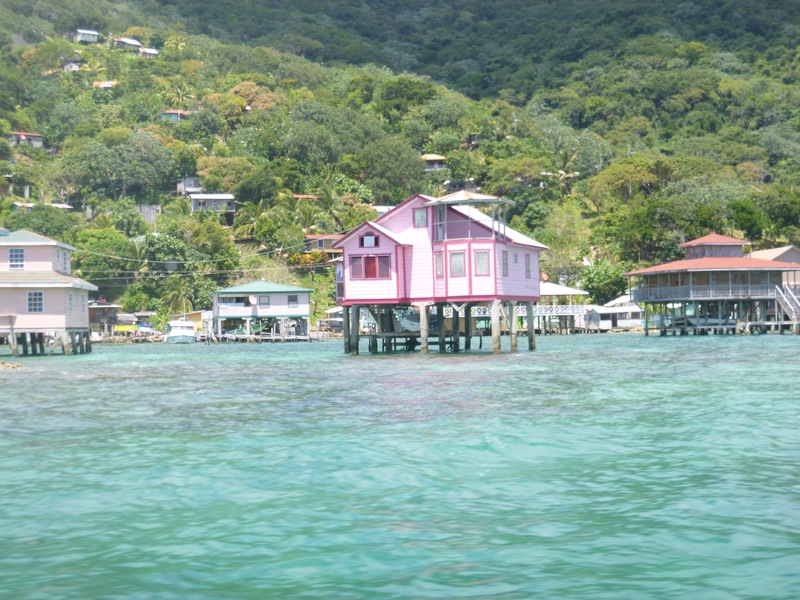 We saw barracuda, grouper, snapper, stingrays, angel fish, parrot fish and many more in our daily sojourns on the reef. 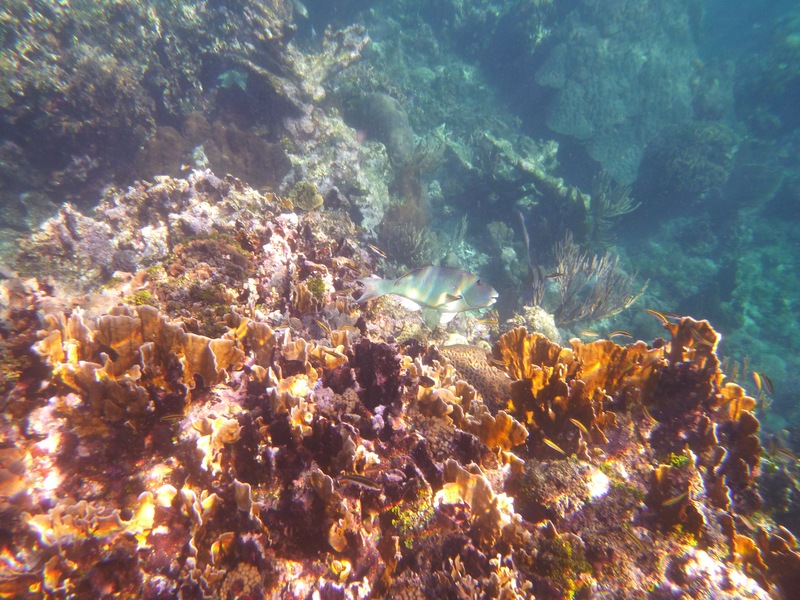 Our snorkelling was unfortunately confined to the inside of the reef as the waves breaking on the outside of the reef, where most of the fish life and coral was, was too dangerous unless you were diving and as a result we didn’t see any sharks at all. 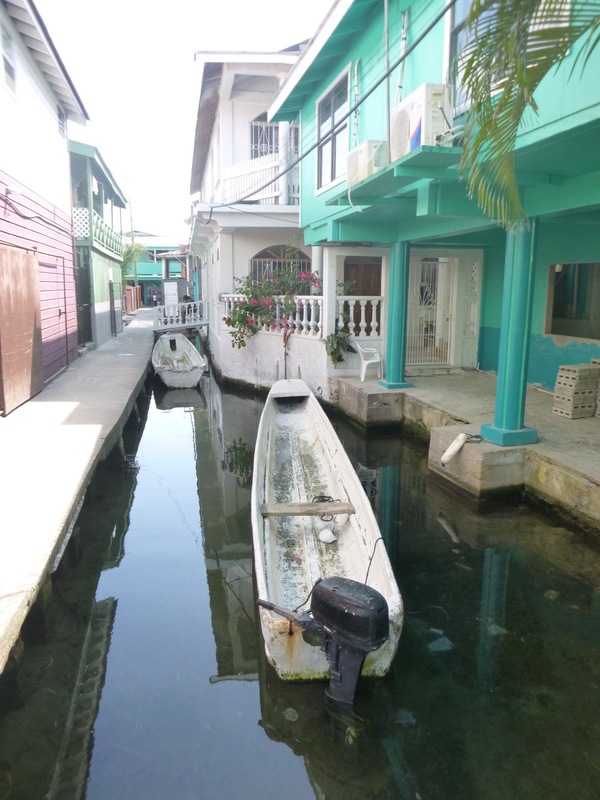 In order to re-provision we came to Placencia, back on the mainland, a pretty and friendly little place but much more of a tourist town and full of craft shops, tour companies, restaurants and bars. 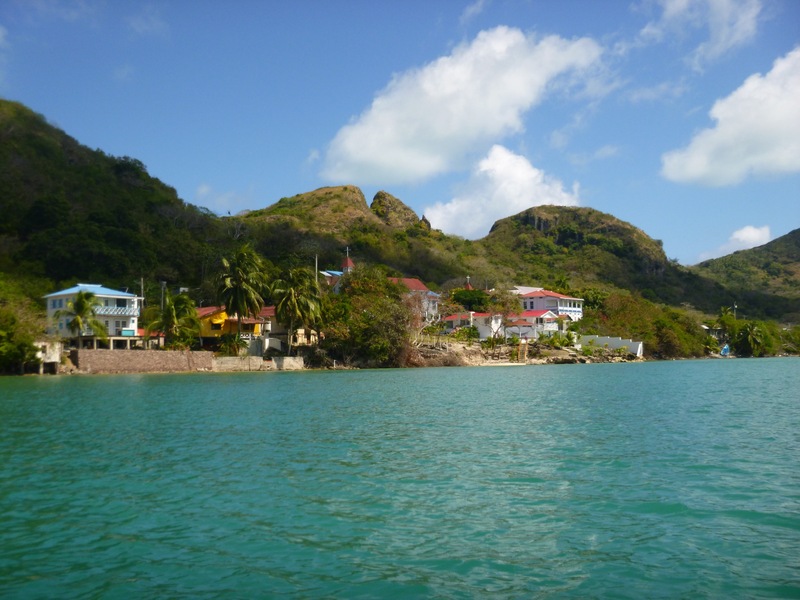 Here we had a well-protected anchorage with a number of other cruising and charter boats in the bay. 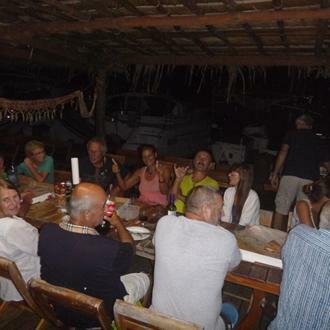 Everyone met up at Yoli’s Bar for live music, a few beers and an opportunity to exchange tales and information with other cruisers. It was here we met George, an American gentleman and one of life’s characters. with a love of travelling to remote parts of the world and we enjoyed his conversation, anecdotes, advice on where to visit and shared dinner together at his favourite restaurant a really nice evening. 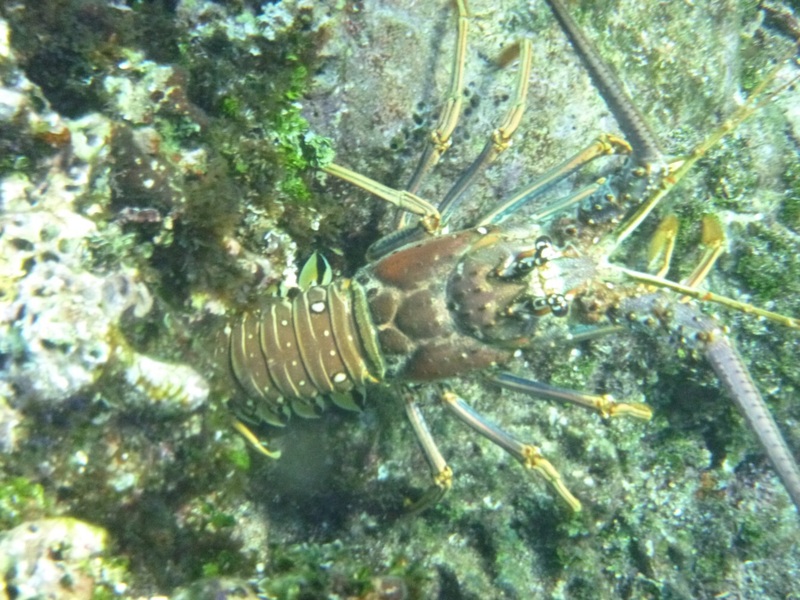 Beautiful but deceptively deadly, the invasive Indo-Pacific red lionfish is terrorising and decimating native reef fish in the warm seas of the Atlantic and the Caribbean. Following the accidental release of 6 lionfish from an aquarium in Florida during Hurricane Andrew in 1992, plus other probable less accidental releases by “enthusiasts”, the population of this non-native species has taken the Atlantic by storm and colonised the seas as far north as Cape Hatteras in the US to Venezuela in the south and throughout the Caribbean, with a devastating impact on the indigenous reef fish population in the affected areas. The lionfish increase at a prodigious rate, females which reproduce on a monthly cycle throughout the year can tally 2 million eggs in a year. This voracious and aggressive predator can devour whole fish two thirds its own size and its stomach has the capacity to expand by thirty times its original size – obesity even in the fish world! In other words, it’s hoovering up everything in its path, with little chance of being preyed upon itself. Unfortunately, its predators in the Atlantic/Caribbean area are few and not nearly enough to combat the huge growth in numbers, although divers in Roatan marine park, Honduras, are trying to train grey reef sharks to develop a taste for the venomous pests. 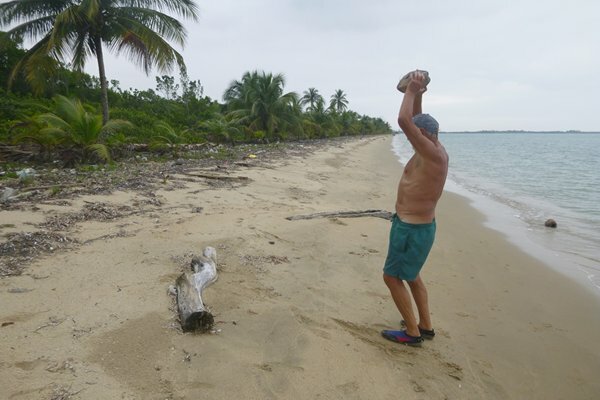 In Belize with its treasured UNESCO World Heritage site – the world’s second largest barrier reef – the fight is on to ward off disaster and, if not eradicate this intrusive species which is now too well established, to at least control its growth and minimise its effect. 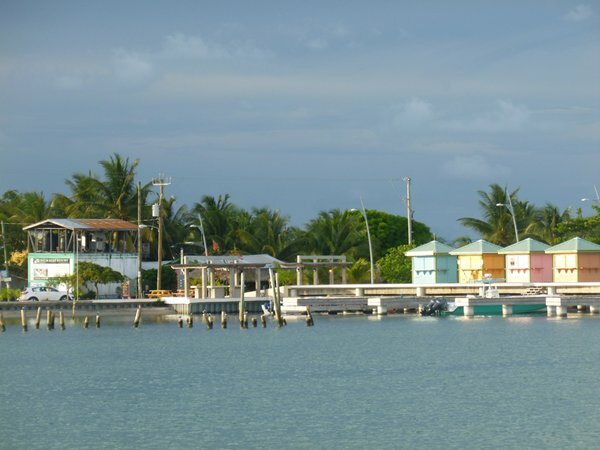 Divers and fishermen in Belize are collaborating to catch these pirates of the fish world and produce a solution to their control. A market for this tasty, white fish is already being developed in the US and the fishermen are being encouraged to turn their attention towards this intruder and away from the overfished conch and lobster. Their previous fear of the venomous spines is being overcome with correct training in the handling of the fish and the results are benefitting everyone. 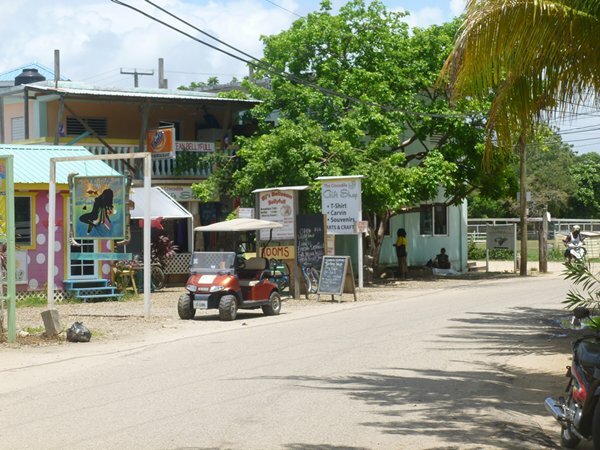 An unusual and original cottage industry, still in its infancy but expanding fast, is being promoted by two enterprising young women – the hand production of lionfish jewellery. 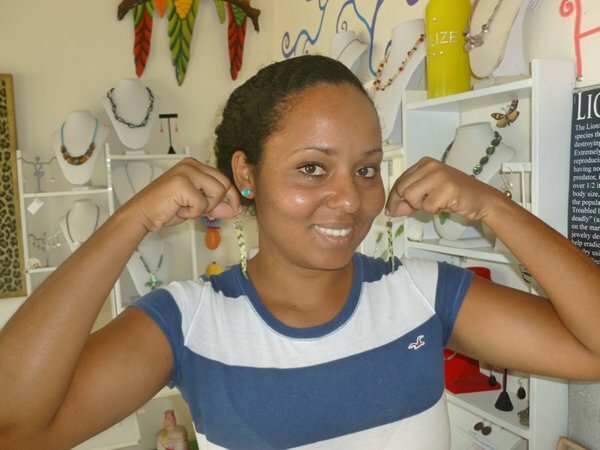 Kadija with some of her Lion Fish Jewellery. They have discovered a way to highlight an extremely serious local problem and at the same time incorporate it into the world of fashion. 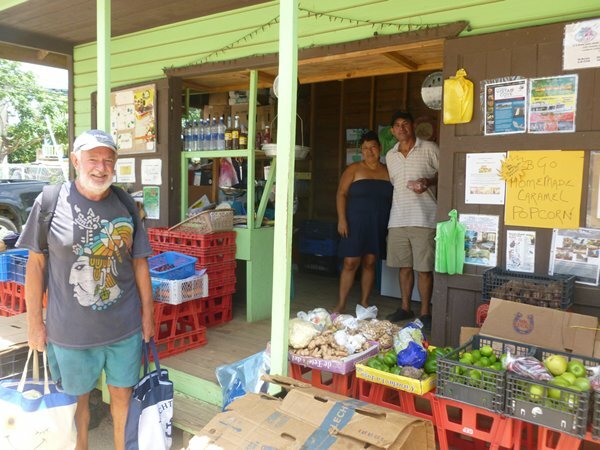 Kadija Assales who runs the Treasure Box jewellery shop in the pretty little tourist village of Placencia has become a certified diver so that she can spear her own lionfish and gather her materials first hand – she then designs and hand makes necklaces and earrings incorporating the treated and now harmless spines and fins of the lionfish. 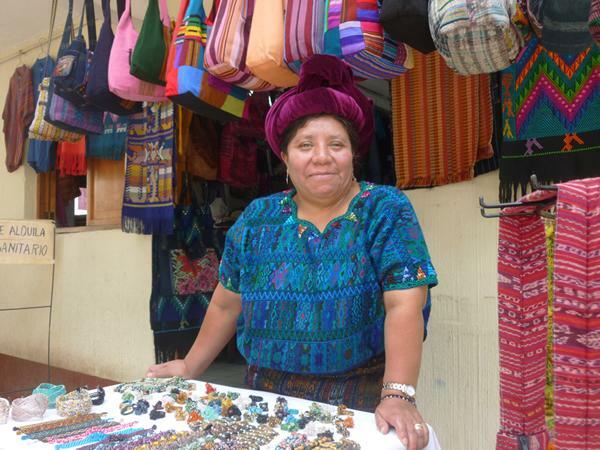 Her friend, Palovi Baezar in the southern town of Punta Gorda is likewise designing unique bangles and unusual earrings to add to their joint collection. 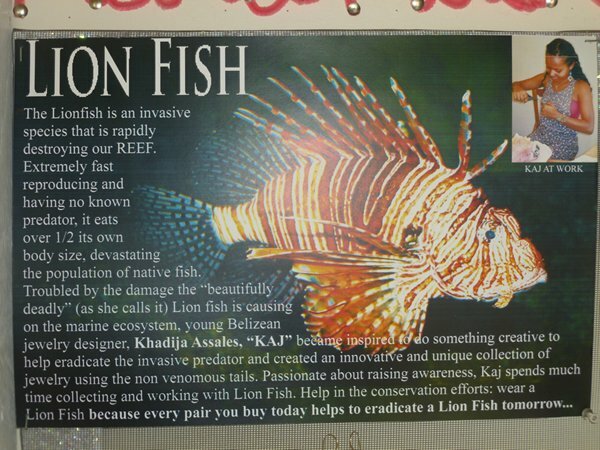 The two girls are doing their bit to bring attention to the lionfish problem whilst, at the same time, bringing much needed new work and skills to their respective areas. 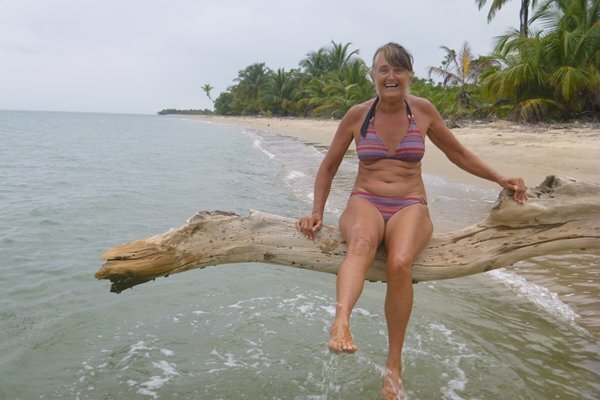 We had returned to Placencia from the Cays to restock the boat and spend some time visiting the mainland, We spent a week at anchor off the beach at Placencia in a well-protected bay which gave us the time and security we needed to spend more time ashore. 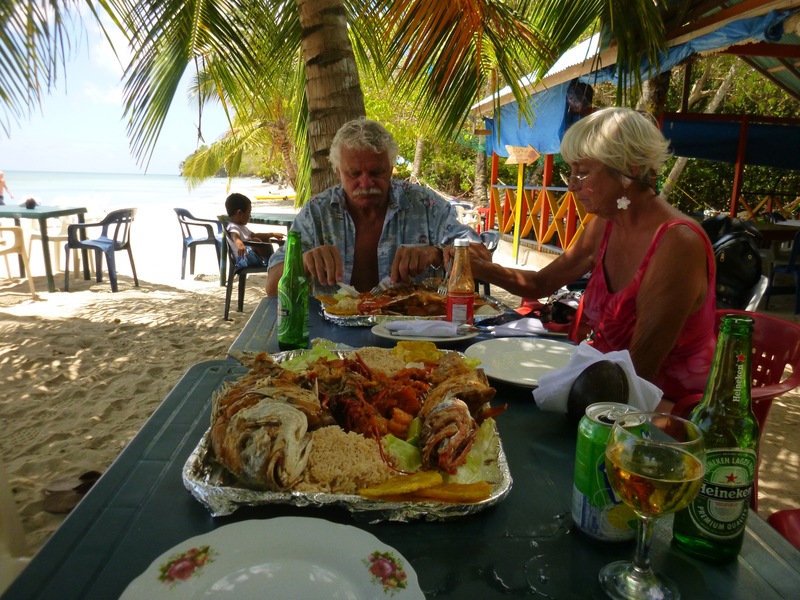 We tested a few local restaurants where we could buy a meal for two with drinks for £20 equivalent and often ate lion fish which was delicious and even served as fish and chips. 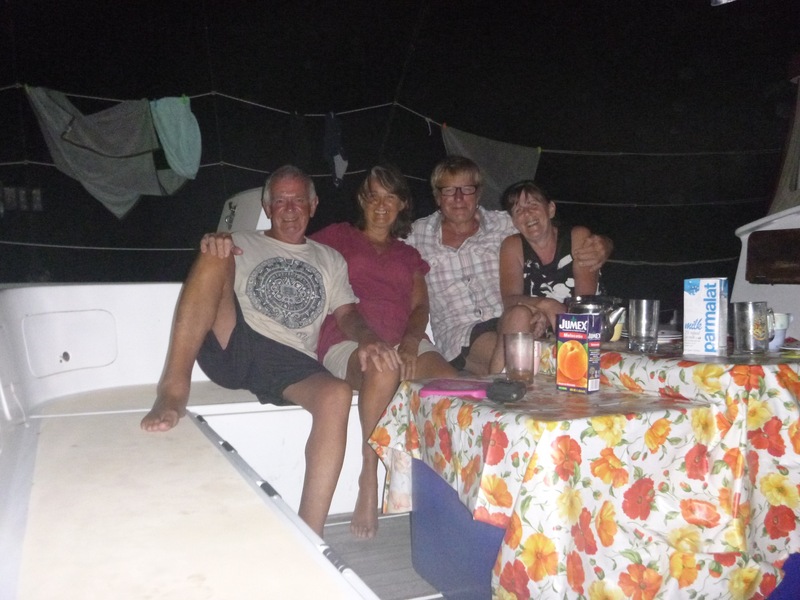 There was also the usual plethora of excellent hardware stores and at costs a quarter of marina pieces we fixed a few things on the boat and invested in a couple of solar lights to light the boat at anchor rather than using our power hungry Anchor light. 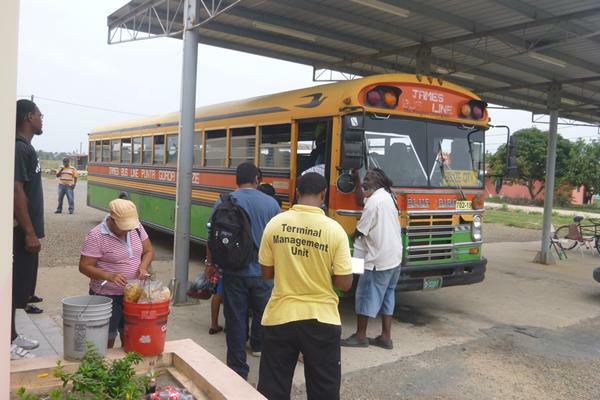 After a few days relaxing we decided to take a two hour bus trip to Punta Gorda which entailed getting a water taxi to Mango Creek, a taxi to the bus station in Independence and a bus to Punta Gorda. When we arrived at the bus station I discovered I had lost our kitty money (around £200.00) after paying off the taxi. Panic stations – the taxi had gone but staff at the bus station were great, they identified the driver as John from my description and phoned him to ask to check the back of his cab. He phoned back to say it wasn’t there. I knew it had to be so I asked another taxi driver to take me to meet him, and after 30 minutes we tracked him down only it wasn’t our driver and this guy who was the President of the taxi association was furious at being accused of absconding with the money; not by me but by other drivers. I described the car and driver again to my driver and he identified him as “Junior” and rang him; 3 minutes later he rang back to say he had found it and so with great relief we set off to meet him. He told me I was very lucky because the wallet had fallen under the front seat and not been noticed by the two other fares he had had since us. Gill knew I had found it by the huge cheesy grin on my face as I got out of the taxi, just in time to catch our bus to Punta Gorda. 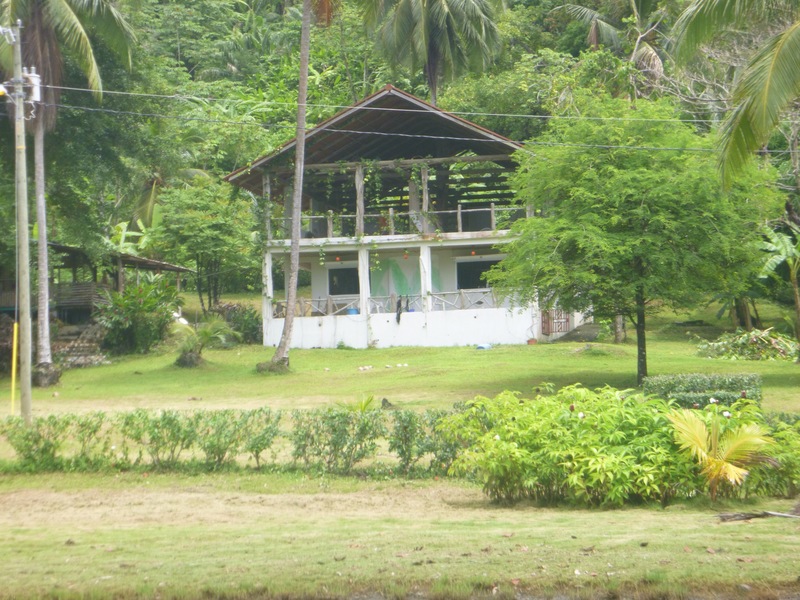 The bus passed through a mix of agricultural land and light jungle and we saw lots of little thatched farmhouses and at one point a sign which intrigued me saying “Slow Tapirs Crossing”. Apparently they roam naturally but are not very good at the green cross code! 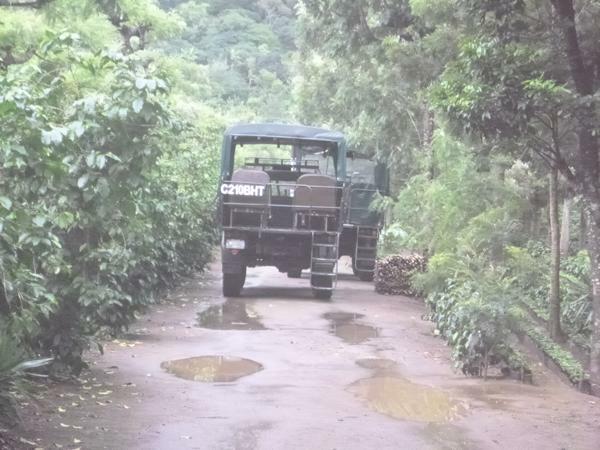 This was the “Express” but in true Belizean style they stopped anywhere for anyone and delivered and collected parcels along the way. When the driver got thirsty he stopped at a little roadside shop and the conductor got off to buy him drinks and a snack and off we went again. Then a guy hopped on who sold snacks and went up the isle selling his wares and when he’d finished he got off to wait for the bus going the other way, no fare to pay, all very laid back. 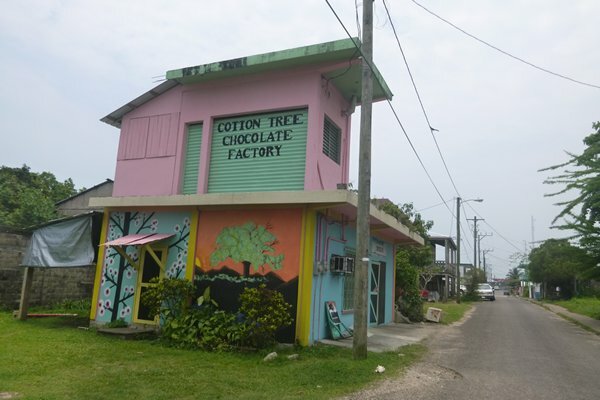 One of the places we wanted to see in Punta Gorda was the chocolate factory which reportedly benefited from the first fairtrade agreement set up by Green and Black in the UK with the cocoa bean growers of Belize. This tiny facility made thousands of different flavour chocolate bars a week and of course we had to try some samples before buying the ones we preferred. The bars are individually numbered by hand and a best before date written on the back and taste terrific. (see photo). 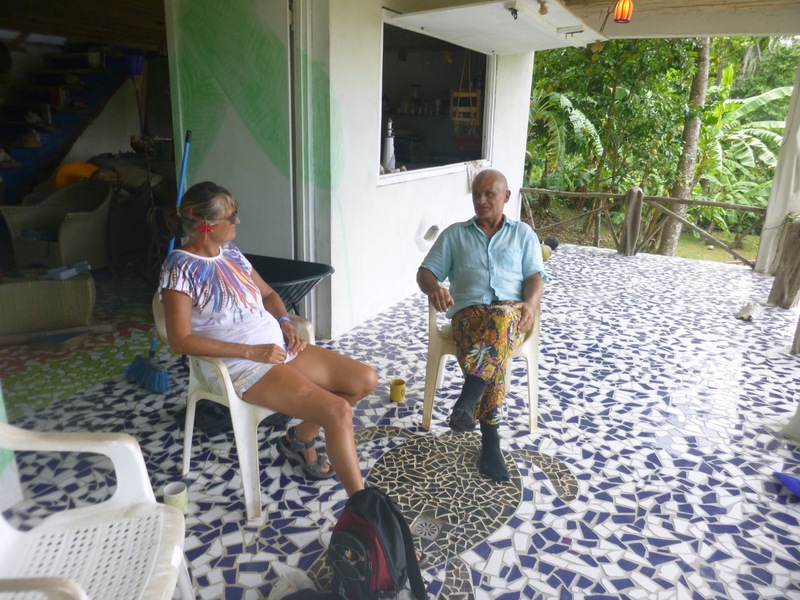 By sheer chance we met up with Palovi Baezar the other Lion fish jeweller in the Chocolate Factory while we were both visiting and gained a broader insight to the problem. 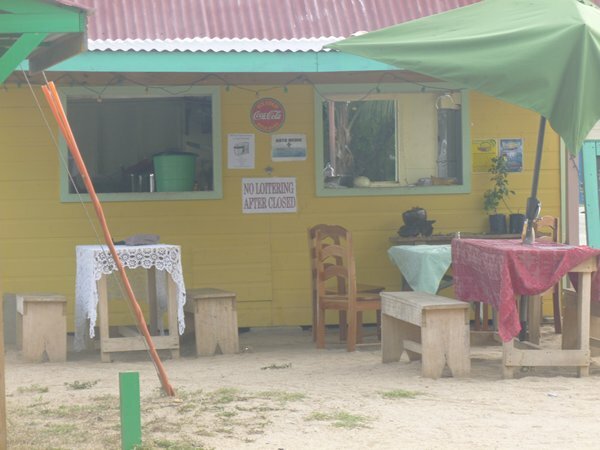 By the time we came out of chocolate heaven it was lunchtime and we decided to eat at a beach side hut run by a large formidable lady called Jocelyn. We both chose grilled snapper which was delicious and washed it down with her freshly squeezed orange juice. 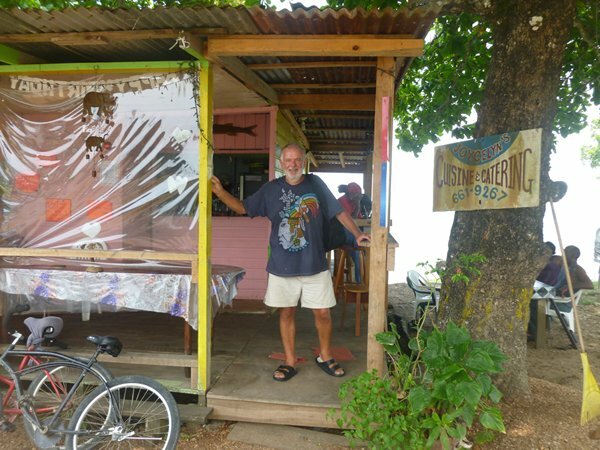 This was quite similar to a place we ate at in Placencia called Brenda’s, another formidable lady of great character who had a shack on the beach, served simple tasty food from very basic equipment at a very reasonable price and bring your own beer. 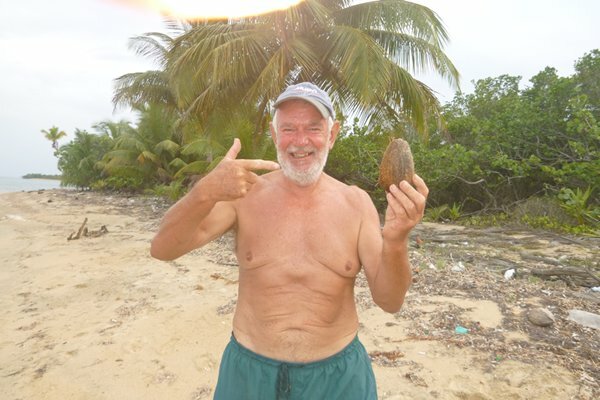 After a week in Placencia and with a favourable weather forecast for the coming week we decided to go out and visit the Sapodilla Cays at the south end of the reef, reputedly the loveliest and most remote in Belize. 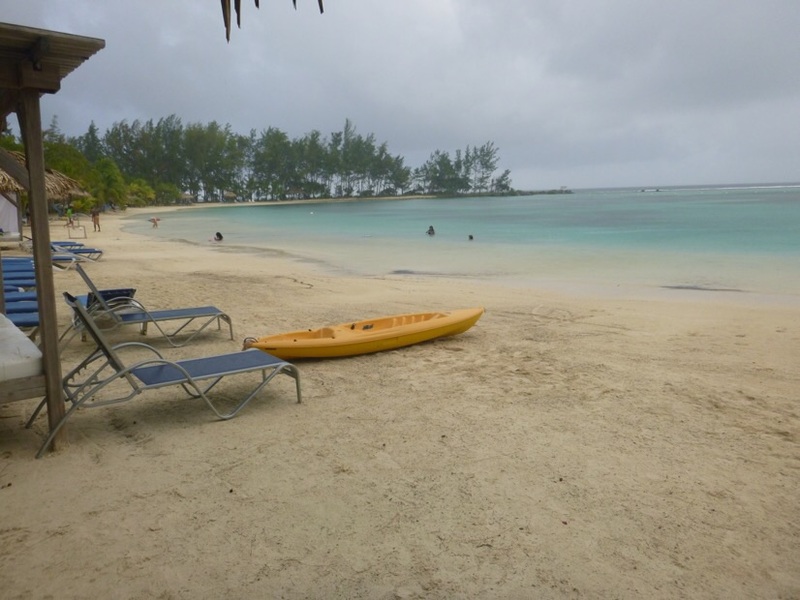 Our first stop was Ranguana Cay which we reached after threading our way through very shallow waters and coral heads, something which was to be a feature of our days on these cays. From here we sailed outside the reef passing through a narrow gap to the sea beyond hoping to catch a glimpse of the whalesharks which are currently taking advantage of the snapper spawning season (not one in sight) and then back in again at Hunting Cay 12 miles further south. This was easier sailing, avoiding the shallows, but nerve racking enough passing through these reef gaps, hoping the charts are accurate! At times like this the forward looking sonar I had fitted in Cowes came into its own – a fantastic bit of kit that gives you a 40 metre underwater sonar view forward of the boat and a great aid for threading your way through such treacherous waters. 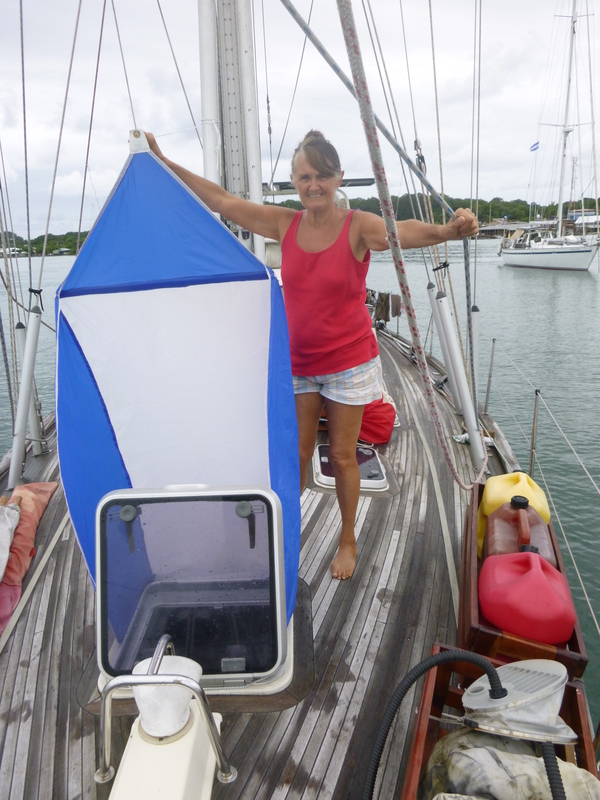 We tried to anchor off Hunting Cay but it was too shallow for us to enter despite chart information to the contrary, so we aimed for Lime Cay and anchored with 0.5 metres below our keel. 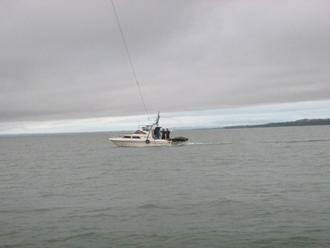 We were then hit by a rain squall but all held well and we didn’t touch the bottom. 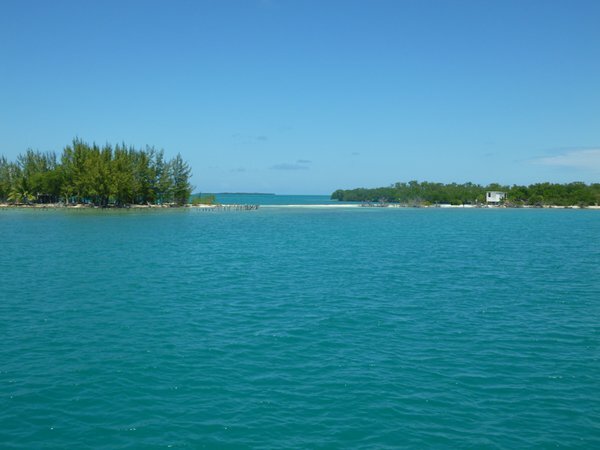 The following day we headed north to Nicholas Cay but the same story it was just too shallow for us to get in so we sailed 3 miles north to Franks Cay and anchored in a perfect horseshoe anchorage protected from everywhere but the north. 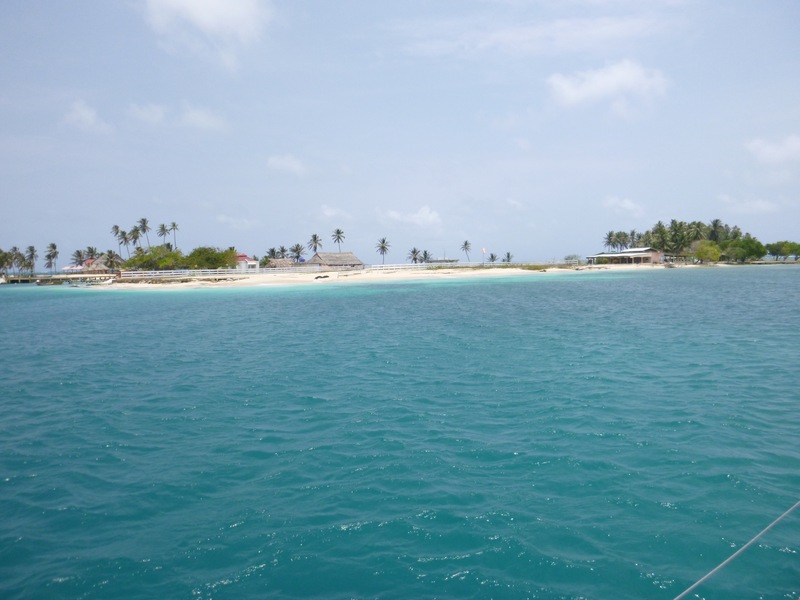 Again we anchored after 5 attempts and a change of anchors in 0.6m under our keel over thick turtle grass, the prospect of a beautiful island to visit the following day and some great snorkelling on offer. Wrong – the wind got up in the night and guess from where – the north. We bounced and pitched all night but only hit the bottom once, I was out of bed 2 seconds later. We couldn’t risk trying to find the narrow entrance out of this trap in the dark and had to wait it out until morning. By dawn the wind was 30 knots and rising, not what was forecast, so we decided to get out fast but as we had used our second anchor it meant that Gill had to raise it by hand while I controlled the boat in wildly pitching seas. She did it brilliantly and we squeezed out between the reefs into deeper water, breathing a huge sigh of relief and counting the lessons learned. The nearest safe haven in a northerly wind was 4 hours away on the mainland and we spent an uncomfortable time motoring through steep seas towards it with uncharted shallows around, sometimes having to stop the boat to find a way through and unable to use our sails which would have stabilised some of our pitching and rolling – not for the faint hearted. 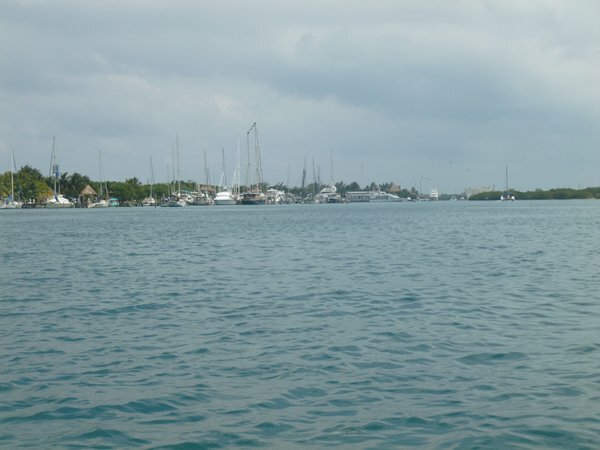 We later learned from an American boat that was also out on the Cays that the weather had worsened considerably and we were so glad we had decided to cut and run when we did. 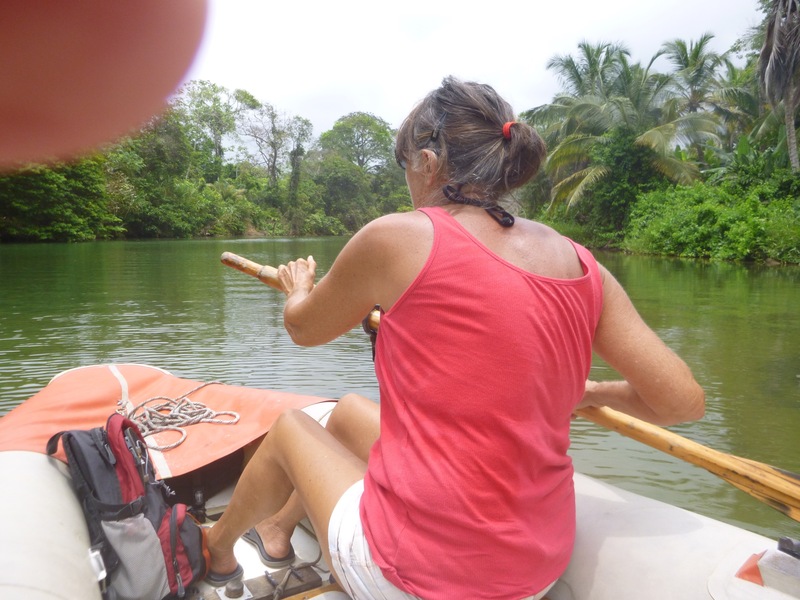 I also decided to give Gill much more practice in boat handling to free me to do the heavier tasks when required – one of our lessons learned. 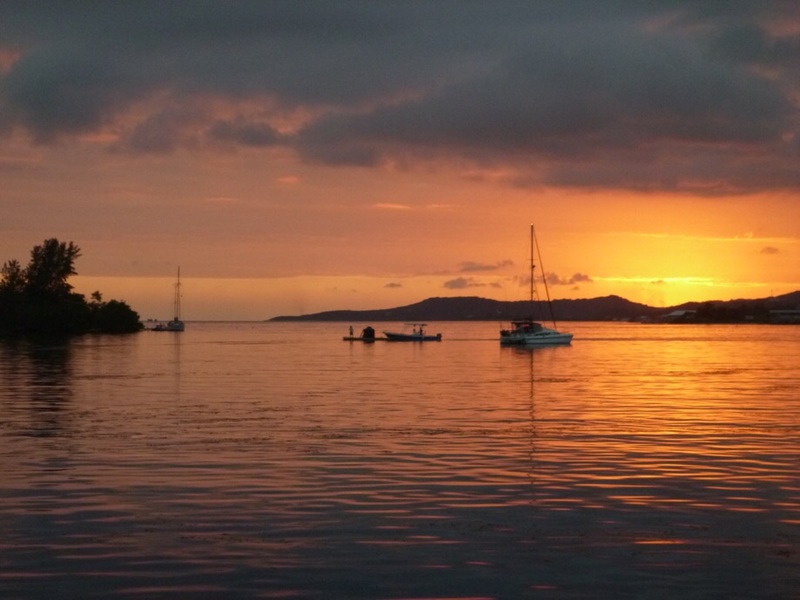 We headed for a place called New Haven and anchored in 6m of water behind an island, well protected from all directions and by nightfall the wind had died and we had a blissful sleep. 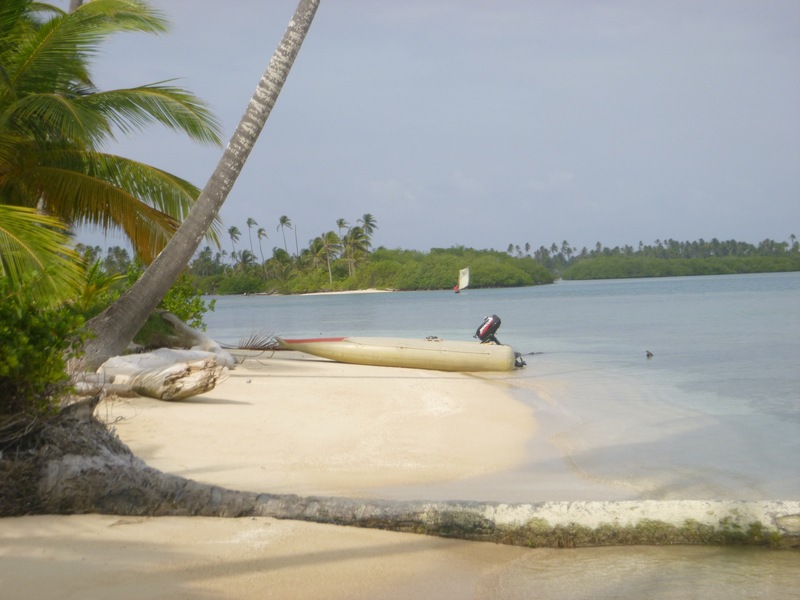 The next day we decided to explore the 3 mile long deserted beach ashore and headed off in the dinghy. 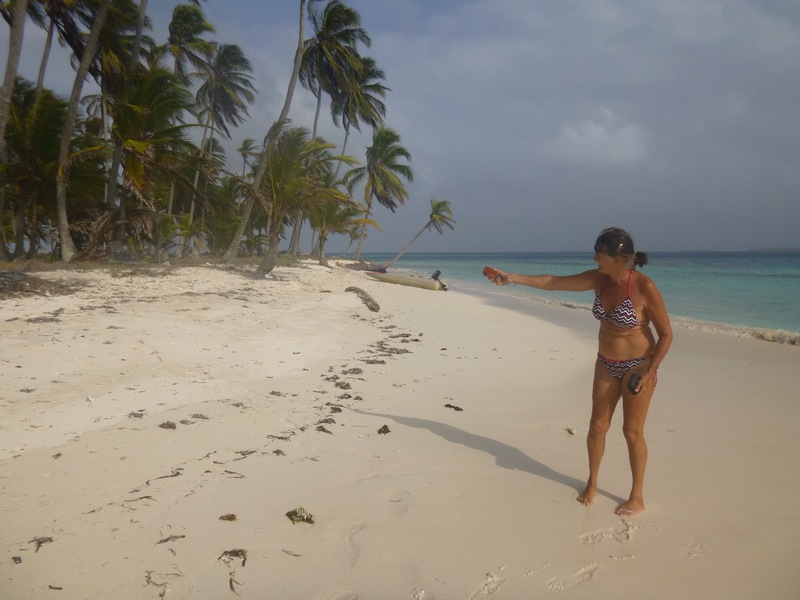 There we found many coconut palms, some of which I could whack coconuts off with a long bamboo pole. The problem then was how to open them – the pictures show our manic attempts to crack them open with only modest success. 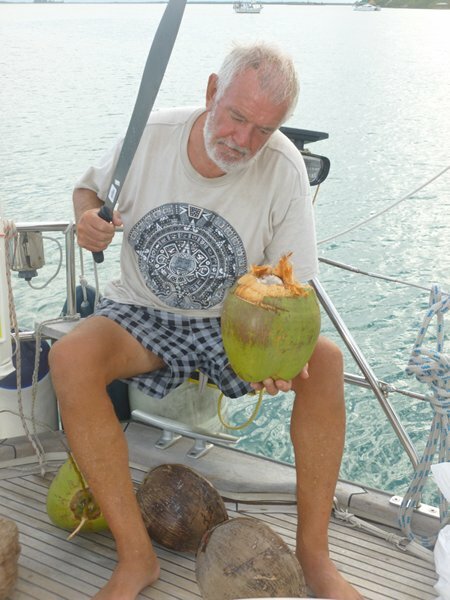 (We now have a 3ft machete which does the job just fine and provides us with an effective boat defence. All that work for this! 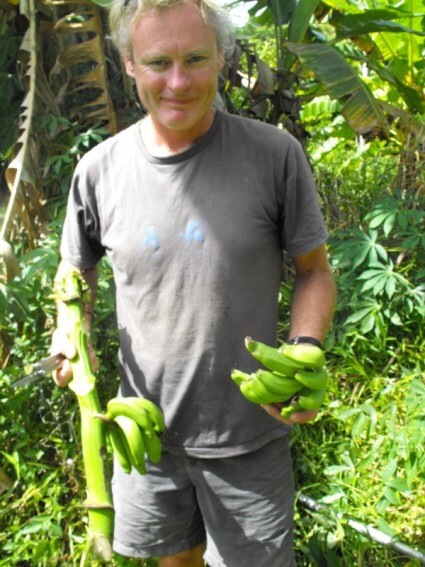 We now have a good supply of coconuts and a source of milk – useful for our Pacific Island adventures yet to come. Farther along the beach we saw some manatees grazing on the turtle grass close to shore and walked in to chest height to get close to them. 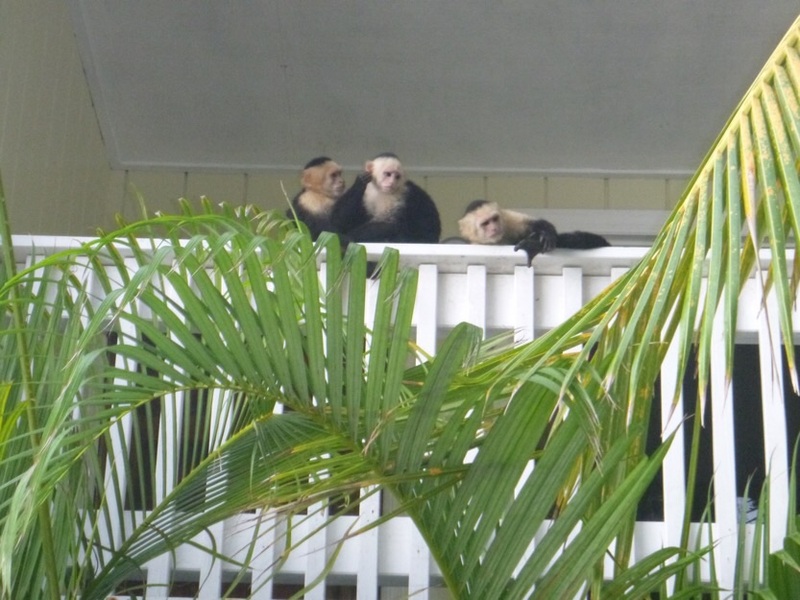 We got within 20ft before our presence scared these gentle creatures away. 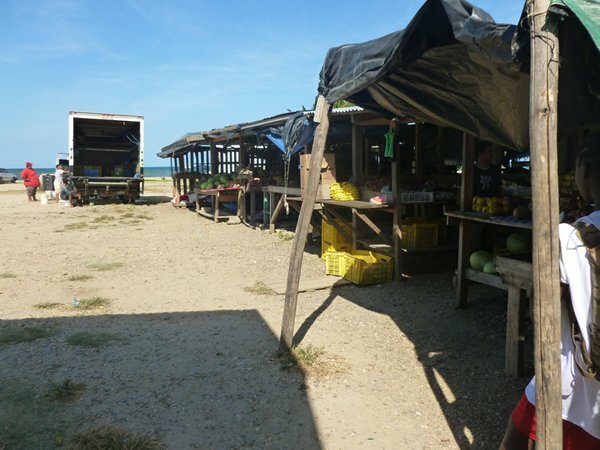 We had decided to go back to Placencia to restock the boat again after our week on the Cays and return to Dangriga by bus to clear out through customs and immigration as our visas expired on the 21st May and the Customs guy had said it would be much cheaper than Placencia or other ports. 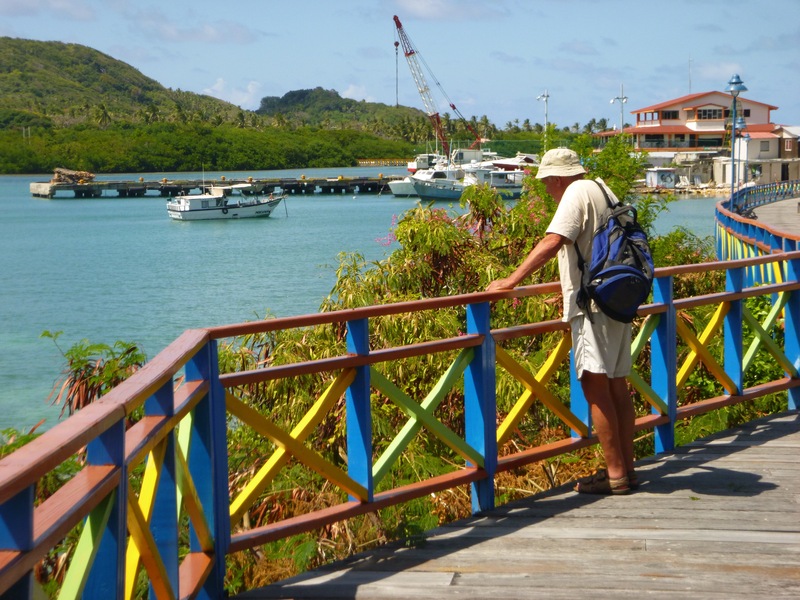 The bus left at 7.00am so an early start to dinghy ashore and walk up to the terminus. The bus as always was packed and we were lucky to get a seat, although they are so hard your bum goes numb after half an hour. The kids are great and give up their seats for elderly and people help the elderly and infirm on and off the bus in a very caring way. No – neither Gill nor I needed assistance if that’s what you’re thinking. When we arrived at the offices the Customs guy told us it was $50.00 fee to exit but when I told him it was my birthday he let us off with no charge and a hearty handshake and happy birthday wishes – what nice people. 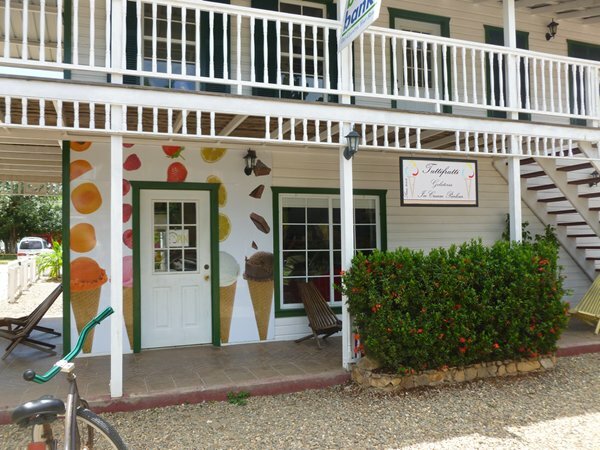 One of the other reasons Gill wanted to come back to Placencia is the Italian ice-cream shop, Tutti Frutti where they sell the most delicious selection of 18 flavours. 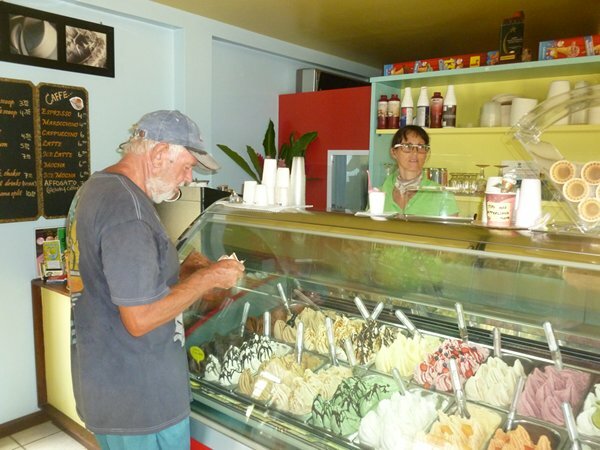 So when we returned from our hot bus journey we headed straight there for choices of mango, dark chocolate, lime, baileys, pistachio, blackcurrant and many more – mmmmmmmmmmmmm! 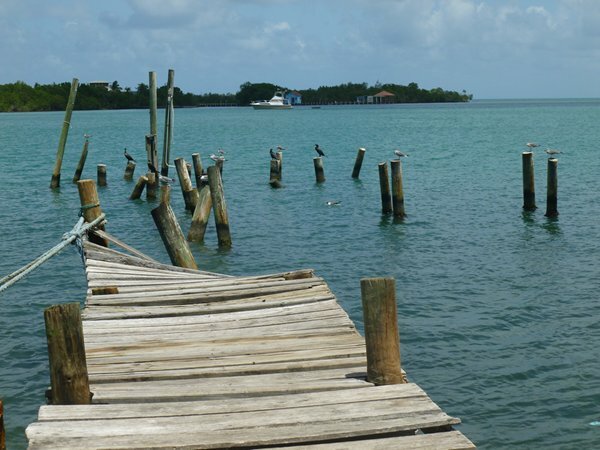 Back in the nineties Placencia was hit by a hurricane which fortunately did little damage but just after it passed they had an earthquake which devastated the village and they left this jetty as it was afterwards. We wanted to go back to the Sapodillo Cays however the winds were too strong for the exposed anchorages so we headed down south to Guatemala a journey of around 60 miles stopping along the way at New Haven, where Gill ran the boat aground for the first time and another little cay called Moho – confusingly this was named the same as another cay we had visited further north. We entered Guatemalan waters and hoisted our yellow quarantine flag and as we approached Livingston at the mouth of the Rio Dulce we set out lunch in the cockpit only to be attacked by a large swarm of wasps that decided our boat would make a handy resting place – let battle commence! 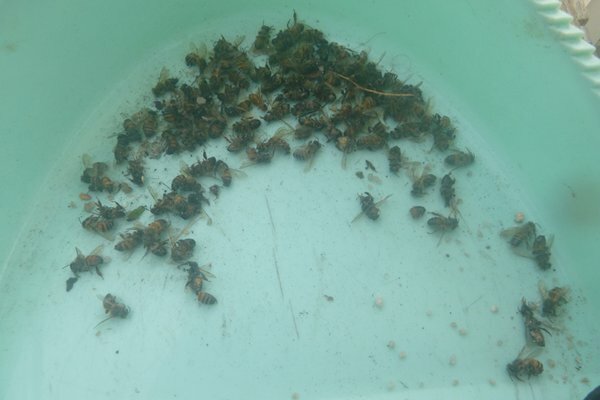 Gill battened down the hatches and I set to work with a flip-flop and Gill with a kneeling pad and her expert tennis swing and we attacked the swarm with vigour. 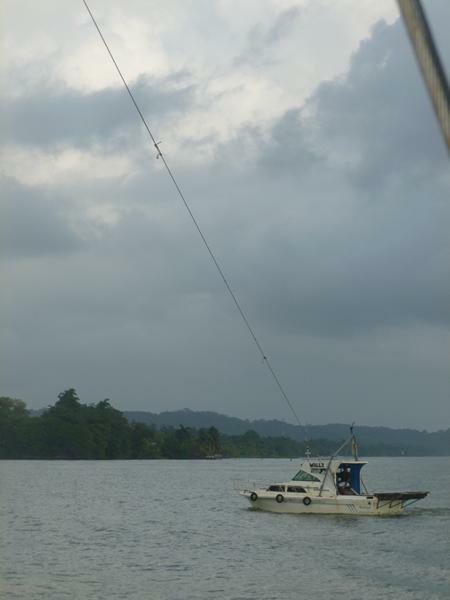 The main swarm had landed on a red and black reefing line hanging on the rail while the rest explored the boat. Lunch was put on hold while the battle raged for an hour until we had killed or driven off every wasp. The aft deck and cockpit were thick with dead bodies and remarkably neither of us was stung – boarders repelled! To get over the 5ft mud bar at the mouth of the Rio Dulce river we had organised a tow from a fishing boat through Raul Morales the local agent, prior to leaving Belize. 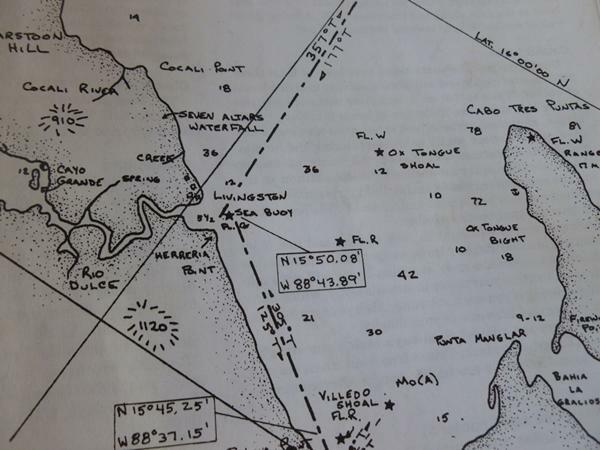 To catch the highest tide in May we had to arrive at 06.15 off the Livingston sea buoy and so after sussing out the lay of the land for the next morning, we spent the night at the nearest sheltered anchorage off Cabo Tres Puntas (2 hrs from Livingston) see map! 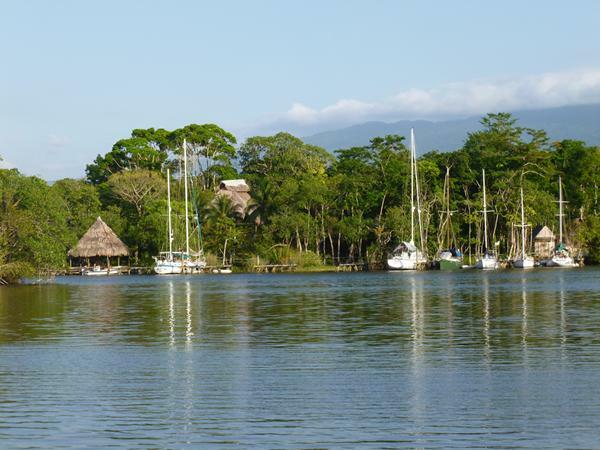 For the next chapter when we cross the bar to Livingston and explore the beautiful Rio Dulce through the Guatemalan jungle tune in at the end of June. 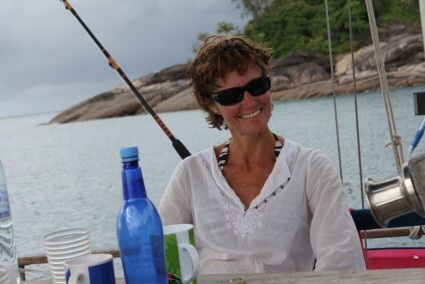 Apologies that there has been a long time between blogs but we have been busy getting the boat sorted and then in my case spent 2 months in the UK and Gill spent an extra month in Thailand visiting her daughter. 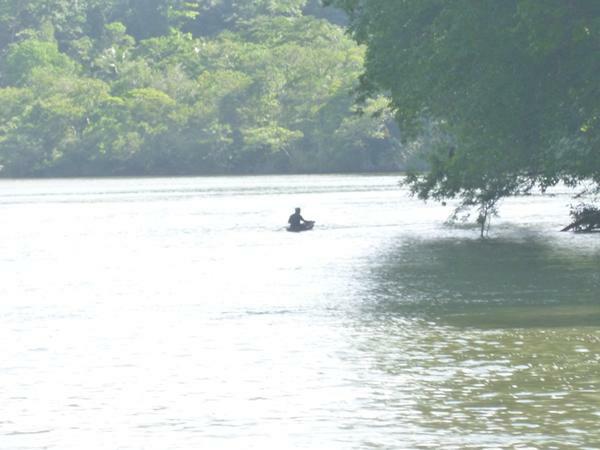 So this post brings us up the Rio Dulce to Fronteras and the place we left the boat to go back home. 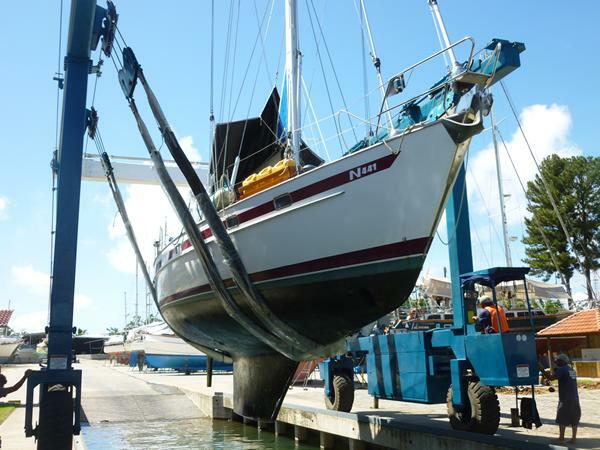 “During the hurricane season from June to November we needed a safe spot to leave the boat and have some work carried out to prepare the boat for the next phase of our circumnavigation. Our choices were; going north to the eastern seaboard of the US; going south out of the hurricane zone to Panama or Colombia or; to tuck in up the Rio Dulce in Guatemala, although technically speaking it’s still within the hurricane zone and also suffers from occasional earthquakes. 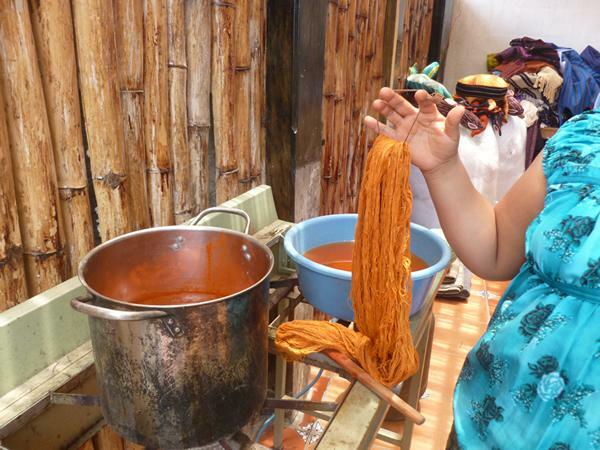 We decided on the Rio Dulce, however, for four reasons; it’s a beautiful place; it’s very cheap to live there; the boat yard labour cost is very low and the skill base high and; although in the “zone”, it’s a very sheltered hurricane hole. I checked it out with the boat insurers and they agreed provided we had the boat lifted out and chained down while we were back in the UK. To get into the river you first have to cross a mud bar at the entrance outside the town of Livingston and the maximum tide height in May was 6ft 6” and we draw at least 7ft maybe more fully laden. 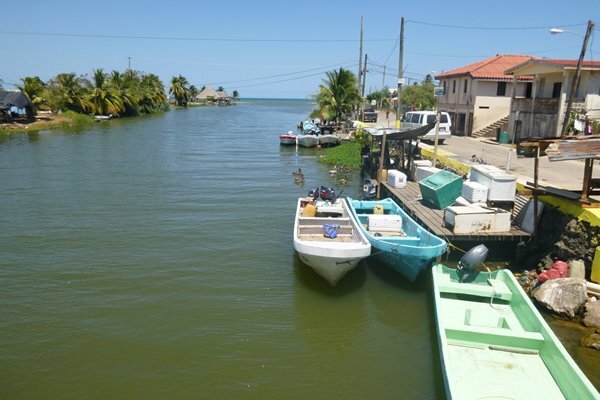 We were advised by other cruisers while in Belize to use a clearing agent called Raul Morales who would also arrange a fishing boat tow through the mud. 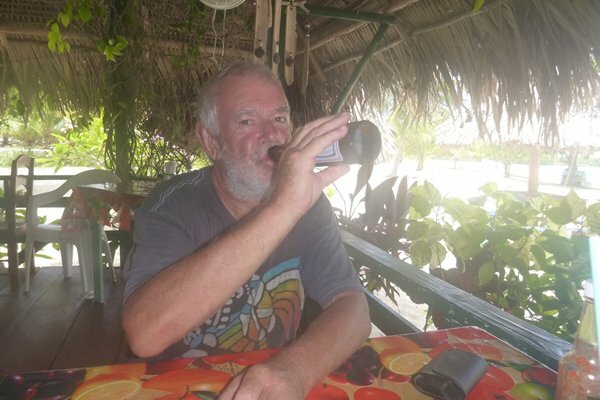 I contacted Raul by email while we were still in Belize and agreed to be off Livingston on the 27th May at 6.15am (high water was at 7.00am) to meet up with the fishing boat and then hoped for the best. 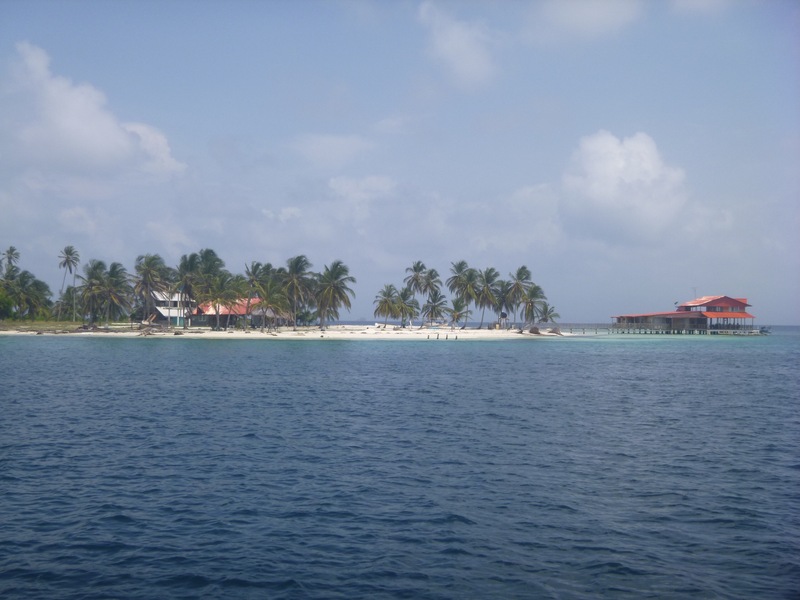 On the 26th we sailed from Moho Cay in Belize and anchored overnight at a sheltered anchorage called Tres Puntas. From there we set off at 4.00am in the pitch dark over shoaling water and by following the previous day’s incoming track on the plotter we arrived safely at the Livingston buoy ahead of schedule. There waiting for us was a rather decrepit old fishing boat with two crew. 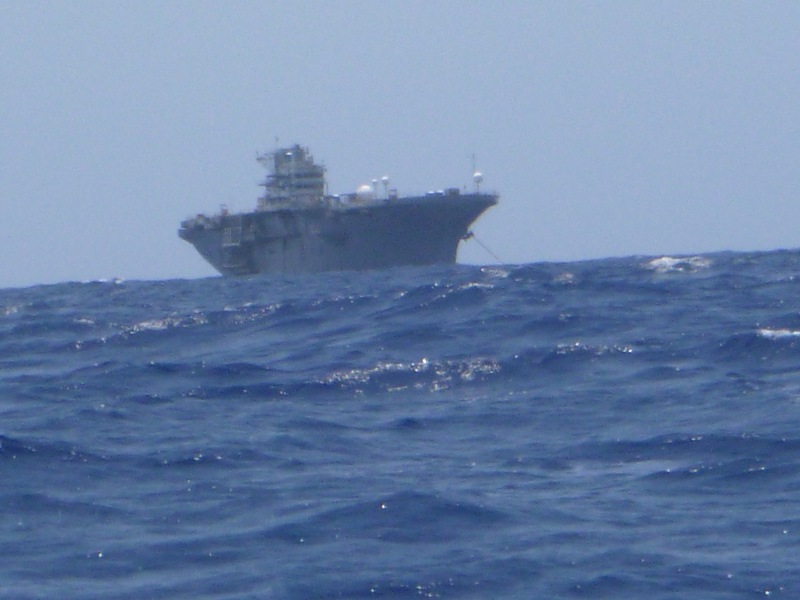 The crewman threw us a line which we hitched to our bow cleat and off we went at speed, both of us on full throttle to cross the bar which was around 2 to 3 miles wide. We had only gone 200 yards when the fishing boat ahead of us suddenly stopped and I pulled the boat up behind him to discover that he had blown a seawater cooling hose on the engine. Undaunted and in true Guatemalan style he shot below to fix the problem while we drifted around on the end of the tow line, gradually both boats being pushed back out to sea by the river flow. After half an hour and a few failed attempts he got going again and just on high water. As we re-approached the bar we could see the depth dropping on the echo sounder and soon we slowed from 7 knots to 2 as the keel sliced through the mud, all was well for 100 yards and then we stopped altogether, stuck fast. 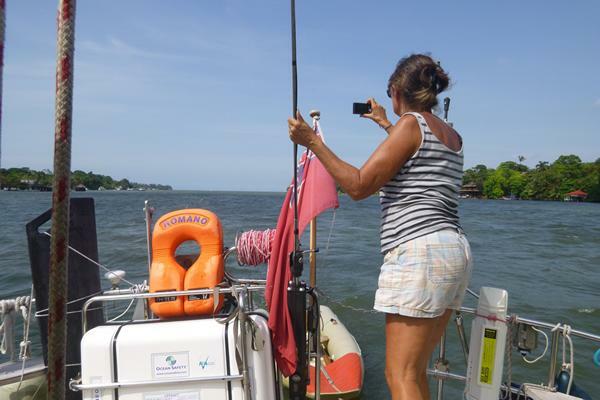 I had been warned there was a chance the tow wouldn’t work so as advised by other experienced cruisers I had rigged a line to our mast which the fishing boat skipper now took and drove to the side of us until Romano was at 45 degrees. I powered up our engine, the fishing boat skipper (who we later found out was called Hector) put his crew on our boat and with Romano’s draft reduced by the heel we continued trouble free over the bar. His crewman made sure I steered an exact course and with the boat on a steady heading the fishing boat was able to maintain a precise angle of heel. 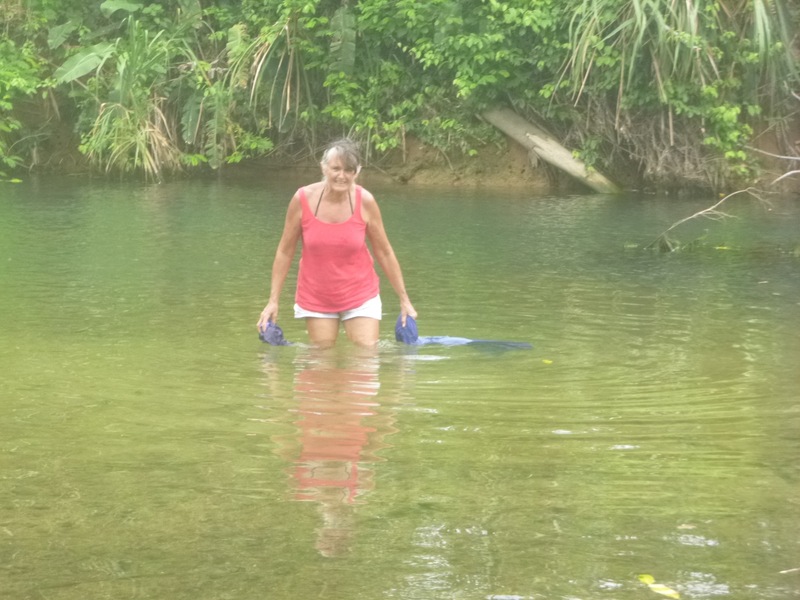 It was a very strange experience and quite exhilarating and cost us $60 but we had made it and were in the Rio Dulce which then continued at depth for at least twenty miles inland. 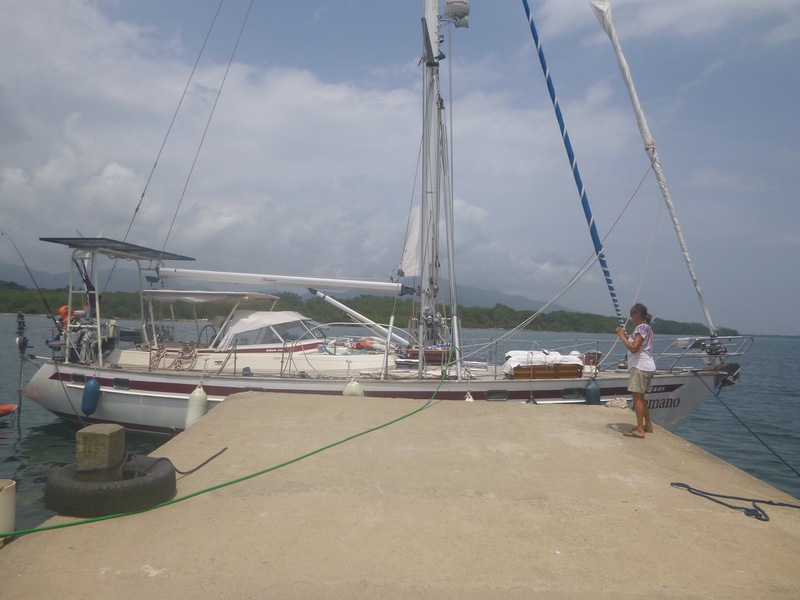 By 9.00am on the 27th we were anchored off Livingston town to be met and boarded by our agent Raul Morales and five officials from various authorities. 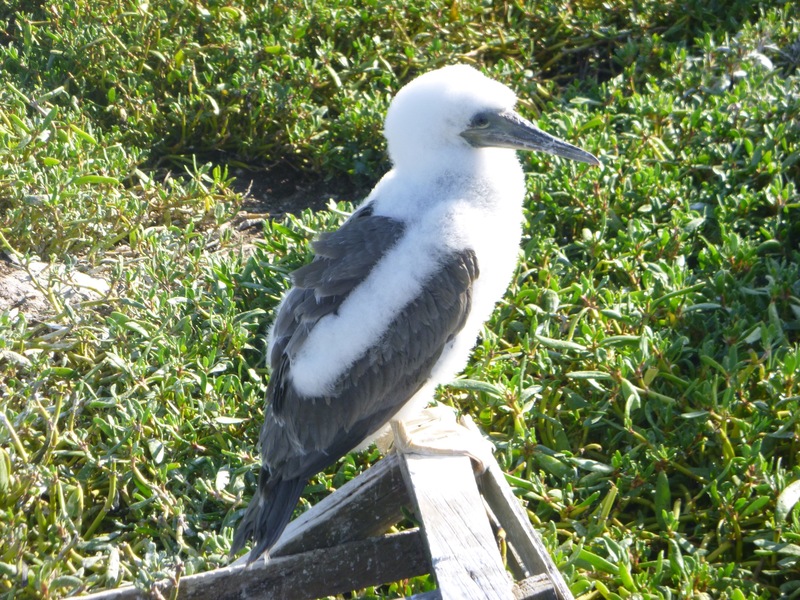 We welcomed them on board and they inspected the boat, asked questions about our health, wanted to know how long we would be staying (the normal visa is 3 months duration) and as we were staying until November we requested a one year visa which was granted at a cost of 3000 quetzals (£250.00). 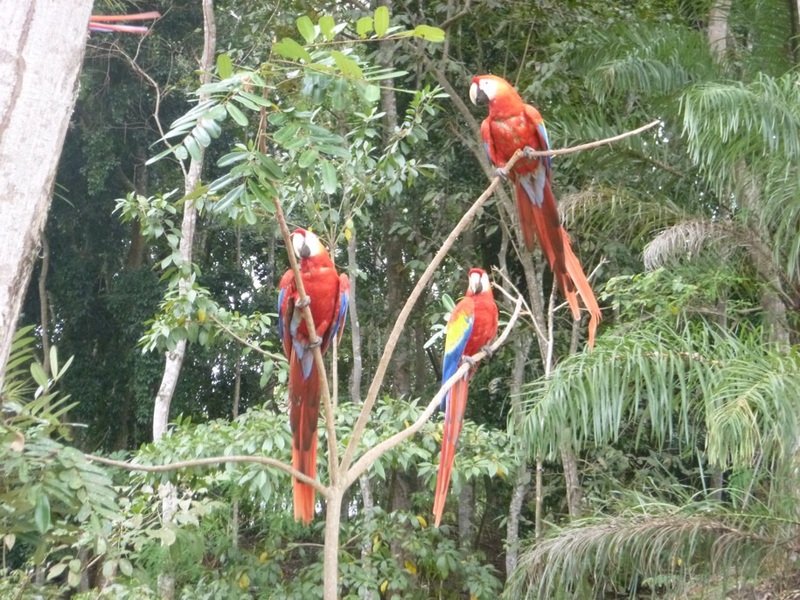 We then went ashore in the dinghy to find a cash machine only to discover we were limited to 1000 quetzals (approx. £80) per day. On production of our passports the bank allowed us to cash the balance. 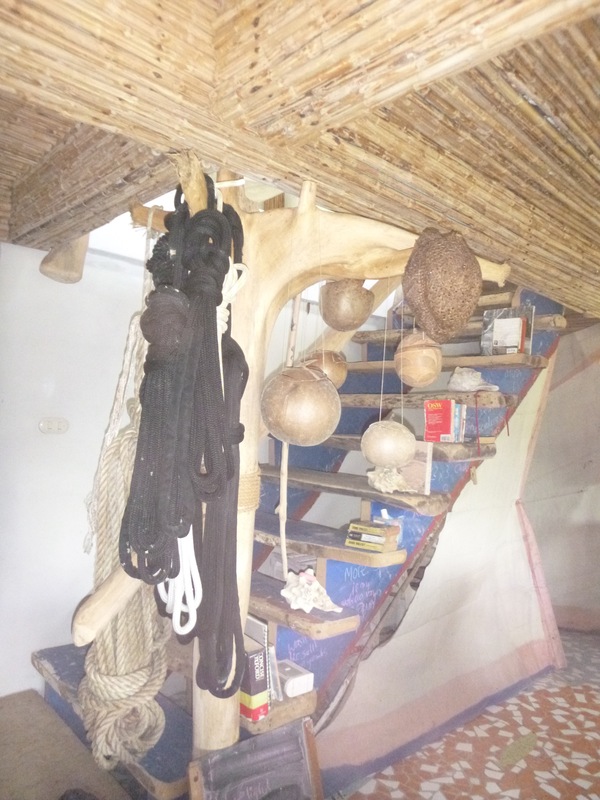 We passed through steep sided ravines and forested banks with fisherman in dugouts under the overhanging branches, we passed their thatched homes on stilts with children playing in the water and tiny villages tucked away up creeks. 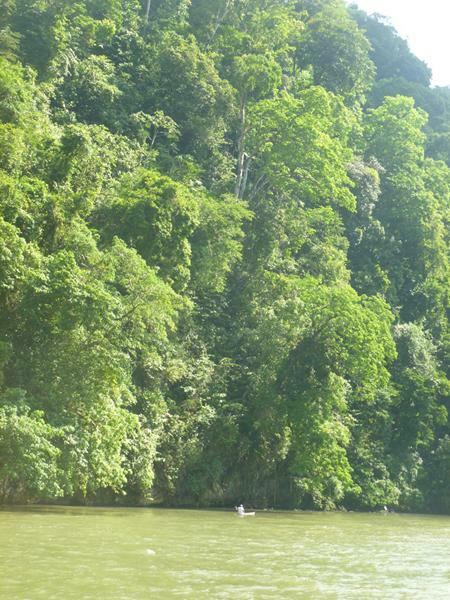 The noises of the jungle were all around us and we could only guess at the sources. A flock of swifts took up residence in our rigging swooping off to catch flies and back to roost chasing each other off the prime spots. It was an idyllic journey and everything we had hoped for. Texan Bay was a small lagoon and village just off the main river and we dropped anchor with another four or five boats about 20ft from the shore in a perfectly still spot. 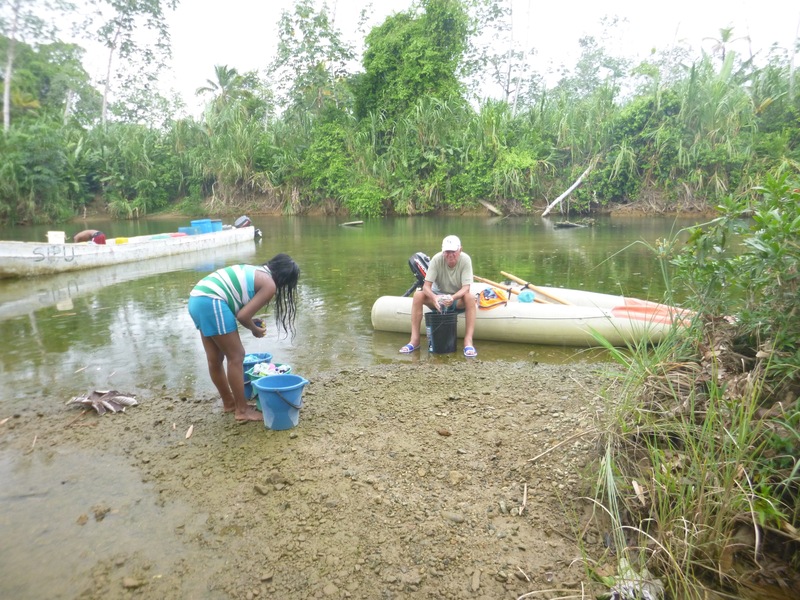 We launched the dinghy and went exploring off the beaten track up narrow waterways, overhung with trees and lianas, hitting an underwater log at one point which fortunately didn’t damage the outboard. Back on board it was time for a welcome sun-downer and a meal in the cockpit, suitably protected with insect repellent. Gill had made some mosquito screens for the companion way and portholes so we could get air through the boat at night and these were about to get a rigorous testing (as I write this several weeks later they’ve performed well). The following day we set off after a leisurely breakfast and passed through a large lake about 10 miles long called El Golfete. Here we came across some shallows we had to skirt around and our forward looking sonar came in useful again. 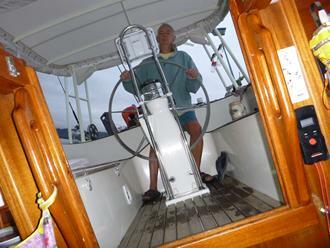 It was quite different sailing up a river after months at sea and something I had never done before in a yacht. 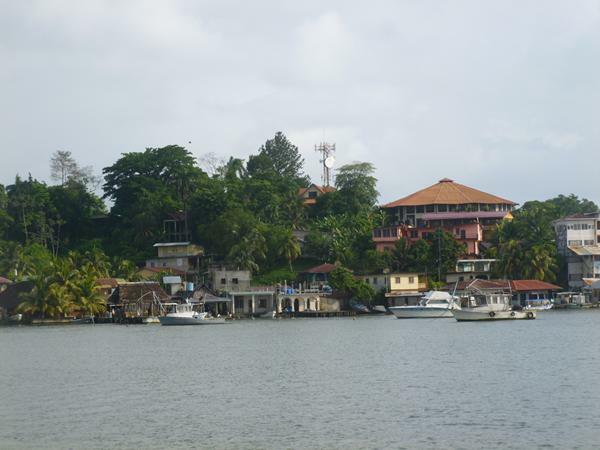 It was then on to the town of Fronteras where we anchored on the other side of the river, off Ram Marina, where we were due to leave the boat while back in the UK. Well we had made it, it was the end of our first leg and quite strange not to be going on. 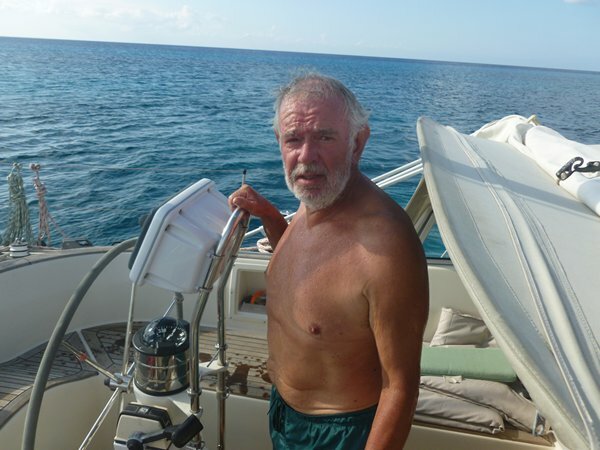 I have sailed nearly 8,000 miles since leaving Cowes, 5,000 of those with Gill and about 2,500 with just the two of us. We have enjoyed the company of Sim and Stefan helping crew the boat, visited many countries en route and met hundreds of people nearly all of whom have been welcoming and helpful. 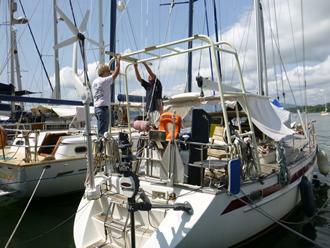 We have a long list of jobs to do here including; the addition of a proper bimini; building a gantry and adding solar panels to increase our electrical generation without having to run the engine; converting the gas system to US configuration; adding a long range SSB radio; all this and more to prepare the boat for the next leg. After a few days of trying to contact various specialists to undertake the work we were starting to find our way around. 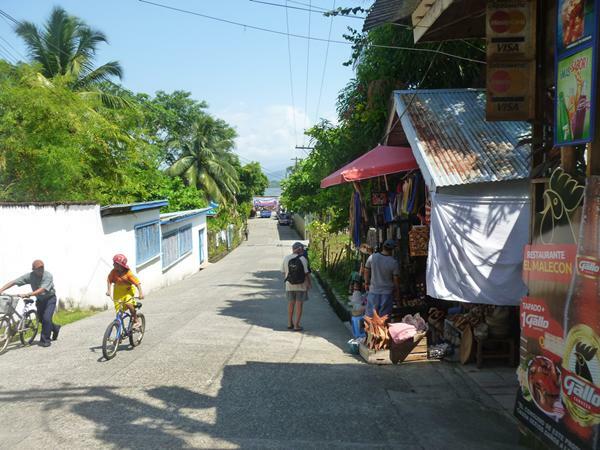 The town of Fronteras on the opposite bank of the river and at the end of a huge bridge built by engineers of the US Marine Corps, is an amazing place. A narrow two way road passes through the middle of town, coming off the bridge and this carries the main traffic for miles around. 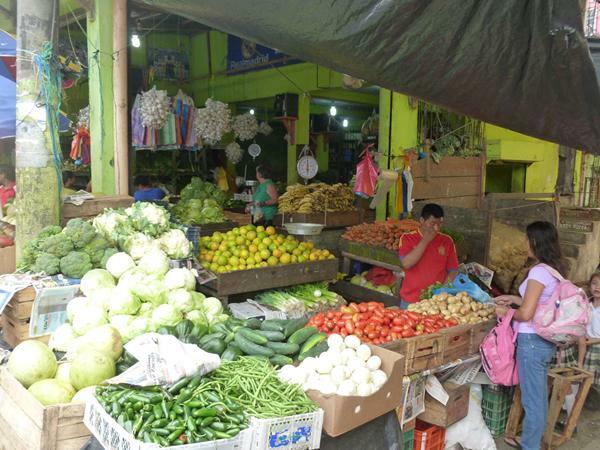 The result is chaos with huge trucks, buses, tuk-tuks, taxis, bicycles, motor bikes and people all competing for road space; there is no pavement and the shops and stalls encroach on the road. 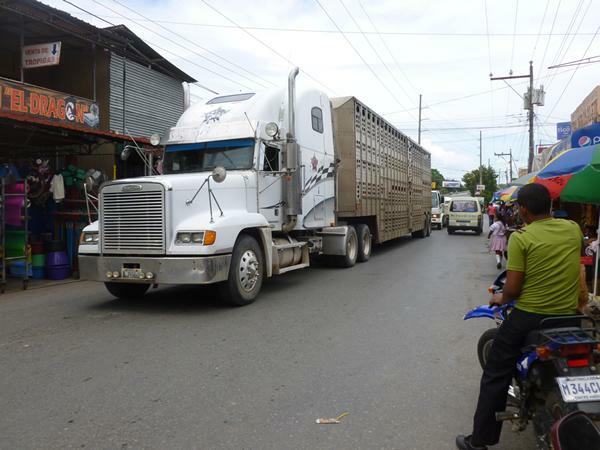 The huge trucks very patiently nudge their way through the melee and come to a halt if another is coming the other way, amazingly nobody gets squished and we have yet to see an accident. This is our main shopping place so we have to play dodgems while shopping but somehow it all works. 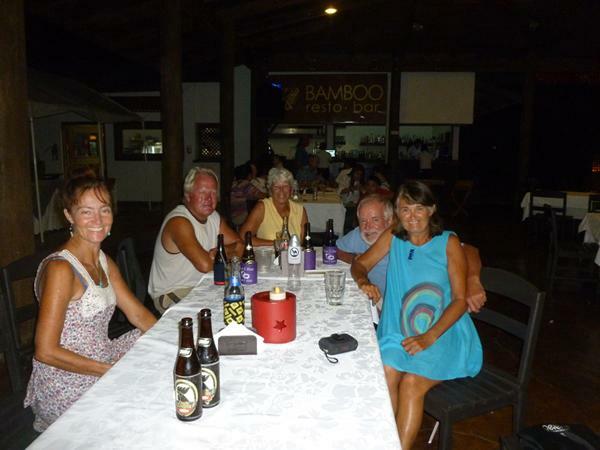 We decided to check in to Nanajuana Marina rather than RAM for the period up until we hauled out at the end of June as it was a hotel and marina and had much better facilities – bar, restaurant, great pool (one of Gill’s favourite places) and lovely tropical gardens. The mooring fees are a fraction of the European marinas, at £5.00 per day you couldn’t park your dinghy for that in the UK. 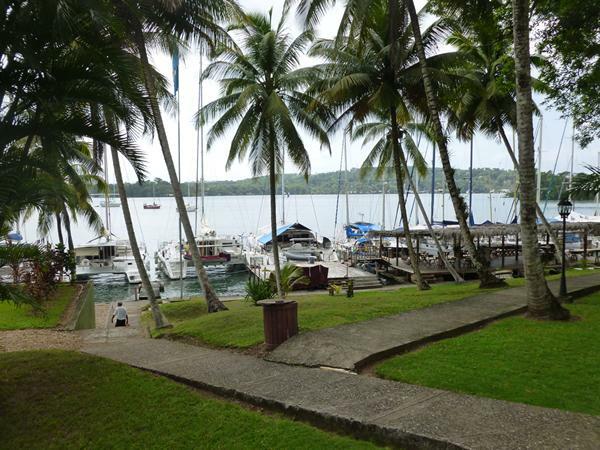 Here also in these lovely surroundings we have made many friends of fellow Australian and French cruisers, this has been our first opportunity to develop a real social life with the opportunity for entertainment on board and parties on the dock. 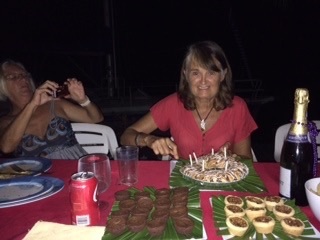 It’s not all milk and honey, most of the boats, us included have cockroach infestations and there are lots of biting things that come out at night and dawn to feast; insect repellent is an essential. We caught two scorpions in a house some German friends were renting and it’s not safe to walk through the grass back to the boat at night, we have to stick to the concrete paths. Gill also spent a morning trying to sieve weevils from the flour and gave up with the comment “well it’s only added protein” and perhaps scariest of all was the story that a French woman found a 4ft (growing by the day) snake on their boat and her screams could be heard for miles. The temperature varies from 32 to 38C and the humidity level means that you sweat all day and most of the night. 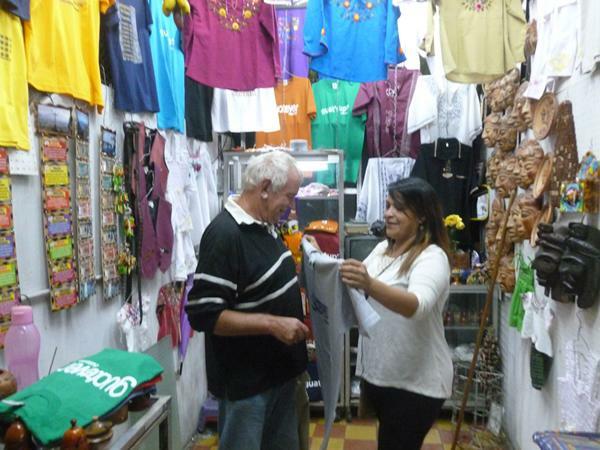 For an outback town Fronteras provides most of what we need and what they don’t supply we can ship in from the US. There are some unusual shops however like the local gun shop where you can walk in with your wad and come out with a colt 45, which many carry in side holsters to match the Stetson, jeans and cowboy boots and hats, amusingly the coffin shop is just opposite. 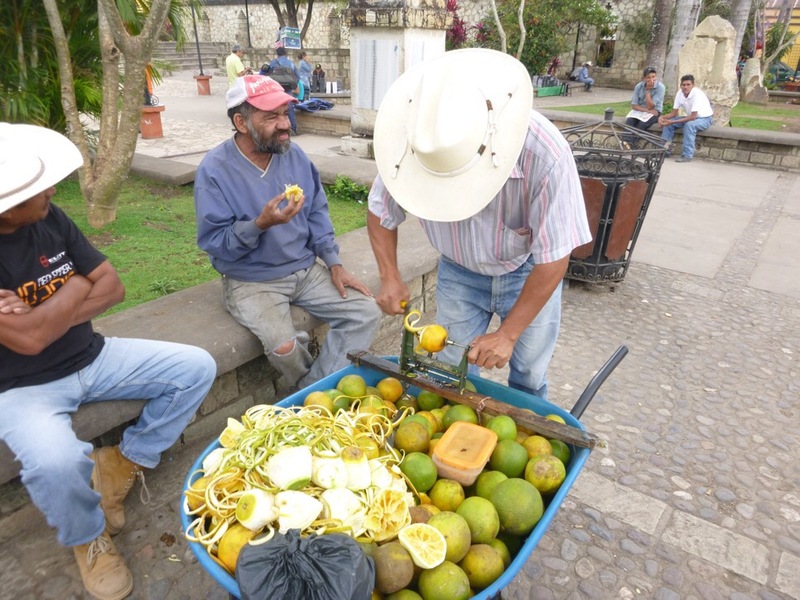 Getting cash from one of the three banks is also a challenge; they limit you to 2000 quetzales (about £150 per day) which doesn’t go very far when you take living expenses and paying tradesmen into account. Often the banks run out of cash (Q100 notes are their largest denomination so you end up with a fistful of monopoly money, which you have to stash away before coming out of the banks) or there is a power cut or they station an armed guard to prevent you using the machine, or the machine eats your card. When this happened to me it was at a machine in the Marina store, the staff were great and repeatedly phoned the bank over a couple of days. When they did arrive to open the machine it was with a photographer to take pictures of the process and a guard armed with a sawn off shotgun, not the sort of response you would get from Barclays. But on presenting my passport I did get my card back. You get the idea this is a fairly lawless society where even the supermarkets have armed guards on patrol. To be fair however although they do seem to kill each other in numbers we have had no trouble at all and the local people have been welcoming and very friendly. On one occasion we needed more cash than the machine would give us so we tried to use our passports and cards to increase the amount we could draw but the banks refused; something that has never happened to us before, so it was back to the ATM each day to draw our daily allowance. 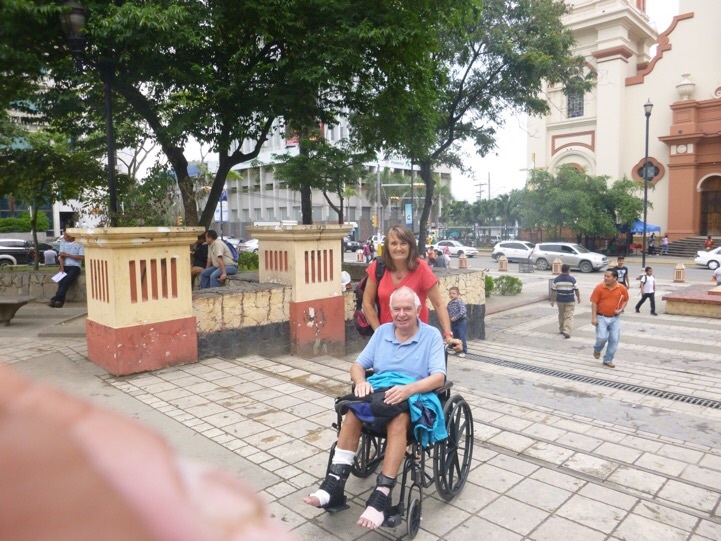 About a week later when I went to get our passports to complete an online application for a US visa for our return trip I discovered both our passports were missing and we then spent two panic stricken days retracing our steps trying to find them. The loss would mean a 6 hour bus journey to our consulate in Guatemala City, an overnight stay and hopefully the issue of temporary passports to return to the UK in a fortnight’s time. We also learned from Gill’s daughter Sarah that the passport office in the UK had a huge backlog and were taking months to process applications. 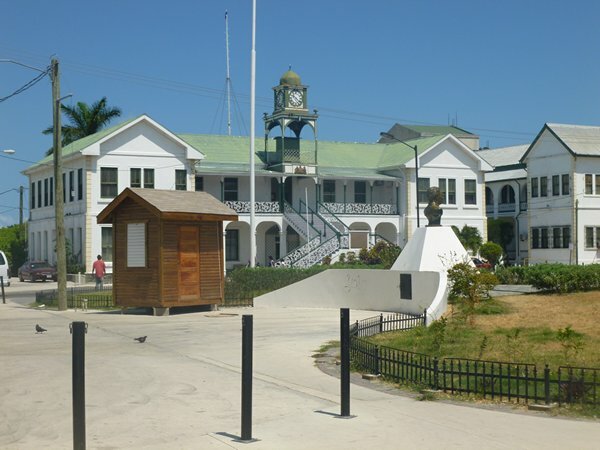 This had been caused by the closure of many UK consulate passport offices around the world and a failure to deal with the increased load back home – nightmare! We had checked everywhere without success, only one bank to go – Gill went in while I waited outside. She rushed out kissed a rather stunned guard and produced the passports – which I had left on the bank counter a week before! The sheer sense of relief was overwhelming but I did get quite a severe and well deserved bollocking from Gill. We are now just a few days off returning to the UK via Miami and have lined up some good deals for work on the boat while we are away. I also have a list of things we need to import from the US and have set that up with an import agent. 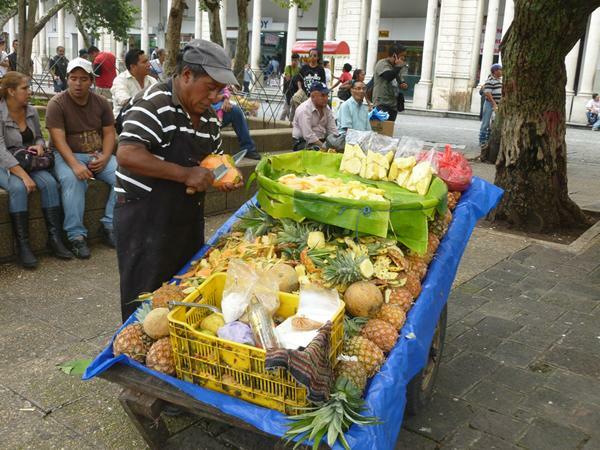 I return to Guatemala on the 20th August to supervise the work and complete various jobs. 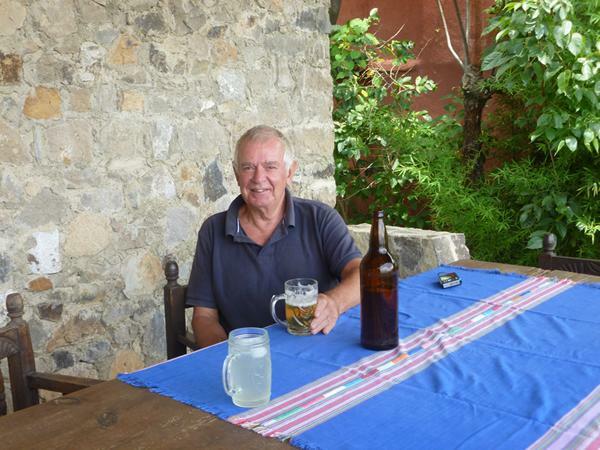 Gill will return on the 10th September and hopefully we should be on our way again by the end of October. 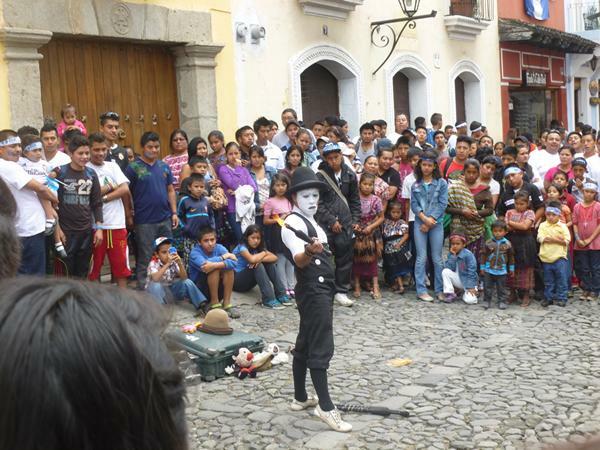 The northernmost of the Central American nations, Guatemala is slightly smaller than England. 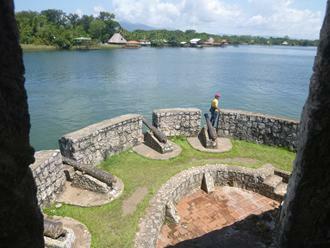 Its neighbours are Mexico on the north and west, and Belize, Honduras, and El Salvador on the east. The country consists of three main regions—the cool highlands with the heaviest population where we visited last week; the tropical area along the Pacific and Caribbean coasts, and the tropical jungle in the northern lowlands (known as the Petén where we will be exploring further in a few weeks’ time). 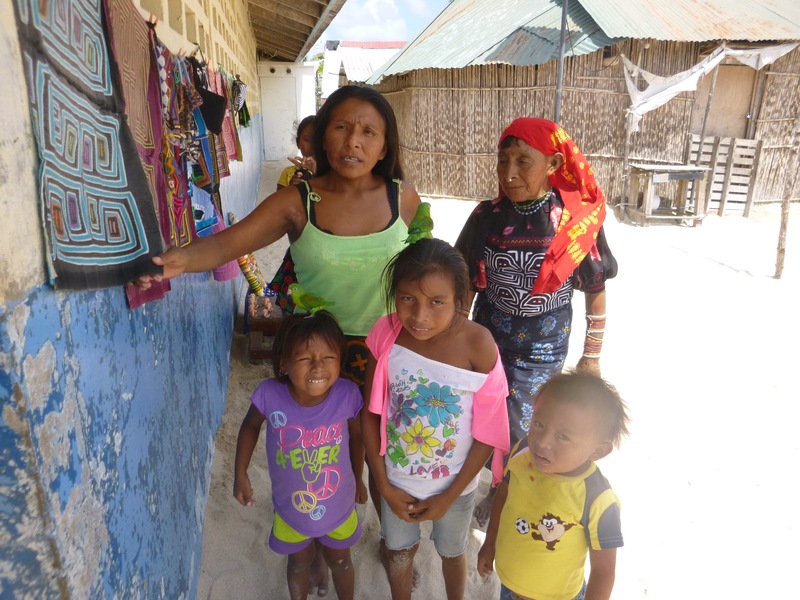 The population is around 12.7m most of whom are Roman Catholic and of Spanish or Mayan origin. 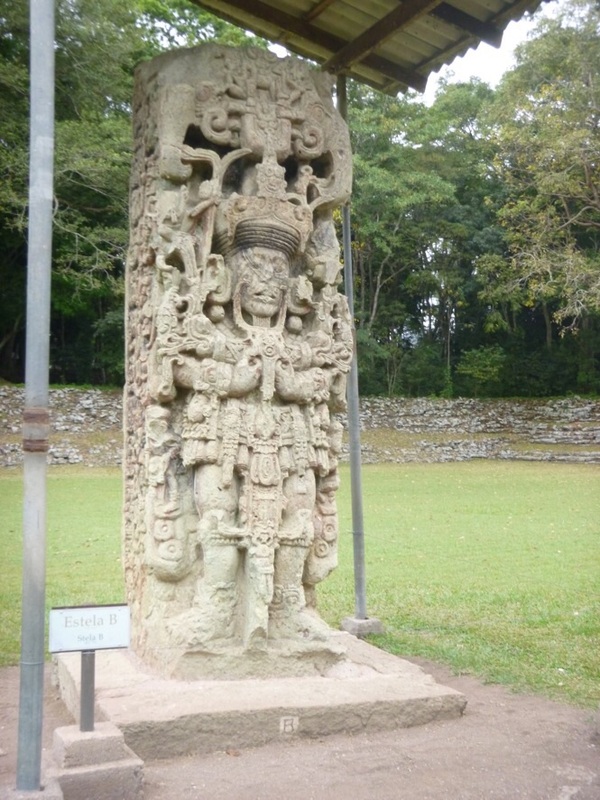 For centuries the Mayans ruled this whole region until the Spanish arrived in the 16th century and governed the region until 1881 when Guatemala, which means “Land of trees”, was given independence. Various dictators and military juntas ran the country for many years and in 1960 civil war broke out and around 200,000 people lost their lives; it’s only since 1996 that law and order has been re-established but still with a very heavy and obvious military presence. When Gill came back from the UK I went up to Guatemala City in the highlands from Rio Dulce to meet her with the plan that we would spend a week or so exploring the nearby town of Antigua which used to be the capitol of Guatemala until it was badly damaged by earthquakes in the 18th Century and Lake Atitlan reputed to be the most beautiful lake in the world. 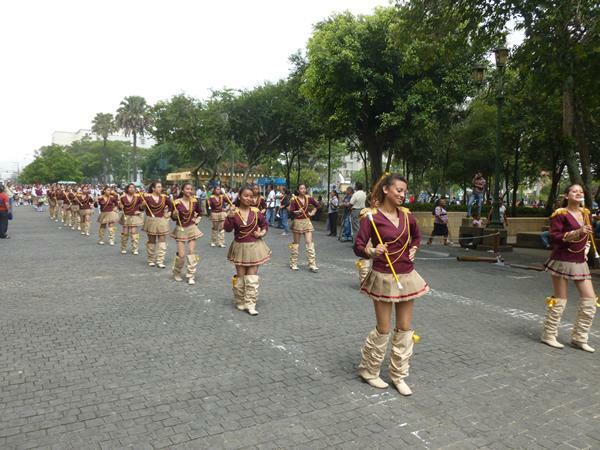 In Guatemala City (population 1m) it was Independence weekend when we visited and the main plaza was filled with marching bands and cheering school children. 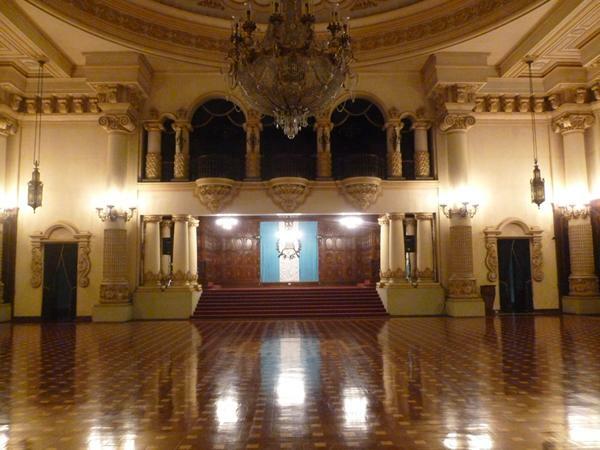 The next place we visited was the Cultural Palace, a huge building dominating the central plaza which was built in 1939 to celebrate the culture of Guatemala. Its an impressive building built with marble from Italy, chandeliers from Spain, stain glass windows made locally, gold leaf decorating the pillars and huge murals on the walls. 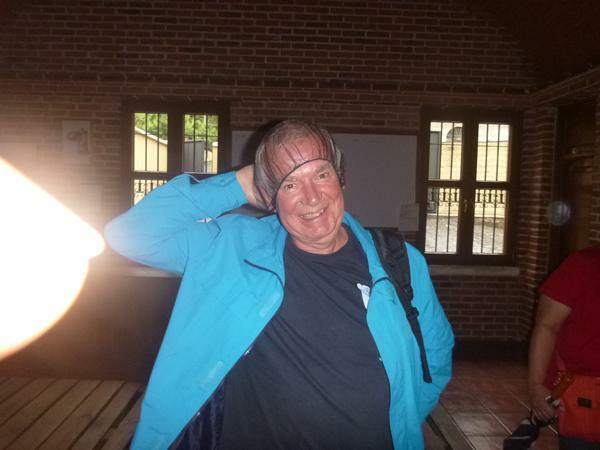 Fortunately we were given an English speaking guide who gave us the grand tour. 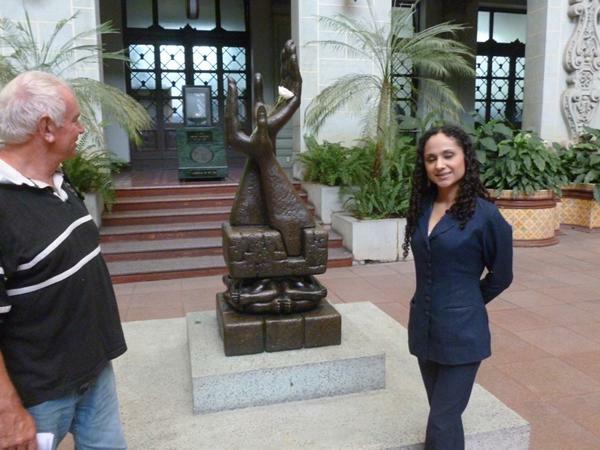 The sculpture below was created as a symbol to end of a long period of violence during their 36 year civil war and as reminder not to go back. The rose is white and replaced every day as a renewal of their determination. 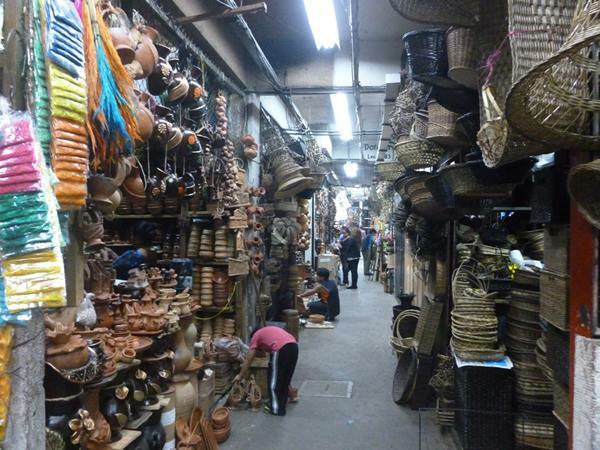 Afterwards we discovered a large underground market selling everything from food to clothes, leather goods and tourist toot! 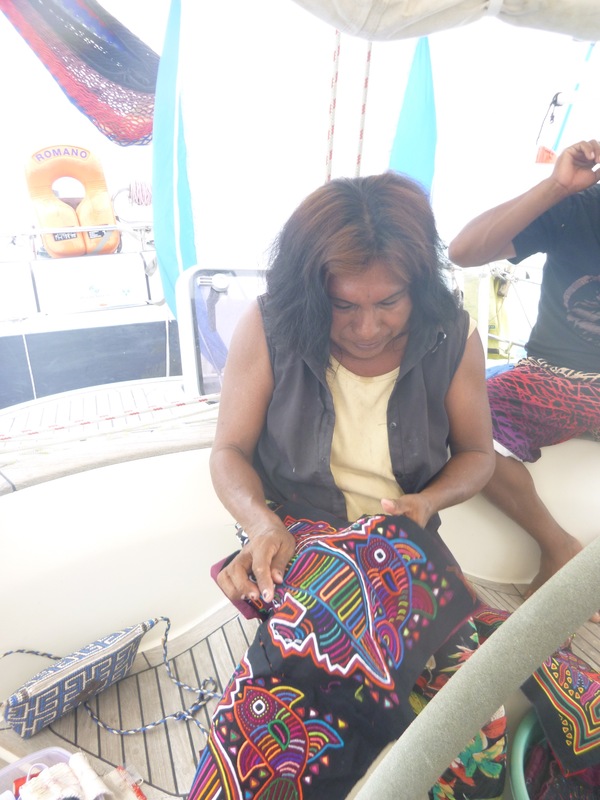 I bought some T shirts and baskets to keep loose items on the boat and then we had lunch at a market stall. 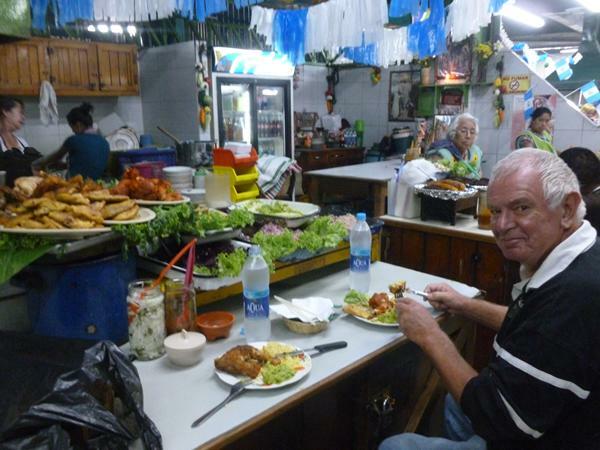 We had no idea what we ate but it tasted OK, as usual, the old lady grossly overcharged us in their terms but it was still only £5 equivalent –they think we’re rich gringos! 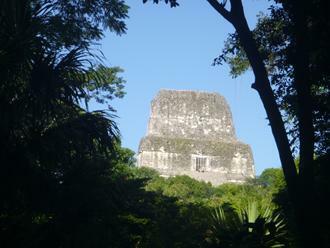 So, after a day exploring Guatemala City, we headed off on an hour’s drive to Antigua by taxi. We had intended using the famous “Chicken Buses” used by the locals but for two reasons we were advised against it and to use a taxi instead; firstly, this was the rainy season and the buses carried passenger’s luggage on the roof and secondly over one hundred bus drivers had been murder by local mobsters, in the last few years, who tried to extort protection money. If the drivers didn’t pay the gangs the bus was attacked and the driver killed and the passengers robbed – it wasn’t a hard decision to pay the extra for a taxi. 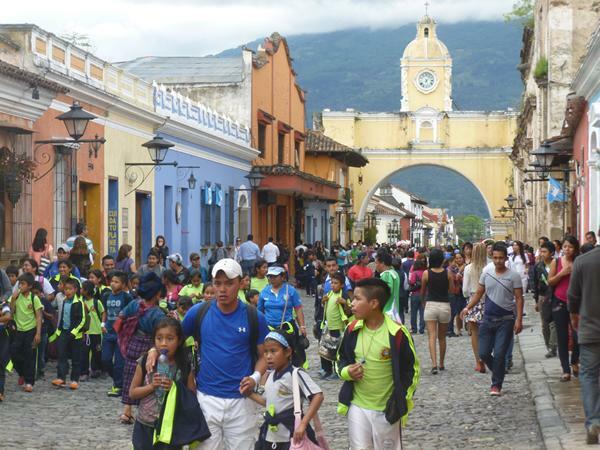 Antigua is the lovely old capitol of Guatemala, nestling amongst three volcanoes which dominate the views from the town, but they moved it to Guatemala City after several earthquakes devastated the town, in consequence all the buildings are only one or two storeys high. 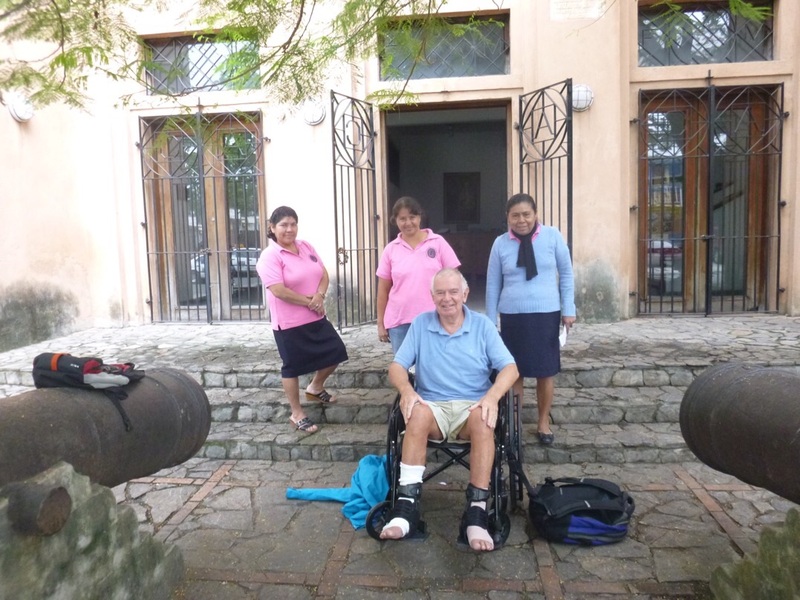 Our first task on arriving was to find the Posada where we were staying and after many attempts by the taxi driver we eventually found it by asking an electricity meter reader. Our welcome at Casa Alina, which was unprepossessing from the outside, was wonderful, we were ushered in to a beautiful courtyard home and on to to the spacious lounge where Alina and her sister made tea for us, almost unheard of in Guatemala which is coffee growing country and gave us their life history over a couple of hours. 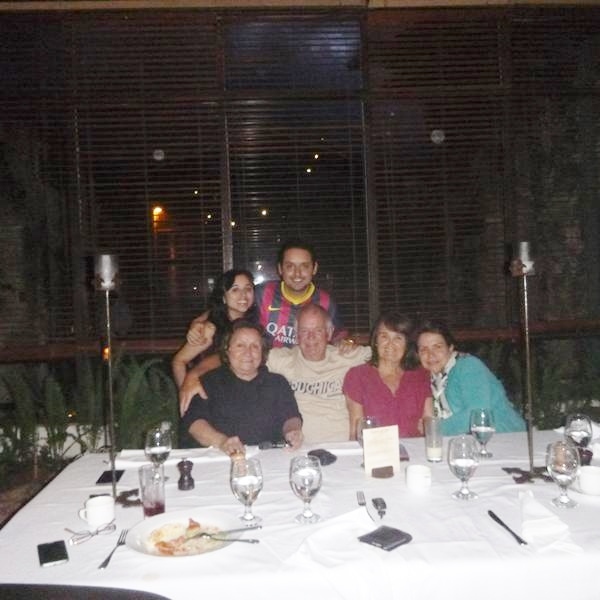 We were then, to our surprise, invited to dine with the family at a local restaurant which was a converted monastery that had been beautifully restored, serving traditional food from the locality and all you could eat. 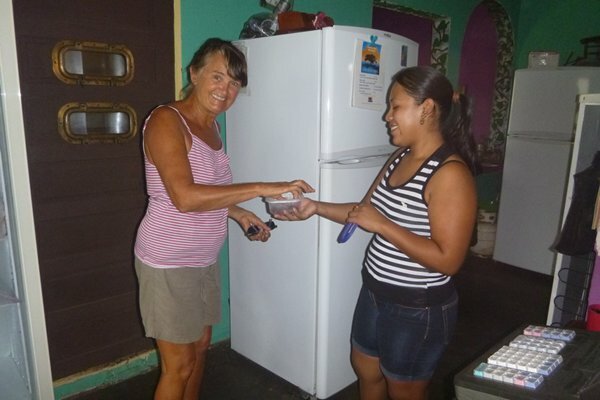 So here we were 3 hours in Antigua and being accepted as friends of Alina’s family. Her sister Lucy had been a much valued housekeeper to Lachlan Reed, a Scot living in America who had married into the Honeywell family and gone on to make his own fortune, Lucy was lovely but boy could she talk. They had had a brother but he was captured by the rebels in the civil war and held for ransom but before they could come up with the money he was killed. This was told to us in a very matter of fact way as though it was an everyday occurrence. 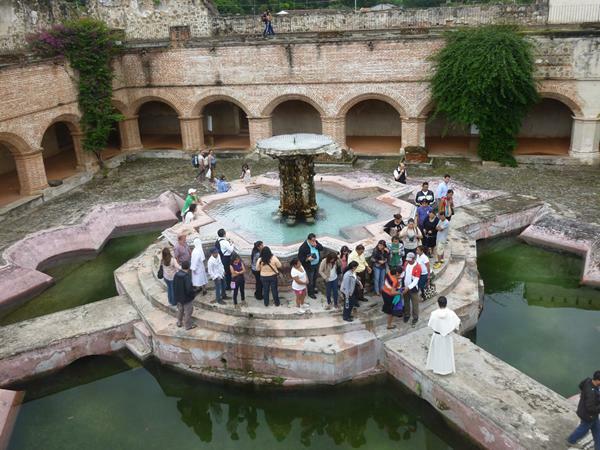 The photo below shows The Convent of Mercy which unusually only contained monks, around 100 of them, unfortunately its now in a state of disrepair but must have been a wonderful place when in good order. 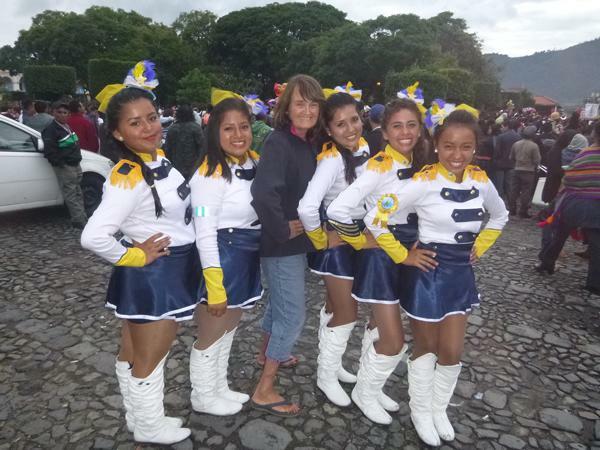 it happened to be “Independence Day” when we were there so we were treated to bands and drumming displays and fireworks, however after the first couple of hours the endless chain of marching bands and noise became a little wearing so we found another local restaurant to hide away. 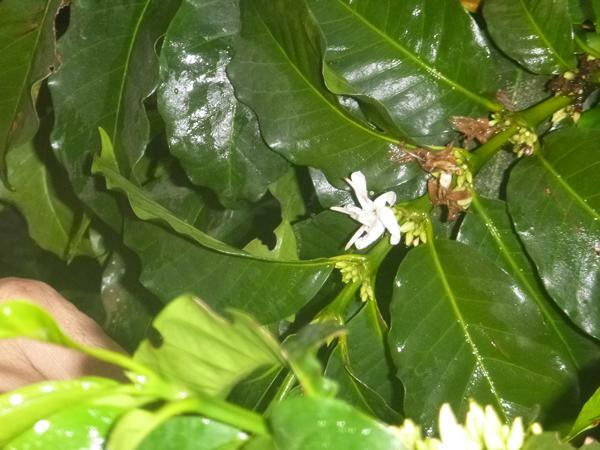 On the second day in Antigua we visited a 750 acre coffee plantation close to the town; coffee is one of Guatemala’s main exports and is now much sought after in the UK. 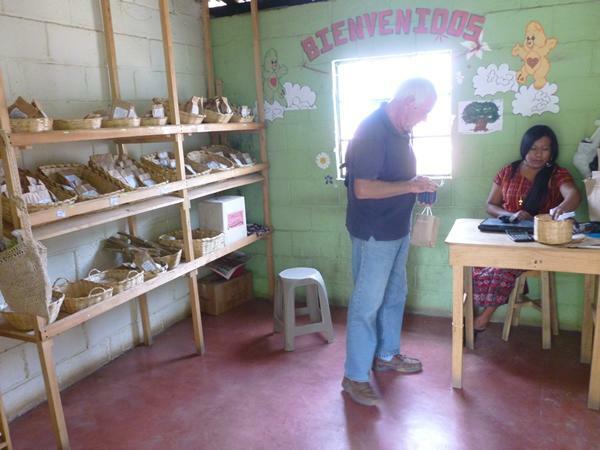 Our guide took us through the whole process, from the plant nursery, to growing the beans, the harvest, and the drying and roasting process. 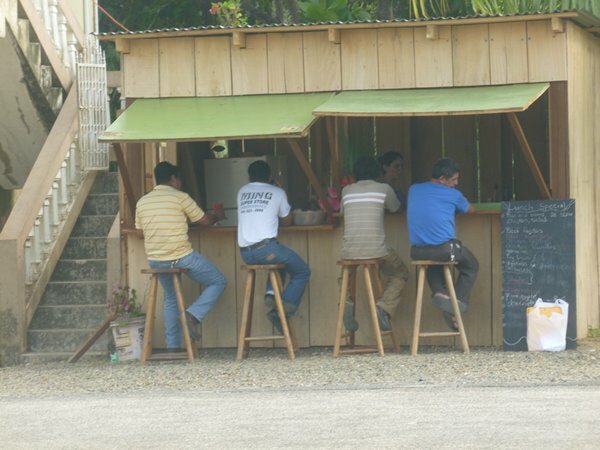 It was a great day and fascinating to see the complete thing from ground to cup and of course we had a little tasting afterwards and then back to Antigua in an army truck. We found a little restaurant which had all the dishes of local food displayed in big pots at the entrance with offers of tasters so you could choose which to have. 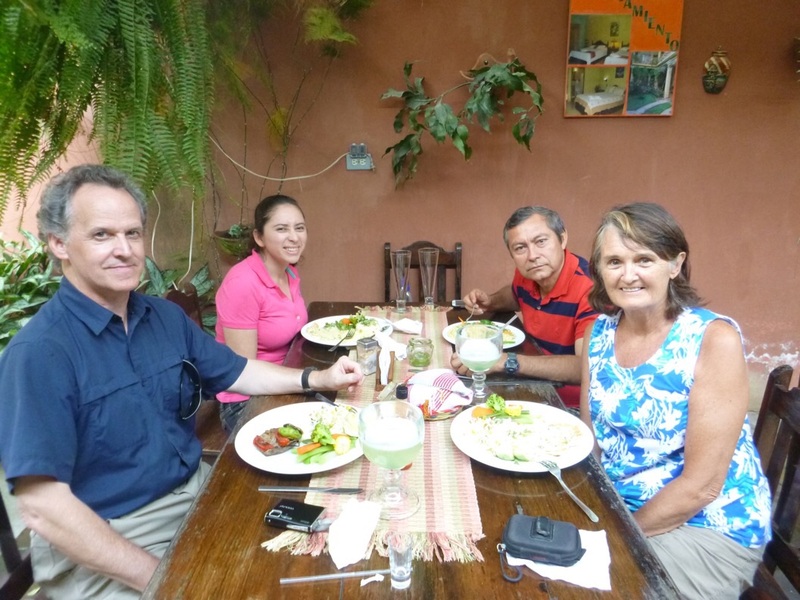 After the meal we left to cross town through a myriad of cobbled streets back to our Posada. Fortunately our combined navigation skills worked and we found home about half an hour later. 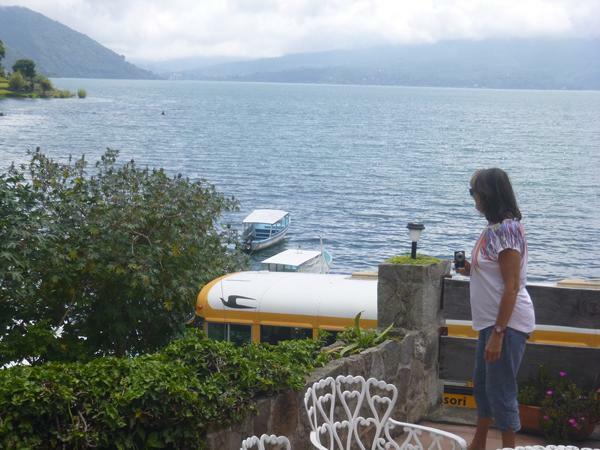 The following day we took our farewell from Alina and Lucy and set off by minibus with a young Chilean couple on a 150kmjourney to Lake Atitlan a further 1000 feet up in the mountains. The lake which sits at an altitude of 5100ft is also surrounded by three huge volcanoes one of which is live and these make a spectacular backdrop, especially when the lake is still and gives back the reflection of the mountains, it certainly deserves its reputation for beauty. 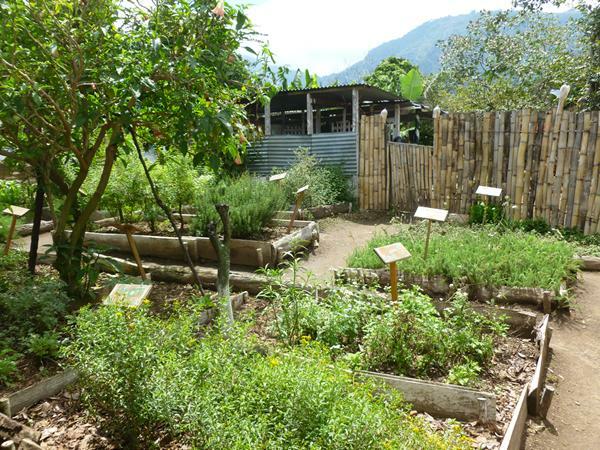 Our Posada – Los Encuentros, was in a town on the edge of the lake, called Panajachel and was unusual for its gardens which consisted almost entirely of edible or medicinal herbs and plants. The owner had written a book on their various medicinal properties, unfortunately his herbology skills weren’t matched by his people skills. 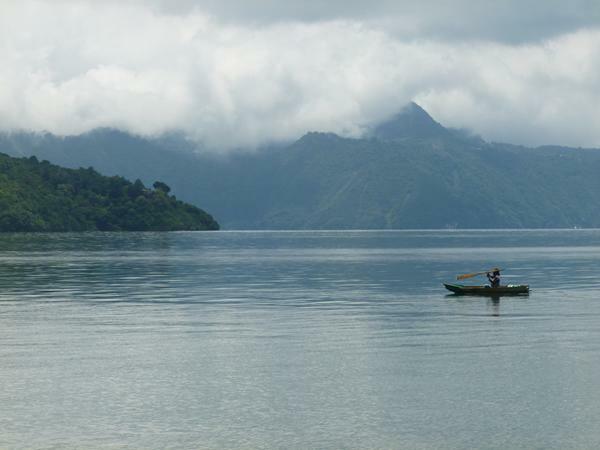 The following morning we set off on a launch/ferry across the lake to see the villages of San Pedro and San Juan. 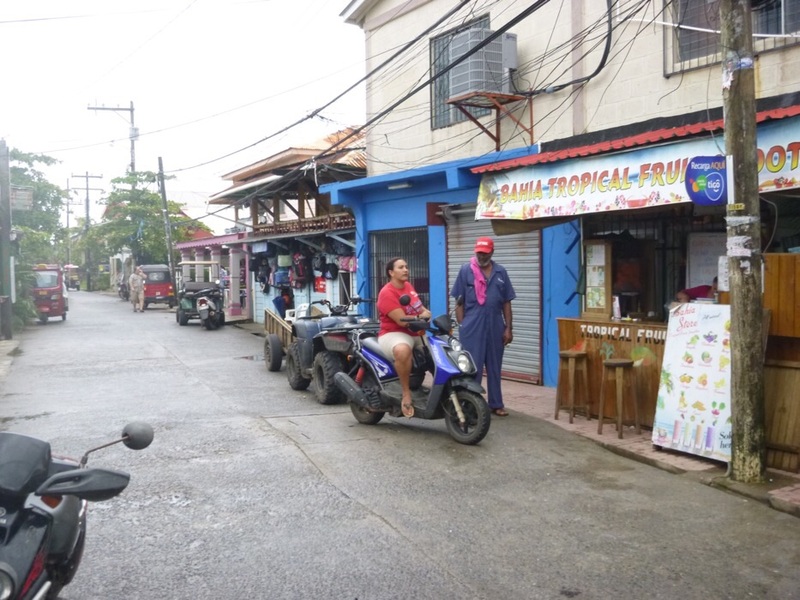 We took a tuc-tuc ( a three wheeled motor bike with a canopy) from San Pedro to San Juan where we had been told about a women’s co-operative which made textile products by the old and natural methods. The co-operative was started by a woman whose husband died and she had to find a means to support her six children so she and a few others set up a business which flourishes today and now employs 22 local women. The taxi driver said the men don’t do any work! 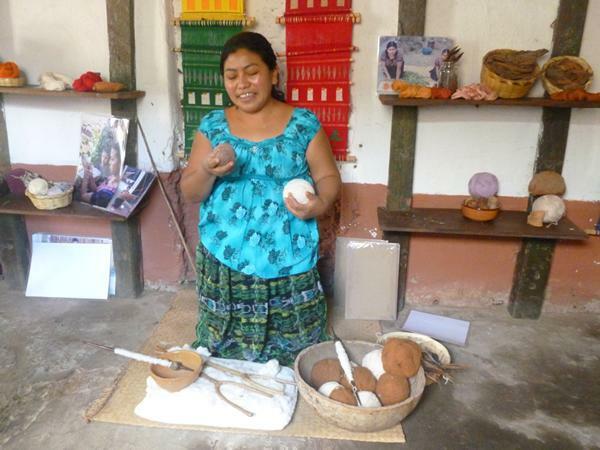 The process starts by growing cotton, picking the balls by hand, removing seeds and spinning these into a thread on a bobbin held by their feet. 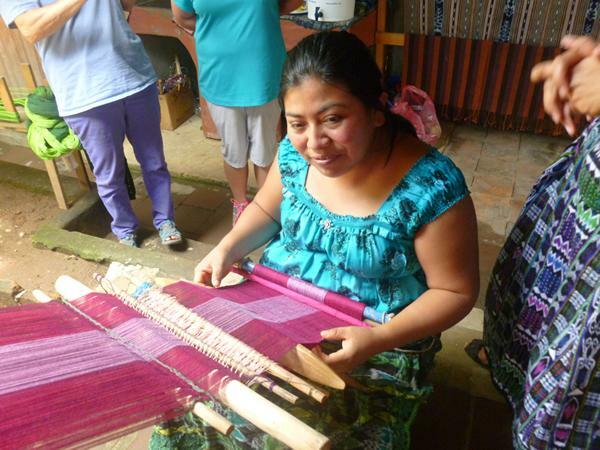 The dying process uses only natural plant dyes to produce rich vibrant colours which are collected by the women from the mountainside in order to preserve the delicate local ecology. 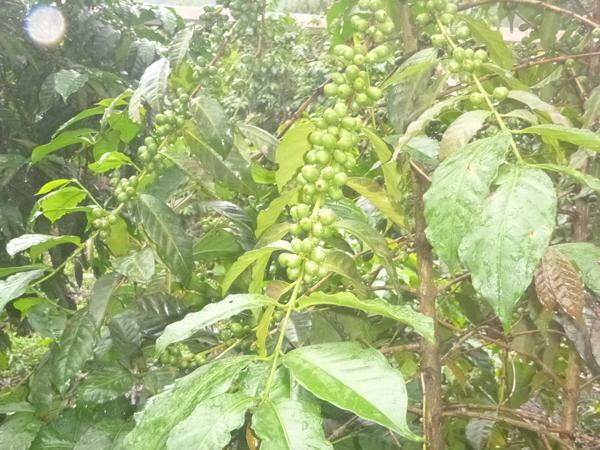 To give an idea they use such plants as, avocado, carrot, ocre, indigo, lobelia, beetroot and many others handed down from their Indian ancestors. The colours are then fixed using banana stalk extract. 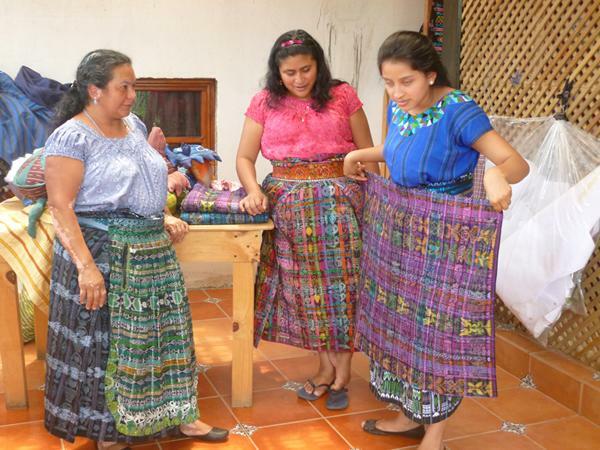 The result is stunning colours in the skirts, aprons, blouses and bags they then make from the dyed cotton as you can see from the photos. Just to make the collar on one cotton blouse takes one woman 1 month and the blouse sells for around £60.00 equivalent! 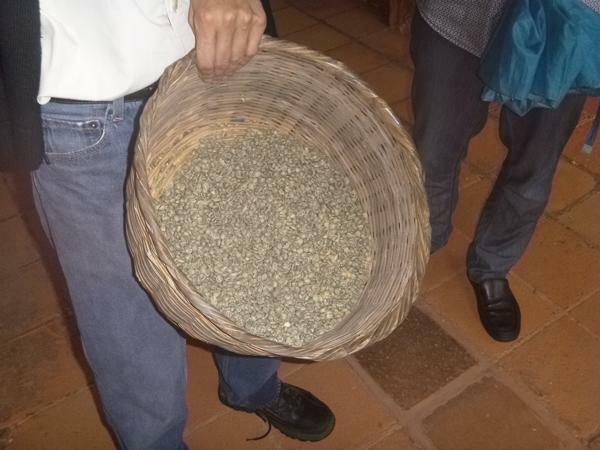 Still in San Juan we visited a business where they grew herbs for medicinal use and processed the products in-house. We bought some natural mosquito repellent (very necessary in this area) and some specialist teas. 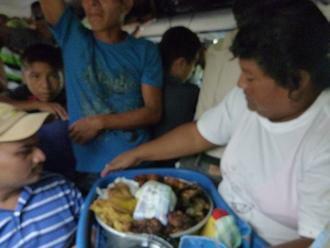 Then it was back to San Pedro by tuc-tuc for a spot of lunch. The driver took us to a place which was probably his sister’s but we had a nice lunch of local food overlooking the lake. 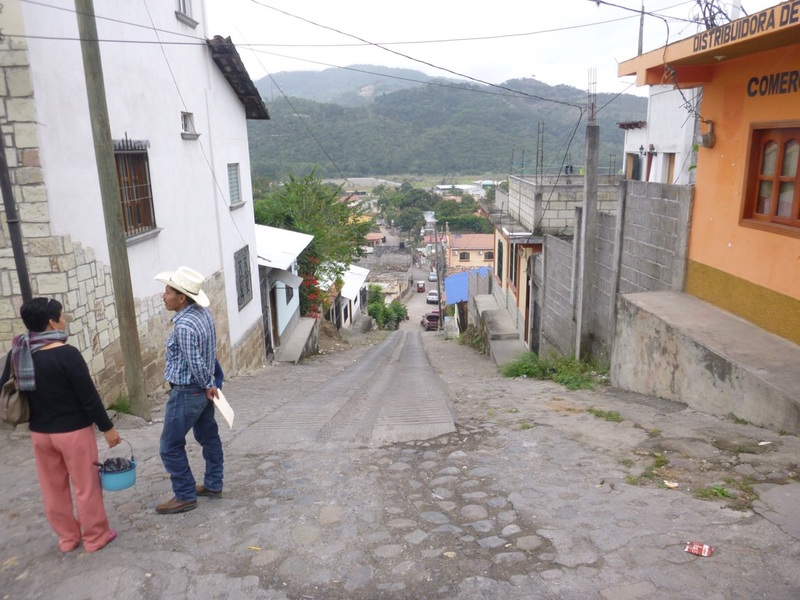 After lunch we took a launch to a village called San Marcos and walked into the town to explore a little. Apart from the school, some shops, a sports ground and a church there wasn’t much to see. The rain came on as we were waiting for our next boat connection so we huddled under the trees at the end of the pier with the locals until the local policeman came to tell us it was arriving. It took us down the lake in pouring rain with a tarpaulin over the passengers; the poor driver had to sit out in a sou’wester but wore the biggest of grins as though he didn’t have a care in the world. We went to eat in the main street after partaking of happy hour in the local bar which was offering two drinks for the price of one; well you couldn’t refuse could you! When we got back to the Posada we couldn’t get the key to work and no amount of hammering and ringing the bell for ten minutes raised anyone until I tried putting the key in upside down and hey presto we were in! The following day we decided as a bit of an adventure to take a local “collectivo” which is the bus service there, so called because it stops anywhere for anyone and they really pack them in. 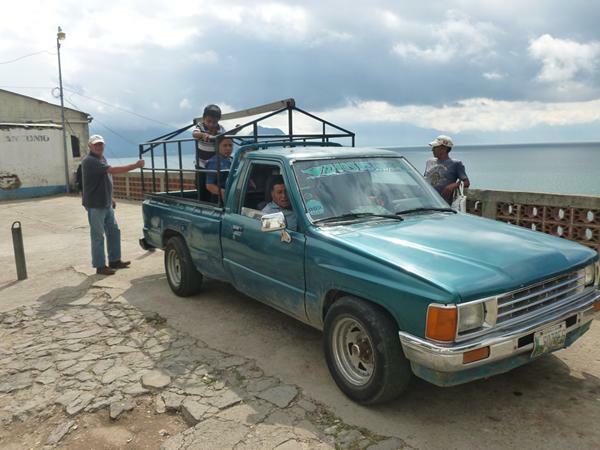 It’s basically a pickup truck with two benches in the open back but they loaded 22 passengers in ours. It is after all is said and done, a car, albeit a Toyota made for eight at a push. 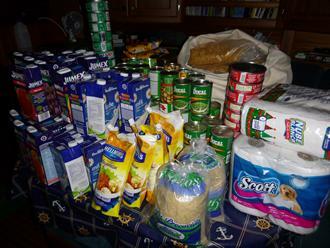 Our load also included cases, mail, boxes, baskets of fruit and kids but fortunately no animals or chickens. The luggage that doesn’t fit on the roof is piled on your lap if you’re lucky enough to have a seat. So off we went bumping our way over twisty mountain roads to Santa Caterina, a small village on the south side of the lake which has a few shops where Gill expertly haggled for a handbag which cost her less than £4.00 at the end and the village had a pretty quay side where interconnecting launches came in. We moved on to San Antonio, the next town around the lake in another collectivo. Here we were “picked up” as we got off the pickup by a young women who showed us around the town and with her we visited the local pottery business, had to buy a dish of course and then on to a lovely restaurant overlooking the bay where the owner (probably her Dad) persuaded me to try one of his litre bottles of beer, it’s very hard to resist offers like that, well for me anyway! 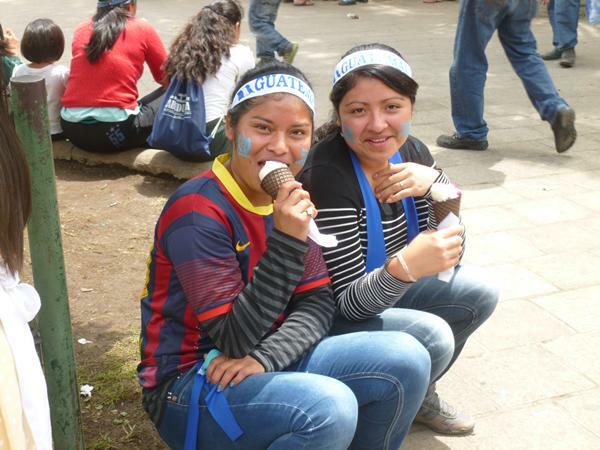 We then took the collectivo back to Panajachel and for dinner and bed. In the morning we headed back to Guatemala city via Antigua, about a 3 hour drive in a minibus with a young Israeli couple. 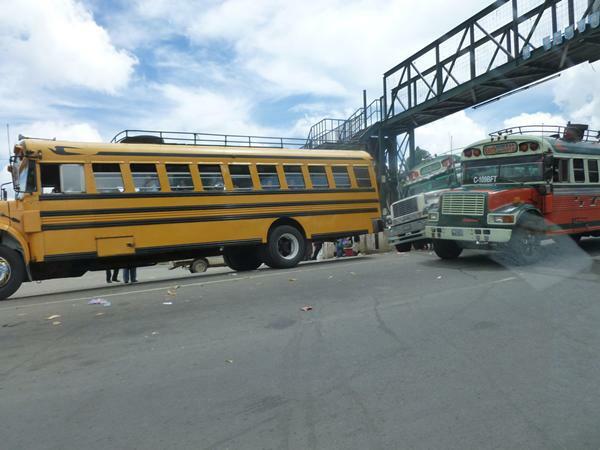 At Antigua we had to switch to a taxi because there were riots in Guatemala City and we needed a local driver to find the way around the problem areas. Before we left Guatemala City to travel up to Antigua the 1* hotel we were staying wanted 5$ a day to store Gills suitcase so we booked into the 4* Radisson for less overall cost as there was no charge for leaving the case, so we were delighted to come back to a luxurious suite and still for only $60. The bed was the comfiest we have had for months and we shopped and bought our own breakfast feast for another $5.00 all in all a good result! 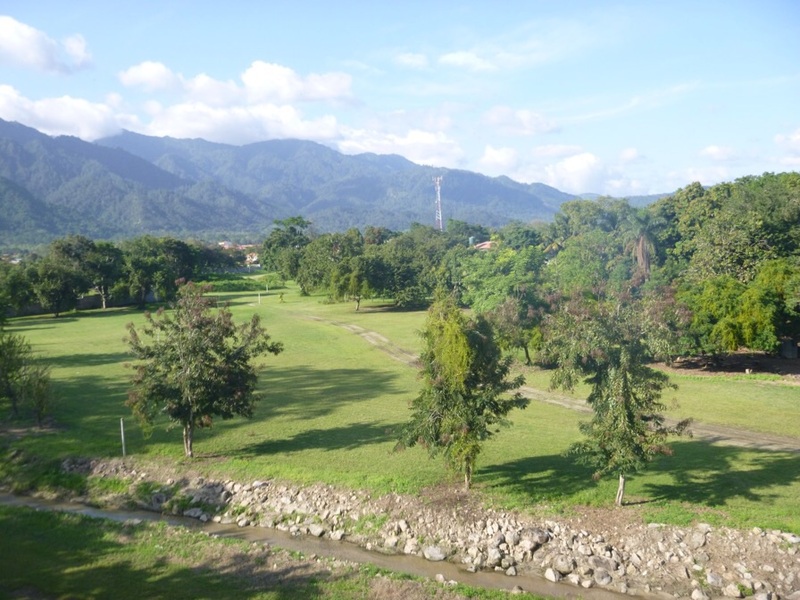 We came back to the Rio Dulce by coach on a 6 hour trip and got off the air-conditioned bus to be met by a blast of heat after the cool highlands. You can understand why most of the population live up there in the cool. After 2 minutes we were drenched with sweat – aahh its good to be back! So now we are installed back on the boat and sanding and varnishing and getting equipment added which we will need next year’s trip across the Pacific. Once the pressure of this work is off we intend to visit other parts of this beautiful, friendly and interesting country. 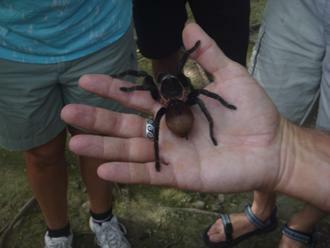 This will be covered in Part 2 of Exploring Guatemala. Having reluctantly resigned ourselves to the extra two weeks’ wait, we were then anxious to go at the next high tide – but fate stepped in once more and two days prior to leaving (and following our farewell party) the fridge packed up – a new compressor followed, plus the brand new state of the art alternator went phut on first firing. Obviously someone was trying to tell us something!! Plus to cap it all we both went down with virulent tummy bugs (dose of both salmonella and amoeba for good measure), not good sailing companions; so, another wait for yet another new alternator and the next high tide. The second new alternator duly arrived, Roger the “electrical whizz” came to fit it – nothing straight forward of course and his “does this wire go here or there” didn’t inspire much confidence in the outcome – rightly so as it turned out. 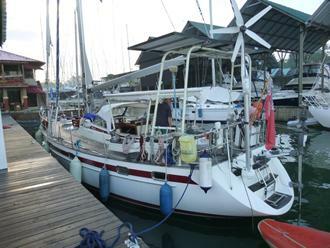 Sure enough, we left the Rio Dulce (engine sounded good) and headed for Livingston where we checked out (Mike was only two weeks over the permitted 90 days, a mere trifle here after paying the fine of Q10 per day) and we psyched ourselves up at 6.0pm to hopefully sail unhindered over that dreaded bar – the engine had other ideas though and not a peep was to be heard. 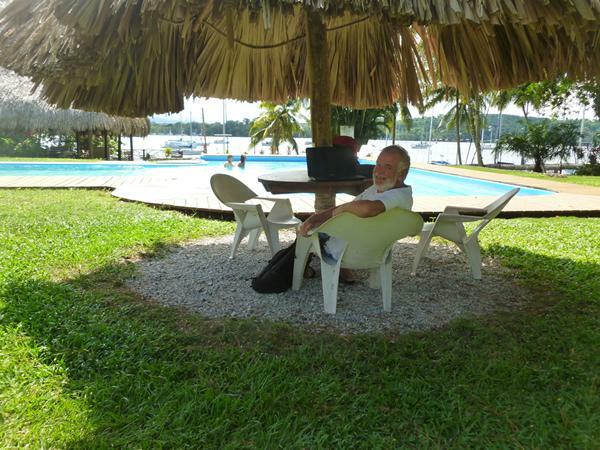 Roger remained calm and reassuring when an ever so slightly irate Mike requested the pleasure of his company here in Livingston (an hour down the river by high speed lancha). As I write this and following Roger’s visit today, we have everything crossed that the engine will perform when the time comes to set out this evening, just one more day late and exactly a month after we first tried to leave. When we look back, the amount of work completed on Romano has been enormous and we have lived for months in a constant state of “work in progress”. It was, at least some relief to be able to escape the endless workmen and their projects onto the adjoining palapa area (a thatch covered communual space frequented by adults in their hammocks or working on various boat projects and children playing or heads down with mum doing their school work. This was the hub of our social centre and a great meeting place where there was always someone to talk to and Saturday evenings turned into the social event of the week with everyone bringing something to share. 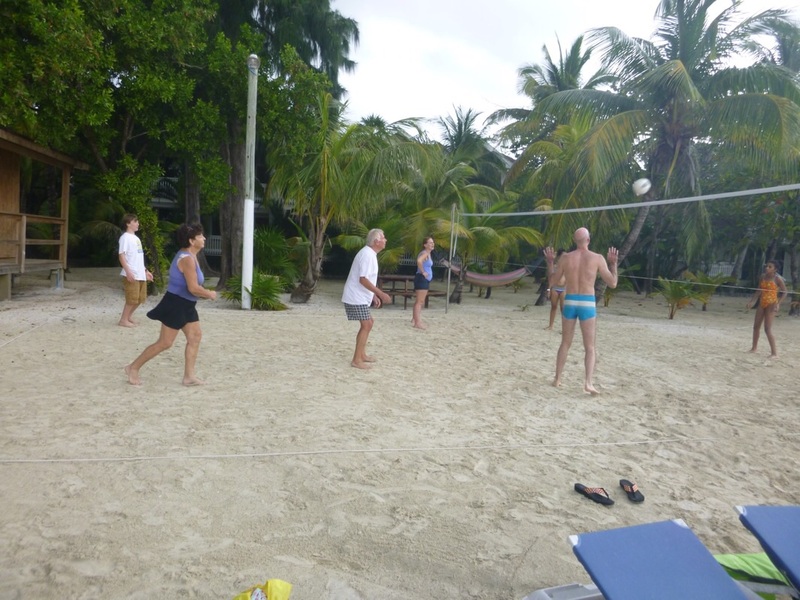 Many new friendships were forged and the mix of French, Australian and us, which started somewhat hesitantly with some language difficulties, gradually evolved into a closeknit and interesting community. Audrey (delightful young French mum) who arrived in May with virtually no English now speaks the language like a native and Ella (15 year old Australian with no background in languages) is becoming proficient in both English and Spanish. The children who have all become firm friends prattle away together without any problems, of course. 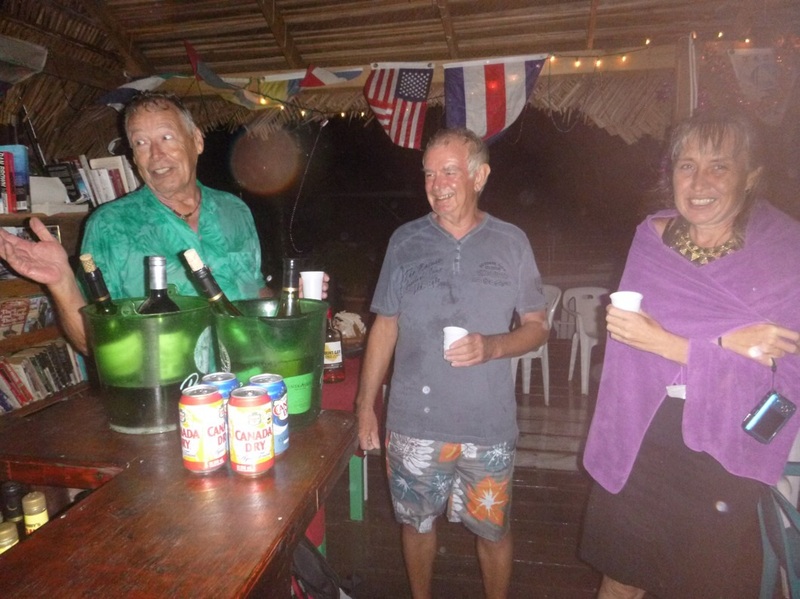 I mentioned our farewell party which was held on a really grotty evening with heavy rain just before one of our planned departure dates. All turned out to say goodbye to us, including some newcomers we hadn’t even met before and it was a sad evening with a few tears and even presents from the children. One occurrence not to be forgotten is Mike’s unscheduled swim when he disappeared for a while and although he was vaguely noticed like some sort of large water rat climbing up the back of a boat out of the water right opposite the festivities, Nick the Australian owner remarked in his usual laidback way “well, yeh, I thought I saw you coming up out of the water onto my boat” but he obviously didn’t think that was anything remarkable or worth mentioning. Mike had slipped off the plank which only reached halfway to our boat (a hazardous access at the best of times) and weighed down by waterproof jacket etc had problems finding an exit from the water – and nobody heard his cries for help! Not only had he got a soaking but to crown it all nobody even noticed!! Gill doing the washing as the men fixed up the boat! 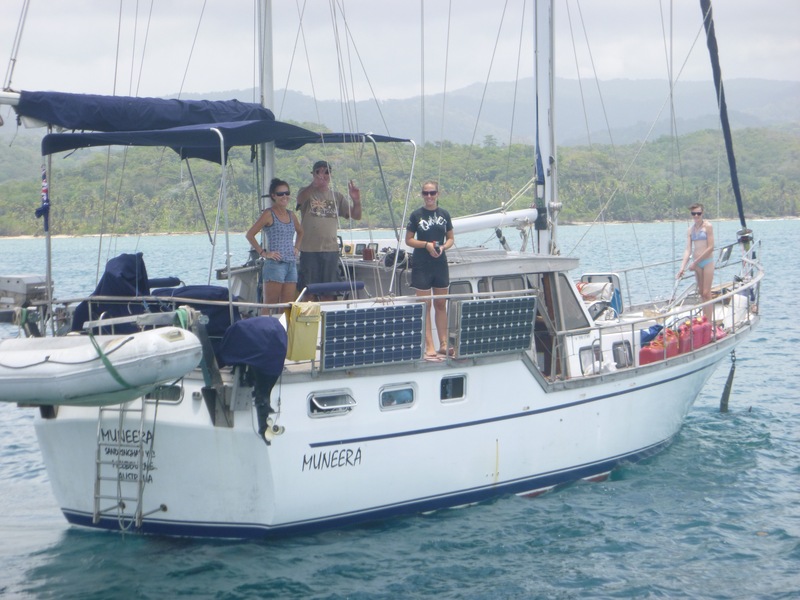 The biggest projects on the boat were without doubt the adding of a new bimini and the gantry for the two huge solar panels (which so far are exceeding expectations and producing enough energy to keep up with the power hungry fridge and freezer). Mike finally settled on Carlos the Welder as the manufacturer and installer of the metalwork (aluminium) despite Carlos’ rather dubious reputation as not the most reliable craftsman in town. As it turned out, Carlos did a brilliant job and produced everything asked of him including some folding steps for me to be able to get back into the dinghy from the sea – not sure if he was amused or felt sorry for me when he heard that I had had to be dragged on a line for a mile or so because I couldn’t get back aboard after snorkelling. Whatever, he certainly had a soft spot for us – we hear many stories of others who are still waiting but he either likes you or he doesn’t!! 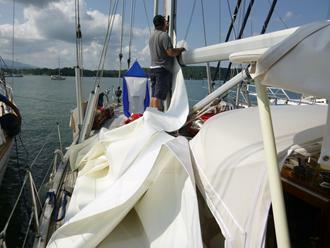 The list continues with a new mainsail (the old one was scathingly condemned by Luigi the Italian sail expert), the new bimini and sprayhood in cream (not very practical but so light! ), with many new projects in wood, both inside and out, including beautifully varnished boxes to hold the extra diesel containers on deck, a very useful box/extra seat which clips to the table and so the list goes on. The cockpit sparkles with its new varnish, two windscoops (they would be the dearest in existence if I calculated the amount of time taken to make them by hand!) funnel the breeze down into the boat and Mike successfully located a new gas regulator to give us a cooker temperature other than hand warm. 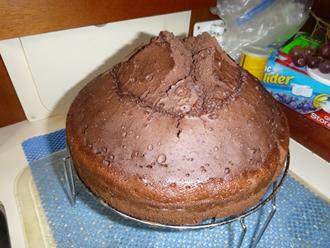 Now we can even make bread, and as discovered today, the pressure cooker makes very good cakes! We’re in business!! The proof and it was good – mmmm! 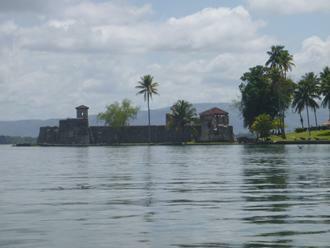 We did manage a day out in the dinghy up to Castillo San Felippe, about two miles up river from our marina. 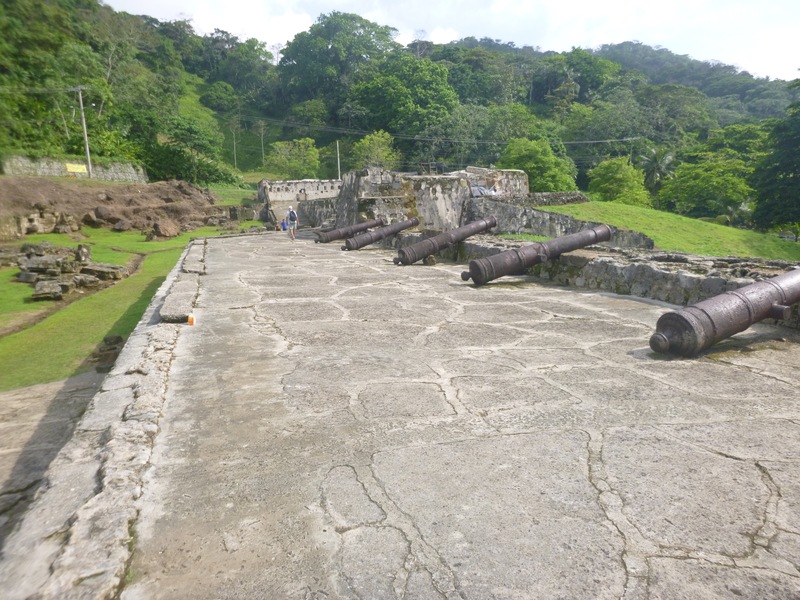 It was a glorious day as the photos show and the Castillo which had been built in 1500 by the Spanish to keep out pirates and of course the British who used to turn up regularly to steal the gold from the ships moored in the lake. 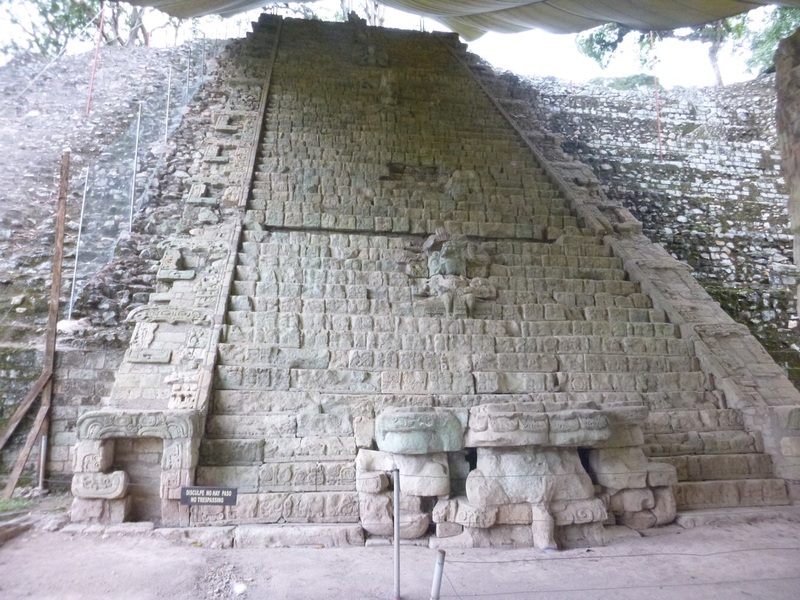 During November we organised a few days away from the work site and headed north with Annie and Liam (Australian friends) to explore Tikal (one of the most important Mayan sites in this whole area). We set off with expectation and a cheap ticket on the Publico bus, only to find that the bus was already full when we joined it in Fronteras – well, full by our standards! 45 Persons is just the beginning with more standing than sitting and just when you think you can’t be expected to cram anymore aboard, there’s another shove and another few are added – they don’t seem to turn anyone away! The prospect of 4 and half hours standing whilst the driver throws the vehicle around the bends and in and out of the potholes whilst conducting an ongoing mobile phone conversation and eating his lunch at the same time wasn’t one to fill us with happy anticipation. I was the lucky one as a young woman offered me her seat after an hour of trying to perch on a narrow arm and I travelled in luxury – not so the others. To our amazement the bus stopped at one point to allow a rather portly lady with her basket of food on her head and her sidekick with a bucket of drinks to board and move into the bus – how is still a mystery – to sell a mixture of hot food (sandwiches would have been too easy!) to the passengers – all passed from hand to hand to the back of the bus. 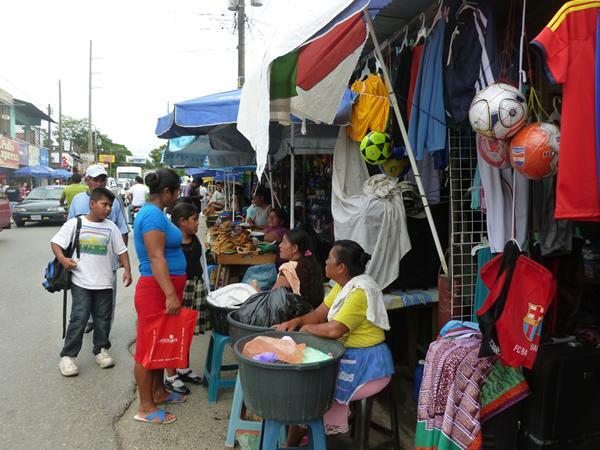 We spent an hour or so in Flores (a quaint little island on Lake Peten to explore the cobbled streets and were sorry we wouldn’t be able to return that evening to join in the festivities of the Christmas tree lighting. 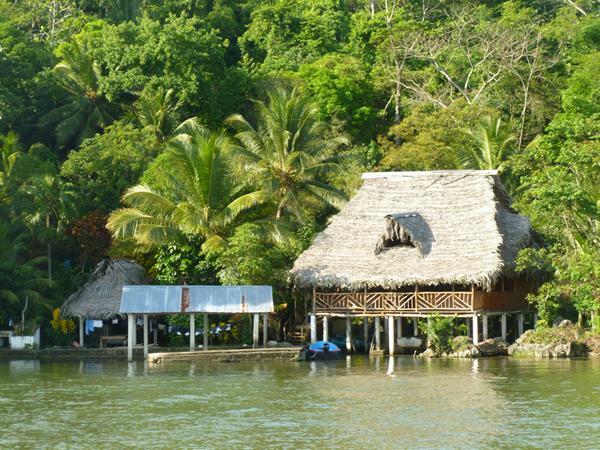 We had booked ourselves into a little French run hotel further along the lake at El Remate – half way to Tikal. 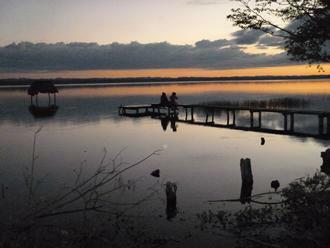 The Mon Ami was certainly situated in the most picturesque spot right on the edge of Lake Peten and afforded us the most spectacular sunset as well as a wonderful swim in clear warm water surrounded by tiny fish. 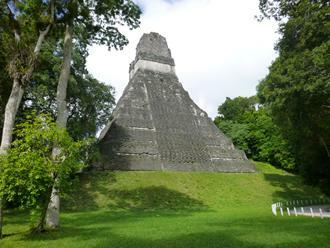 We had opted to take the very early morning tour to Tikal leaving at 4.00am with the idea of arriving to catch the dawn, hear the howler monkeys in full voice, enjoy the dawn chorus, as well as experience the rising sun as it emerged eerily out of the swirling early morning mists. 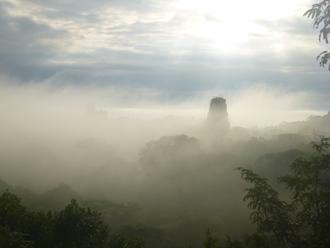 We did eventually see the sun and waited quite some time to catch sight of the various monuments floating out of the shrouding mists. 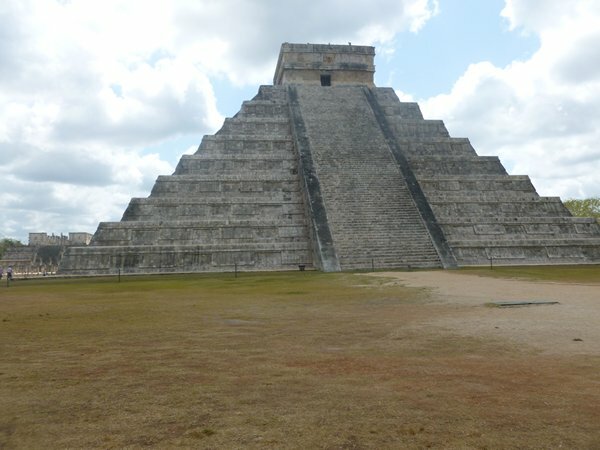 The monuments were as impressive as any we have seen in this part of the world, more so than Mexico which has inevitably become overly commercialised and we were able to climb as many as we had the energy for! I must say that by 10am we felt we had already done a day’s hard labour. 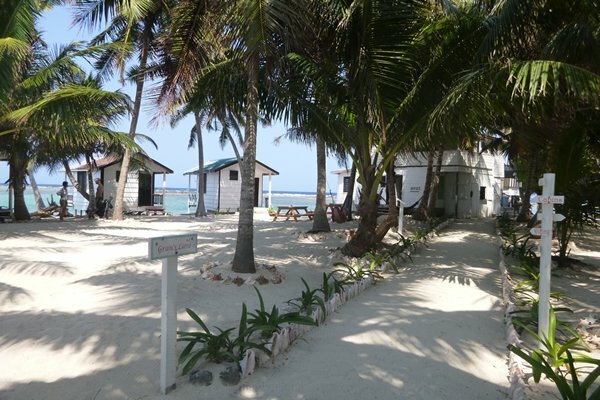 With the intention of spending two to three months in the San Blas islands, where we understand provisions are non-existent, we shopped to accommodate this with Mike declaring at every sortie that “there’s nowhere to put it”! Ah, but there always is! 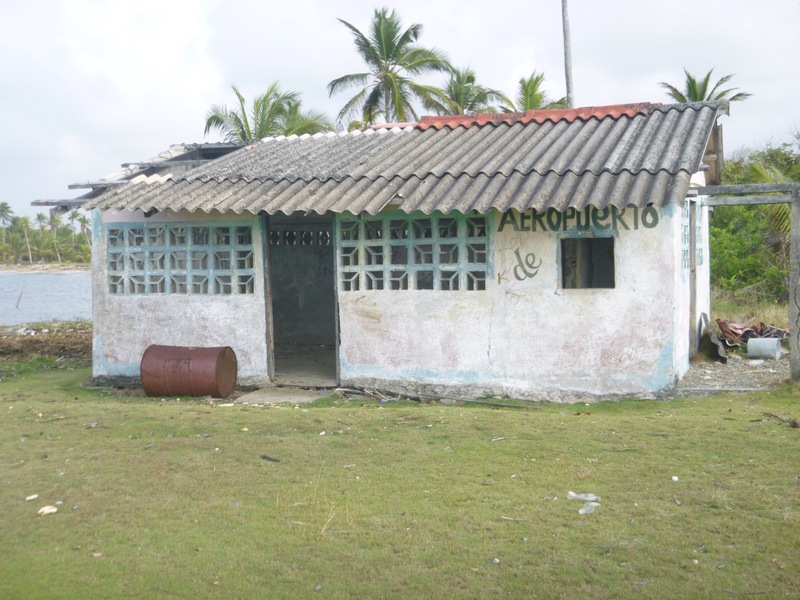 We had thought that we were to be joined by friends in the San Blas (not now coming) so we allowed for four including meat ready frozen for us in suitable four-sized packets. Upon collection of the meat, we saw with horror what amounted to a mammoth stack of boxes, all for us. I must admit this time I had rather overestimated the size of our freezer and we had to prevail on friends to take the surplus which we then cooked up for the farewell party, so it didn’t go to waste. From tins of everything, to toilet paper, to the occasional box of wine, we’re set for the next few months. The saloon table laden with provisions – but where to put them? 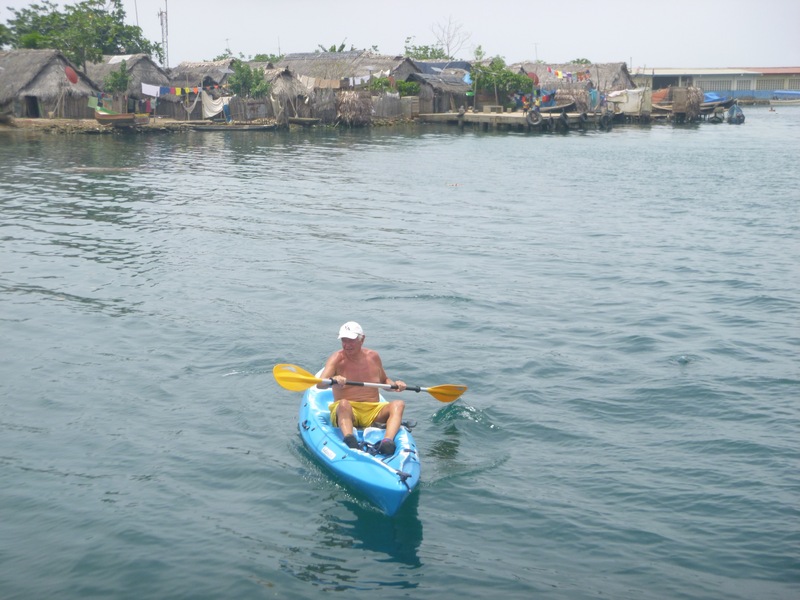 After six months in this part of the world, we have so many memories to draw on and so many new and valued friends, most of whom we hope to meet again in the San Blas Islands or when we congregate to go through the Panama Canal as most of us intend to. 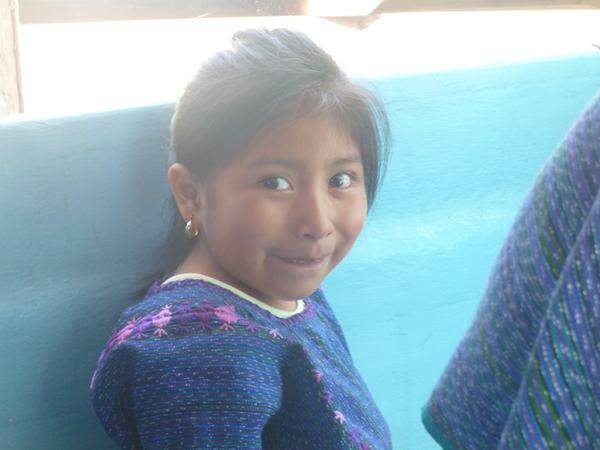 As one of the young girls said to me with tears in her eyes as we left, “it’s like saying goodbye to family”. We have lived next door to one another and been part of each other’s lives for a brief but intense period. I shall miss the constant drone of the heavy traffic labouring its way over the bridge (the same bridge that a number of the younger crowd jumped from on the end of a rope and not entirely without incident either). 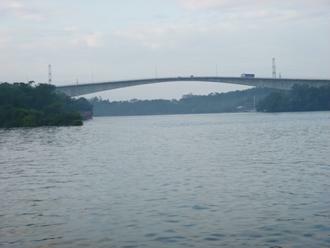 The not so low bridge – some folks are barking mad! 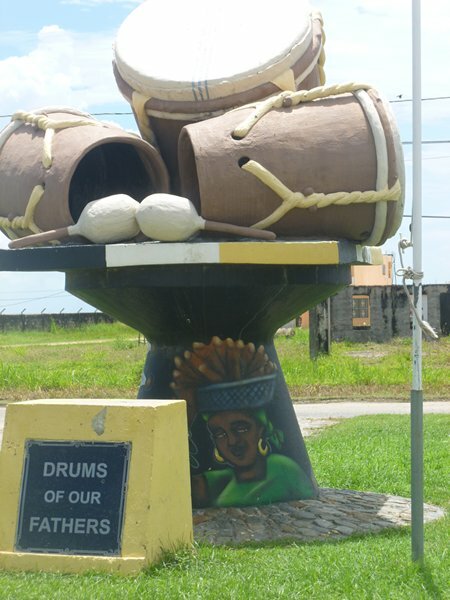 You soon forget to marvel at the beautiful scenery and area in which we have been living, the distant mountains, the lush vegetation, the river and its ongoing life of fishermen in their canoes, the myriad of birds. 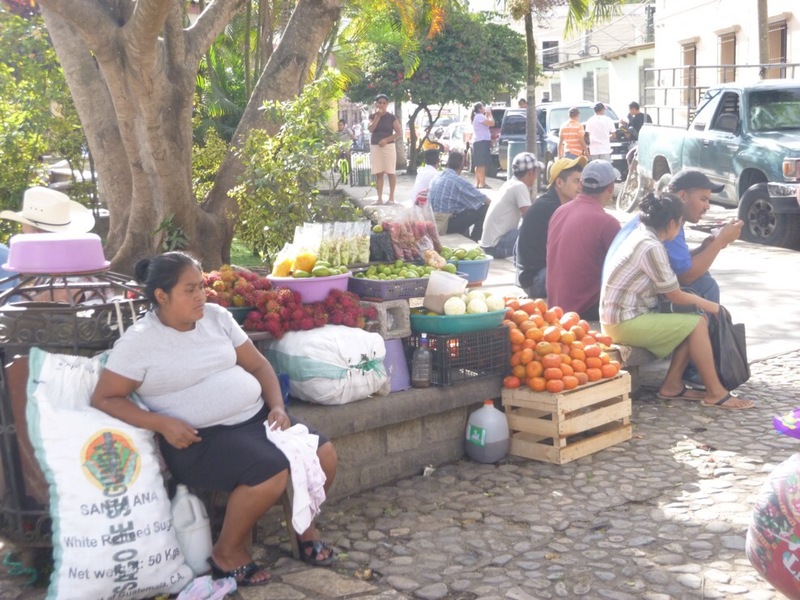 We have been spoilt by the wonderful and abundant fruit and vegetables, the colourful and interesting local peoples and the opportunity to explore a little of this beautiful and dramatic country – thank you Guatemala, we have loved being here. Honduras here we come! 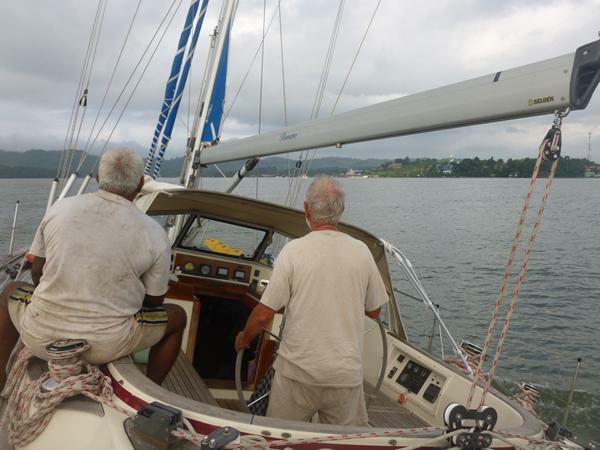 Addendum: Yes, we did get away finally but not without more dramas – Roger’s fixing wasn’t fixed and Mike had to jump start the engine (a loose connection is suspected) and the high tide wasn’t as high as we had thought!! 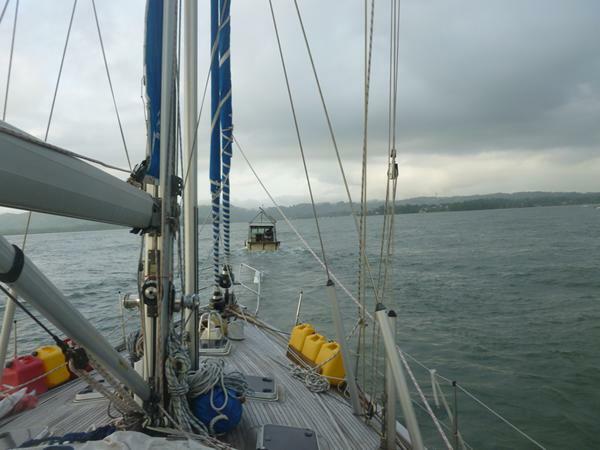 We spent the night rocking gently in the mud of the estuary after gunning through the first half of the sandbar. Hector, the local fisherman who had dragged us in in May, was prevailed on for the fee of $50 to come to our rescue at 6 am after his night out fishing and we were dragged out sideways. Sounds like another dose of gel coat to the keel. 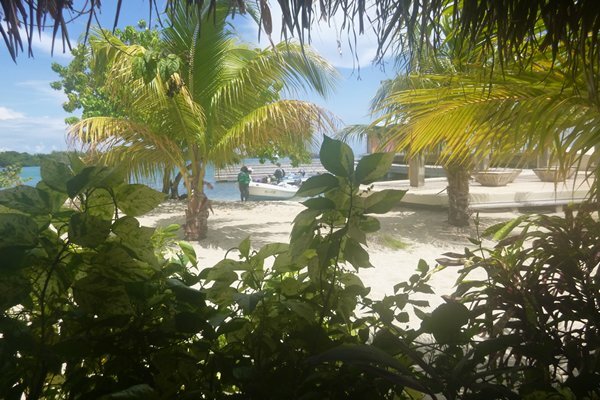 We are now safely in Utila (Bay Islands, Honduras) and further news about this part of the world will follow in due course.